Comments can be sent to us via e-mail to rex@schildhouse.com. Stupid mistake. I recurringly save my backup copies to my hard drive by date. I had Dreamweaver open and my latest two backup files open in Notepad at one time. Something happened and the computer asked me if I wanted to save my changes. I selected "Yes", the computer whizzed, whirled, and then shut down. I lost three files in the process. My Dreamweaver file and the two backup files became blank documents for my Gluten-free page. So this is a reconstruction as best I can starting on July 7, 2016. Some comments are dated July 7, 2016 and identified as "Post Crash" since they are memories not immediately associated with the product experience. With the number of snacks and candies I have moved all snackes and candies to their own homepage at Schildhouse Gluten-free Snacks and Candies Files. This hyperlink will take you there. Celiac Sprue - What is it? First, an item that cannot be passed over lightly - Autism. It has been the subject of several studies. If those that are affected by autism are put on a gluten-free diet many of the undesirable behaviors are significantly reduced. ALL IN LAYMAN'S TERMS, I am not a doctor or a medical professional. I am a "winner" in the Celiac Sprue lottery. I am just telling you my story here and a little more. 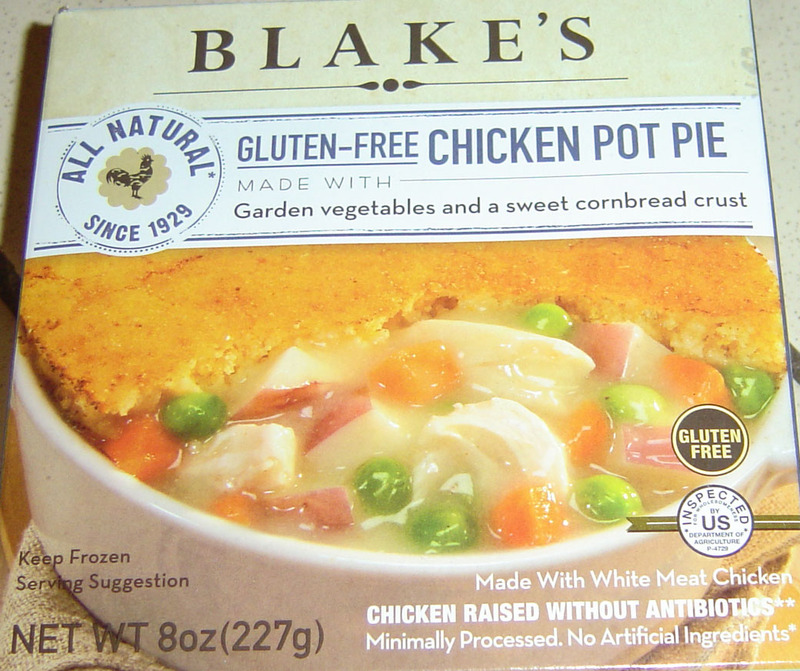 I will never forget Dr. Dan Jones, Intern at the Department of Veterans Affairs Medical Center in LaJolla / San Diego when he told me one night about ten years ago "I think you have Celiac Sprue." I responded with "What is Celiac Sprue?" He retorted with "An allergy to gluten." I rebounded with "What is gluten?" Silence followed Doctor Dan's response of "An enzyme in wheat, rye, and barley among other things." I knew that wheat flour was a major element in my diet along with rye and barley. Two blood tests later and one very interesting "down the throat with a camera gizmo" test and it was confirmed, I had the grand prize in the Celiac Sprue lottery. I had CELIAC SPRUE and it was ACTIVE. NOW WHAT?Research. Before we go any further, you will not die from Celiac Sprue but since it does compromise your health it opens the door for other things to complicate your life. The sooner you begin a gluten-free diet the better you will live. Celiac Sprue or Celiac disease is an autoimmune disorder that can affect anyone at any age that has either of three (by the latest information) genes in their DNA make up. These genes are HLA DR3-DQ2, DR4-DQ8, or DR5/7 DQ2. All of theses genes are "given" to you during your "creation" so this is one you can blame on your parents. It also means that the least one of your parents is a winner in the Celiac Sprue lottery. And you cannot have any of these genes if NEITHER of your parents has any of them. The fortunate thing is you can only have one of them. A simple, somewhat relatively expensive, blood test will tell you if you have any of the genes. That is part of the issue. A blood test will not tell you if the gene is active. And once active, it does not go to sleep again. The only way to find out if your little gene is active is to have a camera gizmo thingee with a tissue collector feature stuck down your throat and then have pictures and tissue samples of your digestive system taken. Results can be immediate - the pictures in severe cases are enough. In most cases they will wait for the tissue samples to be analyzed to confirm the diagnosis. While uncomfortable after a fasting night, the down the throat test is not painful and I was out for it anyways. So what activates it? For some it is active at birth. For others a hormone change such as any of the "changes of life" in males or females may trigger it, and stress may trigger it. Once active it never gives up and retires, regardless of the Social Security Administration says about retirement age. You have it, it is active, it will be active til you are "no longer an active participant in the game of life." As an autoimmune disease, the body literally attacks itself. With any one of the genes active in your body your body reacts adversely to the wheat / rye / barley types of gluten in your digestive system. There are other forms of gluten and they will not set this response off. When the bad gluten is sensed in your digestive system your body produces some really unnecessary fluids and those fluids actually attack and damage the walls of your digestive system while the digestive system is trying to handle the gluten. This cripples your digestive system by scarring the walls of the digestive track reducing the benefit you get from eating foods regardless of whether they are good for you or not. Once the digestive system is damaged by this attack food will proceed through the system without being fully processed. The damage is long-term and may take months to recover from a single violation. If you have the gene and it is active and you are not gluten-free every violation of this allergy starts an internal battle you will lose and causes damage that takes a long time to repair. It is believed that there are three basic levels of this disease, "sensitive" being the lowest level, followed by "intolerant," and "allergic" being the highest. And Highly Allergic is how the Department of Veterans Affairs labeled me. However, it does not matter what your level is, there is only one solution - zero bad gluten. So what are the symptoms of Celiac Sprue and violating the gluten allergy? So widely varied among winners in the gluten-free lottery that most winners are misdiagnosed. First, if you have ANY digestive problems just outside your mouth through to just outside the "exit" think about going gluten-free. Migraines, joint pain, depreciation, sleepless nights, and on and on and on. Here is a key - if you are not in perfect physical condition, suspect Celiac Sprue. Here is a cheap, somewhat effective, self administered test. Go gluten-free for a month and see what happens. This is not a "I can cheat today because I was good yesterday" test. There are some really interesting issues out there about gluten-free diets. For autistic individuals the level of hostility and anger are often significantly reduced. For infants there have been less development issues and quicker good weight gain which means maintaining a good height / weight / strength relationship. So what happens to me when I get glutenated? Depends on a lot of factors. One thing I will tell you is that the Magic Pink Drink does not help. Nothing but time cures it. I may have a severe upset stomach and a headache for a day or two or I may be going to the emergency room where I will frequently be admitted to the hospital for two or three days with IVs stuck in me to keep me hydrated. Once in that bad gluten is going to come out one way or another and most likely with high velocity and with little warning. So, if remaining at home, it is with a five gallon bucket next to the bed or next to the chair while watching television. If the bucket is not needed remember - DAB! Do not wipe. Here are a couple of catches in a gluten-free diet. Caramel is a frequent violator. Unless sure, stay away. Licorice is misunderstood and I cannot find a good, solid reference saying it is good. Most say it is questionable. The candy "Licorice" is 100% bad. Soy and Soy Sauce unless it specifically states "gluten-free" is bad. And I suspect some of the gluten-free soy sauce is not. 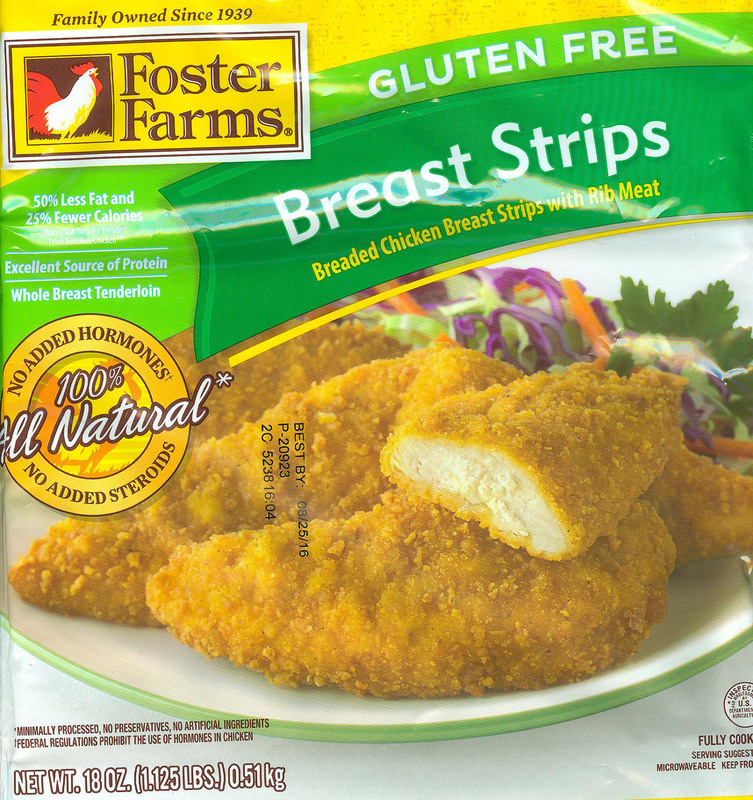 The USDA has new, as of late 2013, regulations regarding gluten-free labeling starting some time in 2014. Oatmeal has one ingredient - oats. The problem is the fields may be rotated plantings with wheat, rye, or barley left behind from previous plantings. Check with providing company as it may be cross contaminated. Why does it seem wheat is everywhere? Wheat is basically a tasteless, odorless, very tacky substance when wet. Hence "glue - ten." Take wheat flour, mix it with water and you have paste (glue). So wheat flour reduces the runniness of fluids such as drippings to make gravy. Wheat flour with water is a great paste to hold spices and seasonings to meats during marinating processes. Make bread out of wheat flour and you taste the contents - the peanut butter and jelly without interference from the bread. To make it taste they do add salt. Salt makes everything taste better it seems. And wheat flour is cheap with a long shelf life. The alternates to wheat are not cheap so your cost of eating will go up with Celiac Sprue. So, what am I going to tell you? I live a relatively normal life and so can you. I eat out fairly often and I have learned how to handle most restaurants. I have also learned some restaurants cannot be handled. 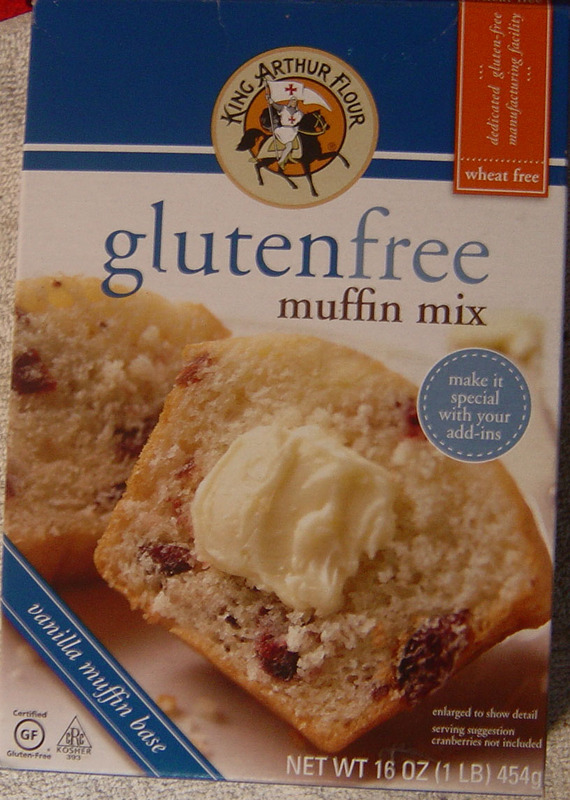 I have tried a lot of products labeled "Gluten-free" and some tasted great. Some did not. Some made me sick. 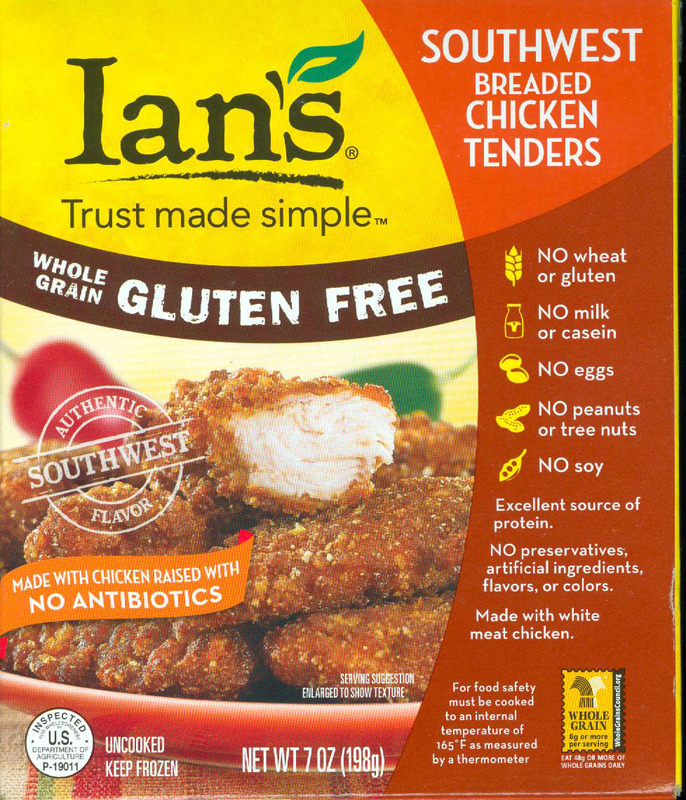 My Wife, title cased out of respect, is always on the look for gluten-free products. So here is my "life experience" with Celiac Sprue. I have numerous divisions and my placement may not fit your classification so you may want to skim through the whole mess. In some areas I tell you my opinion of some resources and I rate some. The rating are my opinion on a 5 star basis. 5 stars means its as good or better than its glutenated relative. Cross contamination it too common while battling an allergy or sensitivity to gluten. It is sneaky and I have found it that hard way more than one. Therefore I have broken this down into two main sections. The first is while you are eating at home and the second is while you are eating out. Material cross contamination - Peanut butter, crunchy or smooth is gluten-free and grape jelly is gluten-free by its nature. However, both become cross contaminated in the common household. The gluten eater makes that staple PB&J and walks away. What that diner did was scrape the excess peanut butter and jelly back onto the lip of the appropriate jar. That returned excess may have been scraped off gluten containing bread and bring crumbs into the peanut butter and jelly jars. Stick butter or margarine has the same issue. Open your mind, this is in many areas of your home and those homes that you visit. Equipment cross contamination - The toaster and the cutting board are found in almost every kitchen. Residing in the toaster are crumbs that fell off the "glutenated" bread. They are just waiting for your gluten-free bread to meet new friends - your gluten-free toast. The cutting board may have little grooves holding those bad little guys that make us react adversely. Open your mind, this is in many areas of your home and those homes that you visit. The material solution may require two jars of peanut butter and two jars of jelly - one marked GF and the other marked "Poison" - if you have a sense of humor. (A big red X works well too.) There are several jelly makers that have squeeze containers, that handles that problem. For butter and margarine, the solution may be squeeze or spray containers. Equipment is an issue. In my kitchen I have a toaster-oven that is solely gluten-free. It takes longer to make toast but is shorter than the ride to the hospital and less painful than an NG tube (Nasogastric tube). For the microwave, I wipe it down before use and cover my item with a paper towel anchored by the weight of the item so it does not get blown off. 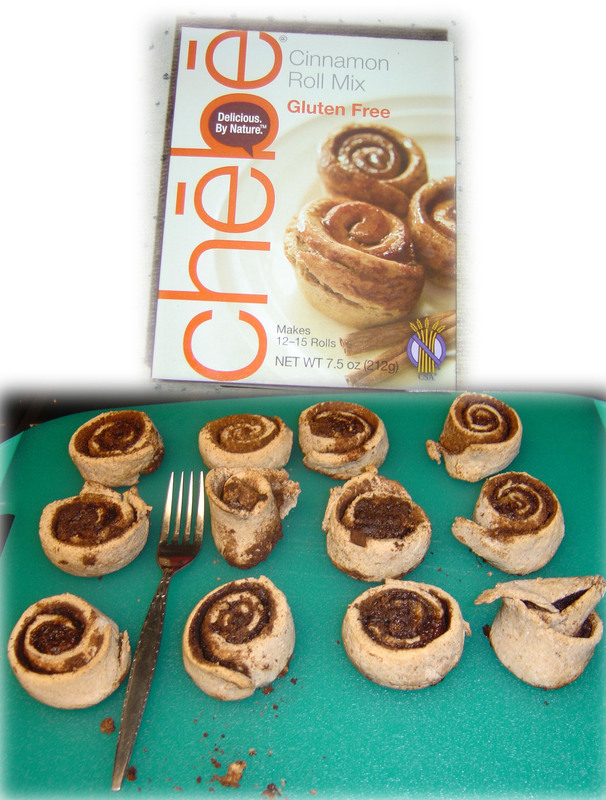 Kitchen procedures are make the gluten-free items first, protect it, then make the glutenated items. Within this section I am addressing restaurant and commercially prepared food at social activities. The first one that caught me by surprise and put me in the hospital with an NG (Nasogastric tube) going into my nose to relief pressure and remove digestive fluid from my stomach. If the facility serves onion rings, french fries are off the menu for you. The facility will tell you that they are fried in their own fryer but the fryers are next to each other and splatter into each other. And, the onion rings are often "carried over" the french fry fryer. The second one hit me at a burger joint. I was eating gluten-free protein style burgers wrapped in lettuce. Okay. Well, not really. They put the ketchup, mustard, and relish on from bins holding large amounts of the items. When they got too much on something, they scrapped the excess back into the bin - OFF THE GLUTEN CONTAINING BUN! Successfully cross contaminating the bin with crumbs. The solution is to ask if packets of ketchup, mustard, and relish are available and apply it from those individual serving packets. You need to be knowledgable regarding gluten and sources of gluten while dining out. At a very upscale restaurant and function the chef and staff decided gluten-free meant vegetarian so they served me a bunch of vegetables with a specially provided slice of whole grain wheat bread. After all, as the chef explained, whole grain wheat bread is very healthy and contains not meat or meat by-products. I preferred the prime rib on the menu and never got it as it was a meat dish and they did not want to violate my dietary preference. Pay scale or title does not make them knowledgable. It took me about four months and complaints to the Better Business Bureau and the Health Department before I got my totally ridiculous dinner fee refunded. Most staff members will check the ingredients listings for you but they may not know what to look for. A fair percentage of salad dressings contain wheat flour as it is a great, flavor neutral thickener. When you ask for that dinner salad without croutons, and it is served with croutons, sorry. HOLD IT WHILE THEY CORRECT IT WITH A NEW ONE. By health code laws in most cases they cannot serve it to another diner once it is on the table and they cannot simply remove the croutons - the crumbs are still there. I have comments on several dining out operations later in this section. You can use them to guide you through other facilities. Call ahead of time and find out if they have a gluten-free menu. Keep notes on where you eat and who served you. Use it when you return. If they acknowledge your gluten-free allergy and then violate it complain to at least three entities - the business, the Better Business Bureau, and the Health Department. Service is their business, disservice is a health hazard to you. For me gluten-free is not a choice, it is a medical necessity. I have been reading several articles on gluten-free voluntary diets in reputable publications. All say the same thing, if you are not required to go gluten-free, it might be best to limit, rather than eliminate, gluten in your diet. Many of the glutenated products provide fiber and are enriched with vitamins and minerals not often or easily found in other foods. A side affect of going gluten-free is a possible increase some undesirable elements. 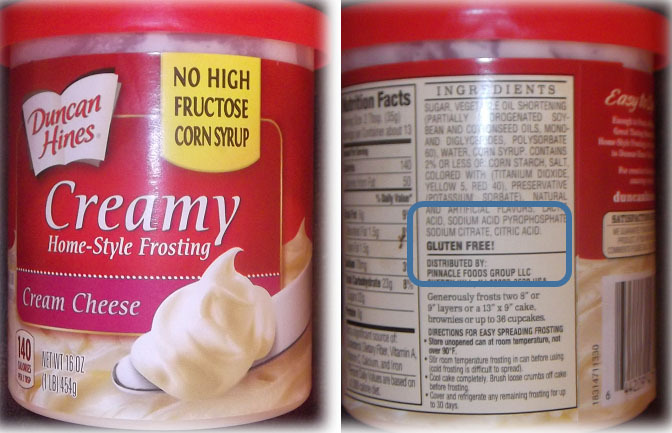 Numerous tests show that due to the change in taste of products many gluten-free products contain an amount of sodium and / or sugar elevated above their glutenated counterparts. Several of the gluten-free grains have also been determined to contain undesirable levels of substances such as arsenic and mercury. Both best avoided as much as possible. Standing in the supermarket aisle and comparing glutenated to gluten-free nutritional values is not my idea of fun. The change also affects the items consumed. Being "highly allergic" to gluten, I cannot safely take the bread off the contents of a sandwich for fear of cross-contamination at lunch. Therefore I maybe looking for a bag of "real" potato chips or a candy bar significantly changing the nutritional values of my gluten-free lunch over a glutenated lunch. Reduced gluten if you do not have a medical necessity, probably a good idea. Gluten-free without a medical necessity may be a discussion you want to have with your doctor or a nutritionist. For franchise type operations and corporate operated chains check with the parent company via the Internet. Many list food allergy issues on their home page, print out the results. I often e-mail the customer support contact for more information. Usually there will be no problem. If a facility serves onion rings do not eat the fries. While cooked in separate oils and fryers they are most likely swapping baskets between these fryers and the fryers are next to each other for splatter & cross contamination. If you order a salad without crotons and it is served with crotons, keep the bad one on the table until the correct one is produced. You cannot simply take off the crotons - the crumbs are left behind. Applebee's parent company says food allergies such as Celiac Sprue / gluten are not a problem. Simply advise the local restaurant upon arrival for accommodations. When you walk in and sit down and say you have Celiac Sprue and ask how to handle it they bring out a printed card from the back room that says "Contact our parent company via e-mail for food allergy information." So this is a round-robin cycle - ask corporate - told to advice the specific site, advise the specific site and told to contact corporate. UNSAT. I no longer visit Applebee's. Staff is occasionally educated on Celiac Sprue. While I sincerely appreciate Applebee's free meals offering to Veterans on Veterans Day and Memorial Day I have given up on Applebee's. No longer on our list. They violated my gluten allergy and really don't care. Entered or updated July 7, 2016. My Daughter, Son-in-Law, and Granddaughter took my Wife and myself to Casa de Bandini on June 8, 2016, for our wedding anniversary. I ordered from the gluten-free menu and made sure the waitress knew it was gluten-free, not by choice but medical. Not a problem in the past. From there on out I was distracted by my fifteen month old Granddaughter. I had ordered Fajitas de Bandini, a favorite of mine at Casa de Bandini. When the food was served no tortillas were served. I asked for the corn tortillas and within a few minutes they were put under my elbow. My Son-in-Law had been served whatever he ordered. From there it went south in a hurry. I was enjoying my Granddaughter who was enjoying all the action. Somewhere into the second or third tortilla my Daughter told me she thought the tortillas were wheat. AND THEY WERE!!!! I took the poison to one of the staff. Within few minutes a waitress gave my Son-in-Law a stack of wheat tortillas saying the ones given to me should have gone to him. Then I was told my corn tortillas were being made - since they take longer. I informed the waitress the damage was already done and I was most likely going to be sick in an hour or two. So ended the interaction between us other than to pay the bill. On the way out I was given a cola (Coke or Pepsi?) to "settle your stomach." Gluten poisoning does not work like that. About three hours later dinner started coming out both directions. I drove the porcelain bus and a barf pan steering wheel from about 8:00 PM until about 3:00 AM. It took about four days before my insides got back into alignment. It will take months for the chemical damage to be healed. Violating a gluten allergy to this level is not a recover in twenty minute issue. It takes months. I sent an e-mail to Casa de Bandini. No response. They are off my dining list. Casa de Bandini used to be located in the historic Old Town section of San Diego. We would make the one hour plus trip to the crowded parking lots whenever we had friends and relatives in town for an excellent dining experience on the outdoor patio. Due to contract issues that facility closed and the owner, Diane Powers, moved the restaurant to "The Forum" shopping center in Carlsbad. Now it is a one hour plus drive to Carlsbad to another jammed parking lot. Some things do not seem to change but the trip and the annoyance are worth it for special occasions. The Carlsbad facility has both indoor dining and an outdoor patio. In our long history with Casa De Bandini we have eaten indoors, in Old Town, only once. The outdoor patio still retains a child amusing water fountain, an element from Old Town, and the patio can get cool to cold depending on the night. There are heaters throughout the patio that are fairly effective depending on many factors. The menu is complete with a gluten-free menu available and dining there with a high allergy level of Celiac Sprue has never been a problem. When advised, the staff is not startled and seems to know the situation. The annoyance, which seems to be common to many restaurants, is there are no prices on the gluten-free menu, so you need to handle both menus if you are cost conscientious. The prices are reasonable so ... not a big factor. Due to ambience, this is a "take guests to restaurant" and the prices are totally reasonable. Waiting times can be excessive due to the popularity and reputation of the facility. Chili's has a limited gluten-free menu and the staff is relatively educated about gluten-free diets. Experience is that the food is likely to be served in violation of the ordering even when "gluten-free" is stressed. The staff is more than willing to correct it. Corrections take time and the rest of your party will be long finished with their meal while you wait for yours - again. Their seasoned butter is a gluten violation. Huh? On one visit the steak was served with the seasoned butter. The staff said they would have the chef blot it off. That will not work. I have given up on Chili's. Via e-mails Denny's parent company they say there is a company policy allowing substitutions for food allergies. Numerous restaurants I have visited say no substitutions. When Denny's parent company is contacted again with this information the response is the boilerplate text that the parent company does not control the franchised operations and food substitutions are controlled at that facility. On more than one occasion the issue arose in a corporate owned and operated facility and no substitutions were allowed. Their food allergy handout, available both on the Internet and on request in ALMOST every facility I have been in is TOTALLY confusing and pretty much useless. The salvation is you can order their pick the items breakfast 24/7. Their staff is generally uneducated about Celiac Sprue - based on experience. Just my choice, 24/7 at Denny's I have two eggs over easy, hash browns, bacon, and sausage. Its about the only meal at Denny's that is gluten-free. The Fig Tree Cafe is in the Hillcrest area of San Diego. The only thing I have had from their menu is their gluten-free cheese pizza as a take-out item. Fantastic. The Fig Tree group has other sites in San Diego but they are not all equipped for gluten-free pizza. Ask upon arrival. Entered or updated March 26, 2017. Most Hometown Buffets, if not all, have closed. The parent of Hometown Buffet owns and operates numerous facilities under various names. We visit the Hometown Buffet at Mira Mesa Blvd. and Camino Ruiz in San Diego relatively often. The staff is rather knowledgeable about gluten-free and will accommodate you fairly well. The best way to handle Hometown Buffet is to introduce yourself to the site supervisor upon arrival and tell him / her what the issue is. From then on he / she has always been helpful and accommodating. For example, their pot roast gravy has gluten in it, upon request they will bring you pot roast without the gravy. At In-N-Out Burger order a protein style burger without spread, ketchup, or mustard due to cross-contamination on the fixing tables. They keep individual sized packets of catsup, spread, and peppers under the counter and all are gluten-free. They may have mustard too, I have not asked. Let the crew know this is food allergies issues - use the term "Wheat" rather than gluten or Celiac Sprue. Some of the time they will cook your food on a separate area of the grill and keep it away from the fixing table. Before you start eating make sure the fixing table crew member did not put the fixing table's spread on it - cross contamination. They will remake it for you if they screwed up. Scraping off the spread does not protect you and they usually know that. The fries are good - In-N-Out does not serve onion rings. Olive Garden is owned by the same parent as Red Lobster and what a difference in attitude. Olive Garden has a limited but adequate gluten-free menu. When they have specials such as all you can eat pasta it is not uncommon for them to include the gluten-free option. Call both the parent company and the site to be visited first. The staff is 50/50 about food allergies and gluten. Do not give up. Request to talk to the site supervisor AND chef to get it resolved. If you walk in and find a waiting list, ask as you put your name on the list. Quality of the food and good. They will serve the bottomless salad without crotons and provide crotons on a plate for others. I have had only one really bad experience in many trips to Olive Garden and it took two people to do it - the waiter was clueless and the site supervisor did not care. They have a gluten-free menu that has no prices so you need both menus. That makes it kind of cumbersome. Their staff is usually pretty knowledgeable about food allergies. However, have the staff put "Gluten-free" on the order when ordering. Very accommodating to substitutions. Outback changed their prime rib availability from all without au jus to one style. Oh well. Entered or updated July 25, 2016. We were at Edwards Air Force Base on a museum run and found Panda Express. Joyce tried accessing the homepage and could not. We asked the young lady at the counter about gluten-free. Her response was she had to check with the kitchen. When she got back she said "You can eat almost anything." So I pointed to what looked like bean sprout something or another and asked if that was gluten-free and I was told "Yes." I asked if the Broccoli Beef was gluten-free. I was told "Yes" again. At the checkout station I was given two wheat flour fortune cookies. About thirty minutes later I told Joyce we had a problem and checked into the Air Force Inn. So ended touring on Wednesday, July 20, 2016. It took about four hours for it all to pass through in one direction or another. Thursday was on the road and uncomfortable but we had stops we needed to make. The Rio Tinto Borax Mine Visitor Center is pretty cool. Even if you feel lousy. I checked the Panda Express homepage when I got home. Pretty much a gluten reseller. I filed comments with Panda Express and they called back today, Monday, July 25, 2016, offering a refund. I assume it is coming. They addressed the need to educate their employees. Sure had a negative affect on a two day trip away from the house. Never heard from Panda Express after the first and only phone call. Never got the refund I understood was coming. Red Lobster and Olive Garden are owned by the same parent company and the restaurants are day and night apart. My wife loves Red Lobster and so do our children. I have contacted Red Lobster over the years and finally gave up. So when it is Red Lobster night it is my wife and my children. I am nowhere around. The basic response to "I am Celiac Sprue, how do I handle Red Lobster?" is "Too bad. We have wheat flour all over the place. Find somewhere else to eat." There is a lot of history and care behind Ralph Rubio's success with the fish taco at Rubio's Fresh Mexican Grill. They work for healthy, tasty, quality food as well as customer satisfaction. And they work within the constraints of the common food allergies. Simply ask at the counter for gluten-free guidance and the counter representative will normally pull out a sheet and work from it. The nice thing is they KNOW the material and are usually talking and pointing to the material and looking at you. We visit Rubio's primarily in Ramona, Santee, and Mira Mesa and we have never had an order screwed up or a problem after eating there. Always a great time. And their gluten-free menu is on the Internet - http://www.rubios.com/menu/. Today’s Pizza and Salad, 481 Santa Fe Drive, Encinitas, CA 92024, (760) 753-6425, appears to be a family owned and operated facility. We “found” them when they graciously provided gluten-free pizza for an Encinitas Chamber of Commerce Recognize Teachers of the Year event and our Daughter Cindi was her school’s and district’s honoree in 2012. Getting into Today’s is a bit of an adventure and I have driven round-abouts in several foreign countries and think they are kind of neat. Maybe I miss the turn into the shopping center looking for the fun of the round-about a bit down the road. This is the best pizza parlor gluten-free pizza we have found. Thin crust and crisp. Staff is helpful and informed. In our several trips there we have always managed to get in while the flow is very low which seemed to give us a bit more than normal staff attention. Disney facilities accommodate a lot of dietary constraints. If you call Guest Services they will e-mail you a MASSIVE document about how and what you can eat where. Most of it you can edit out before you print it. For example, they will tell you where every fruit cart is and what each one has that you can eat. Bananas and apples are gluten-free and knowing that about one food cart is transferable to every food cart. The key is that you are told to go into every restaurant type facility and ask for the chef. The chef will tell you what you can eat there and will process your order for you. The gluten-free options include pizza, hot dogs, and hamburgers as well as salads. I am going to leave the 2013 remarks up and add our Saturday, June 7, 2014, Chicago White Sox vs. Los Angeles Angels of Anaheim remarks. I found nothing on the homepage about gluten-free so I called one of the numbers. Talked to "Anna" who had no information in hand so she took my number and said she would call back. About thirty minutes later got the call back. No gluten-free information is available for the stadium concessions. However, she believes the "veggie dogs" at any Melissa's Fresh for You COULD BE gluten-free. 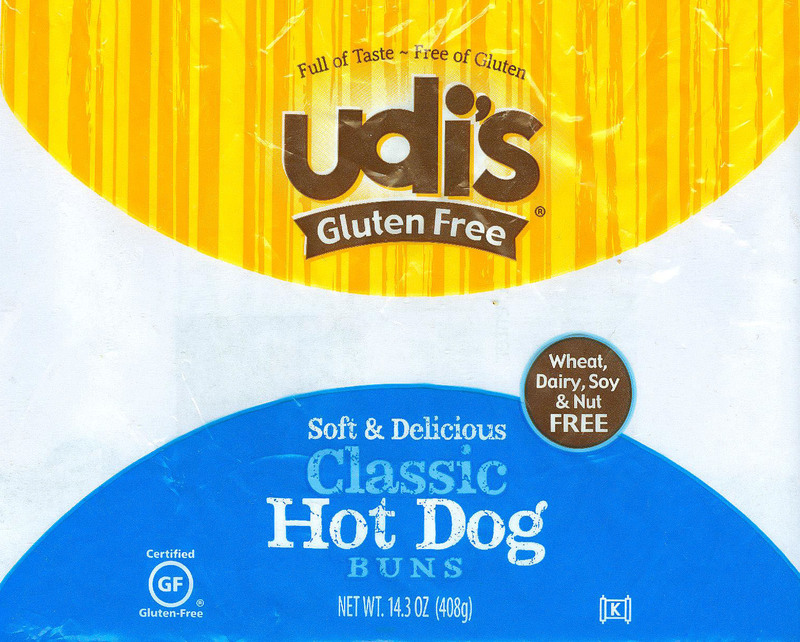 Veggie dogs are not always gluten-free, meat and gluten are two different issues. Stopped by one Melissa's Fresh for You by the main gate and asked if the veggie dogs and buns were gluten-free. The answer was "Gluten?" Bring your own food to Angels Stadium. Remember, no beverages other than sealed water bottles are allowed into the stadium. The homepage says water bottles are allowed, the security stations say only if still sealed. Aramark has the food concessionary at Angels Stadium. The stadium's homepage misleading, out of date, and flat out wrong -even five months after our bad experience nothing has changed. If you figure it out and download or print their food guide it is of no value. On our trip we asked where we could get the gluten-free hot dogs listed in the guide. We were directed several sections down from our seats. No luck. Asked again. "Oh. Those are just a few more sections down." We circled the entire stadium being directed "just a few more sections down." It took us about forty-five minutes to walk, stop, ask, get misdirected around that stadium. I gave up and started asking for phone numbers. Many park staff had no idea of a park info phone number. One did. I called and got redirected several times and finally got to a young lady, Kate or Katie. She told me she would meet me AT THE ONLY LOCATION IN THE PARK SELLING GLUTEN-FREE HOT DOGS. I beat her there, literally feet from our seats. I asked the counter staff guy if they had gluten-free hot dogs and he said "The buns are supposed to be gluten-free but the hot dogs are not." The site supervisor standing next to him did not even have time to say he had just brought them down DUE TO MY PHONE CALL. At this point I sat down and waited for Kate / Katie. When Kate / Katie showed up we got into a four way conversation - Kate / Katie, the counter staff, the site supervisor, and myself. It turns out the counter staff guy thinks gluten-free means VEGATARIAN. (I HAVE NO PROBLEM WITH PRIME RIB!) Kate / Katie and the site supervisor decided I should get a free gluten-free hot dog and drink for my now hour plus search for the gluten-free hot dogs. At this point the first pitch of the game had not been thrown. I did not know that in the meantime my wife had purchased a "gluten-free" nacho supreme basket thing which is also vegetarian. I was sick by the third inning and spent the next two days not getting more than 50 feet from a bathroom or bucket. You can bring food, no beverages, into the Los Angeles Angels Stadium. I recommend you do. Five months after our trip there the homepage is still wrong. Since we do go to the Los Angeles Angels Stadium for White Sox games I kept their customer service number - 714-940-2000 if you need it or plan a trip. Entered or updated October 30, 2016. These remarks are entered after the season closed. Neither the Padres organization or DNC / Delaware North Corporation the food services contractor seem to care about gluten-free hot dogs, hamburgers, or tacos. During the season I used the e-mail contact system on the Padres homepage under "Contact Us" several times to ask questions. I NEVER got a response. As of the other day Joyce and I are going to invest what we normally would in Padres season tickets in a trip to Chicago to see the Cubs play the White Sox in inter league play. We will buy select games for Padres home games - most likely only the Cubs. AND, WE WILL BRING OUR OWN GLUTEN-FREE HOT DOGS TO THE GAME. Entered or updated April 26, 2015. To Joyce and myself, this is "OUR" park. 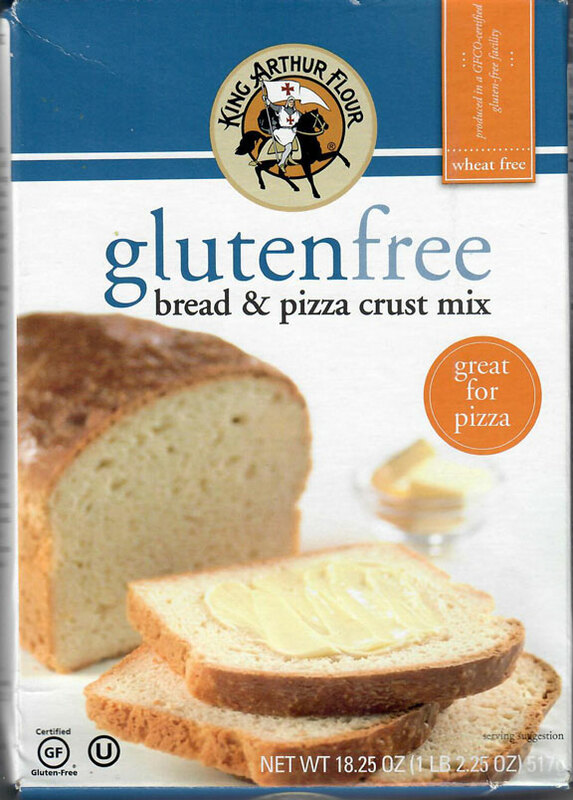 Up to this point over the last couple of years Petco / the Padres / DNC has continued to increase gluten-free options. Last year they even went gluten-free with Taco Tuesday. This year it seems if you are gluten-free, you are converted to a vegetarian. Gluten-free hot dogs are gone, gluten-free tacos on Taco Tuesday are gone. Your options now are fruits and salads. At a baseball game? Right. In my Internet submission dated Friday, April 24, 2015, 3:34 PM on the Padres / Petco homepage of, "Where are the gluten-free hot dogs going to be? Thanks, Rex," here is the response I received on Saturday, April 25, 2015, at 12:53 PM. Our Gluten Free items are located in Seaside Market (Section 107), we also offer Kosher Dogs and Veggie Dogs in the Mercado (Section 102), 115, 116, 135, 233, 303, 315, 324, and the Park at the Park. Have a wonderful weekend and GO PADRES!" I did not know Kosher meant gluten-free. I am not going to prove it. The veggie dogs, I am told, have "regular buns" which means WHEAT!!! And that means gluten. The resultant hospital stay for a mistake is not worth it. Petco rules allow you to bring in food so bring your gluten-free hot dogs in. You can use the "saucing stations" to dress it if you desire. I keep my "neat" most of the time. About a week before this posting I left a voice mail at the number for DNC given to me by the Padres. In it I asked where the gluten-free hot dogs went. No response as of this posting. Probably making kosher hot dogs and salads. I do not drink so I did not check on the gluten-free beer that they used to carry. Disappointed in the apparent policy change by Petco, the Padres, and DNC. And yes, I know sales of gluten-free hot dogs were not high. Now they are ZERO. Petco is managed by an aggressive crew in numerous aspects, especially in the efforts to please the guests. Part of that total crew is the presence of DNC providing concession management and operation. Josh and DNC need to complimented on their efforts and the results. This year you will still find the gluten-free hot dogs, gluten-free hamburgers, gluten-free beer, and such at the gluten-free cart in the Mercado section, around Section 106 on Field Level. The cart is on the outer wall of Petco, walk through the "tunnel" to the outer wall to find it. If you cannot see the railroad yard, you are not in the right area, well marked and identified when you get there. For beer drinkers, I am not one, gluten-free beer seems to be available at many of the bottled beer sales points. During the 2013 season Petco Park / the Padres / DNC started a Taco Tuesday with five tacos for $5. At the start of the program there was no gluten-free offering of these 5-6 inch tortilla tacos. 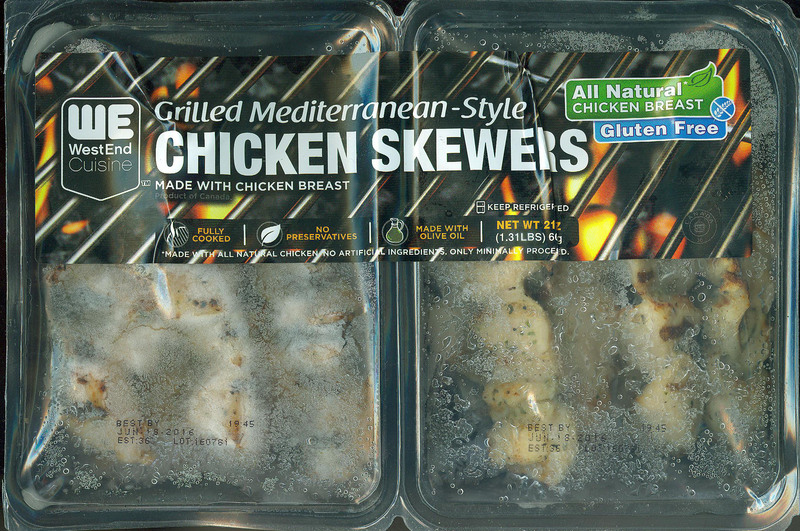 Later in the season gluten-free became available with chicken only at the gluten-free cart at M106. While I have nothing against chickens I am a beef guy by nature. 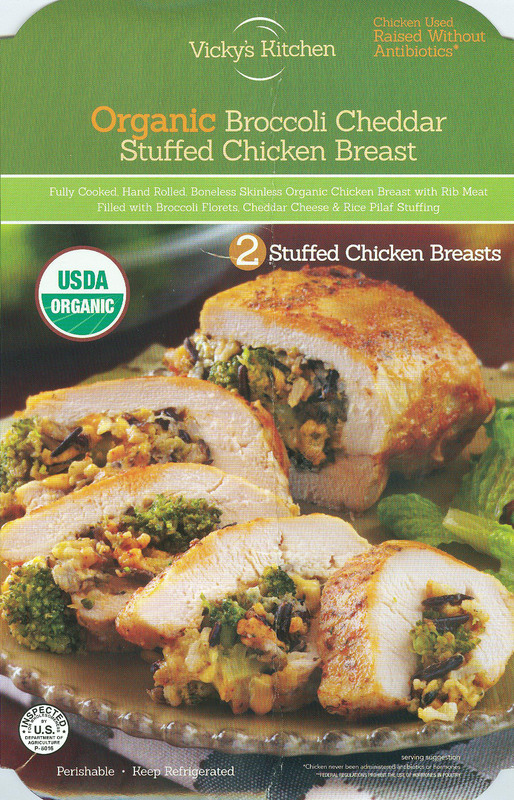 (We do eat chicken probably two or three times a week at home as “less unhealthy” than beef.) So we tried them. GOOD STUFF! Spicy without being intimidating, no after taste, not greasy at all. And DNC located and stocks numerous sauces specifically selected for their gluten-free condition. And served in a cardboard tray so you can fix them and carry them away without problem. This is a good deal. Here is a kicker about Petco / DNC and most of the foods provided throughout the park. When you order you have to wait. Why? You want to head out to the game and watch the next pitch. May take a little longer but your hamburger or hot dog bun has not been sitting there absorbing fluids for the last forty-five minutes wrapped under a heat lamp in most booths waiting for someone to put it on a tray and hand it to you. It needs to be assembled. Some of the gourmet kiosks are going to prepare your food in front of you. My Wife, not a winner in the Celiac Sprue Lottery, loves one of their specialty sandwiches we find on field level out by right field. No hidden kitchen, no pre-assembled foods, and a very colorful presentation due to beef, bun, peppers, onions, etc. Kind of slow. Kind of cool. How often do you see a “fast” baseball game? Fast play in baseball? Sure. Fast game? Hardly ever. I have found the Padres staff and the DNC "background" staff to be very helpful and accommodating. The counter staff is generally hit or miss. Guys and Gals, remember the park is there because of us and we are there because of the park. If it went right or wrong let the Padres know. If you send a comment to the general Padres e-mail on the Internet, they will route it for you. Over years of sending them e-mails I have never had a comment, good or bad, unanswered. And we continue to buy season tickets for a number of reasons. Hoping 2014 is better than 2013. First, this update has more to do with the experience at Universal Studios Hollywood than gluten-free. They desire it. The crew / cast / staff work hard at making the experience enjoyable and they are successful. To say Universal Studios is responsive to both positive and negative issues at their park is a gross understatement. Joyce and I hold the CostCo purchased annual passes so we have “average annual pass privileges.” Universal Studios keeps sending us special event options that increase our access to the park / reduce our blackout days for FREE!!! We opted for another free special event access on Saturday, October 29, 2016, which is my birthday. By the time Joyce and I discussed it, her birthday, Saturday, October 22, 2016, was closed / sold out. We also had some special privileges from Universal Studios Hollywood from earlier visits. The day was bright enough not to be dark and dark enough not to be bright. It was warm enough not to be cool and cool enough not to be hot. Perfect weather to be at the park. The park did not become heavily populated by guests until about noon and it never became crowded during the day, just busy. That made it a perfect day at Universal Studios. For lunch, we ate at the Three Broomsticks Restaurant within the Wizarding World of Harry Potter once again. Greeted by “Princess” at the door we found out her name was “Princess Joyce.” That was a first. With Rex being Latin for king the joke was obvious (to me) and wondered if she was our daughter which would make my Joyce “Queen Joyce.” (My Joyce is a queen.) The cash register / order taking staff was once again very knowledgeable about gluten-free. This time I opted for the Lemon Herb Chicken which comes with corn on the cob and what I would call home fries and Joyce went for the Shepard’s Pie which comes with a good-sized garden salad. Both meals were 1) tasty and 2) ample in size making them excellent values. Joyce added “Gilly Water” to get the bottle for her classroom. Princess Joyce shifted from the door to the dining area and we got her picture with Joyce. The crew / cast / staff is extremely responsive to guest requests. This is our third trip to Universal Studios Hollywood. Probably going back just before Christmas to see what they do for Christmas. The overall value of park access is outstanding and the experience is extremely satisfying. Ask the staff for food allergy information. They have a notebook at the cash register for all of the fudges and treats prepared on site. The Butterbeer Fudge is really good. Remember, ask every time as ingredients may change over time. Entered or updated September 9, 2016. Sorry for the delay. Kind of been distracted. I submitted an e-mail to Guest Services at Universal Studios Hollywood and played phone tag with Noelle due to my not knowing my phone was ringing while working in the yard. Super conversation. Universal Studios Hollywood is concerned and I had complete satisfaction with Noelle's interaction. With annual passes from CostCo we will be back to Universal Studios Hollywood several times before they expire. Checking out the "spirit" of the other guests is fun. A lot of Harry Potter fans walking the park. What other franchise draws from four years old to ninety-four years old? Entered or updated August 31, 2016. Joyce is into Harry Potter and we simply have not made it to the Wizarding World of Harry Potter in Orlando. Then they opened the Hollywood section. So season passes from CostCo and we have gone twice in less than two months. This single page document tells you how to handle gluten-free within the park. It did not list The Three Broomsticks Restaurant within the Wizarding World of Harry Potter which had gluten-free items - according to the cashier. I had the spare ribs with corn on the cob and potatoes without a problem. That was our first trip. our second trip tried the gluten-free buns at Mel's Diner. Both meals were very good. The staff was at least wise enough to direct us to someone who knew what to do. HOWEVER, I had another issue with the park and two letters, one mailed and one hand delivered, have gone unanswered. While in a men's rest room a chef came up and used the urinal next to mine. I was washing my hands when he simply walked out directly out of the rest room from the urinal wiping his hands on his apron. Food professional? NOT COOL! Personal hygiene? Entered or updated August 12, 2016. 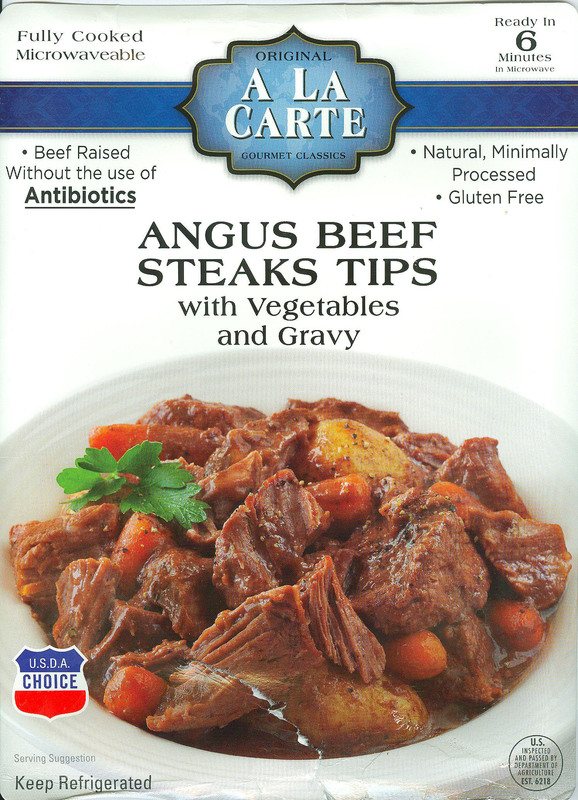 This is a first usage of an A La Carte product. Joyce found it at CostCo. Easy to warm up in the microwave, already fully cooked. The vegetables are small potatoes and small carrots. Taste is good and the quality of the meat is rather high - no fat slabs located. TONS of gravy. Size wise I have a bit of an issue. Joyce was kind of hungry and I was HUNGRY. We polished it off, with a lot of gravy left over and were looking for more food. Entered or updated January 26, 2018, Post crash. Amy's is consistent - spicy. This product is a good quantity for a meal for two if you augment it with a couple of things and corn bread is one of them. Good texture, okay appearance. Entered or updated July 7, 2016, Post crash. Amy's is consistent. 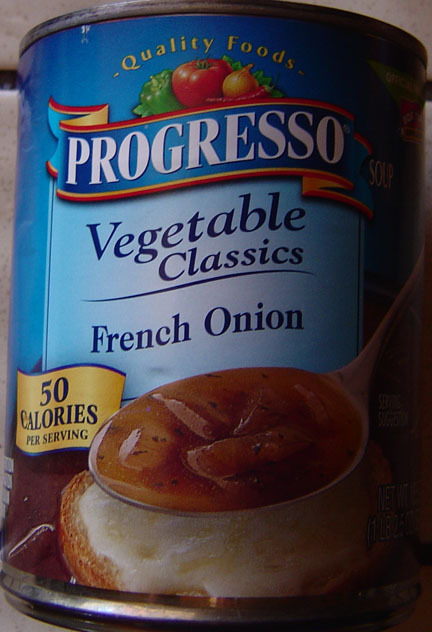 I have cans of this in the pantry and I like it. Often part of a meal when Joyce is not home. Amy's is one of those companies with a history and reason for their products. 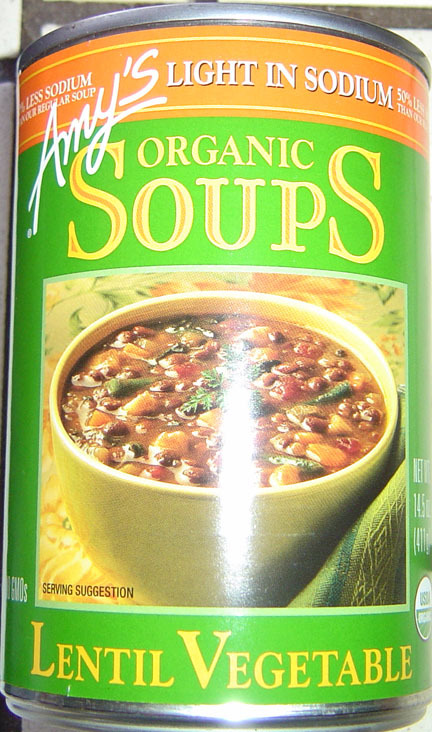 Their Lentil Vegetable Soup, low sodium, is good. This is ready-to-serve in the can and one can is "a large serving" or two small servings. The low sodium standard is here, slightly bland but works well with gluten-free crackers on top. 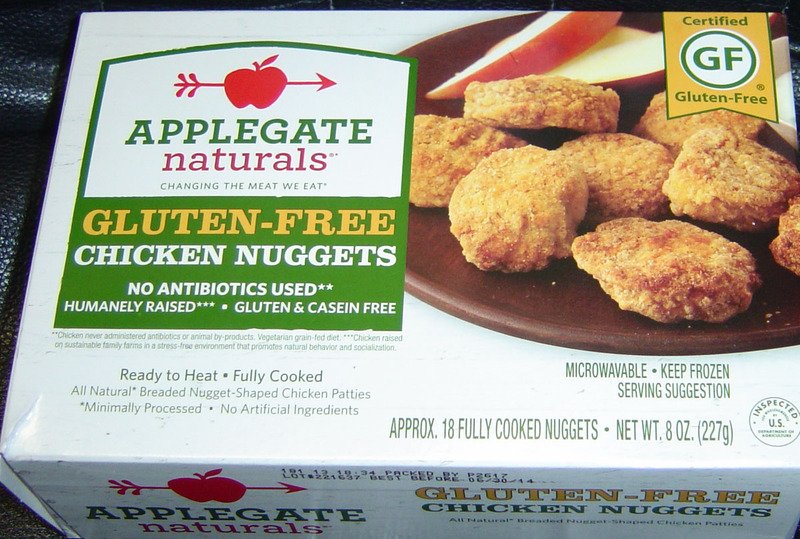 This is our first try with Applegate Natural products of any kind. I am not a big fan of chicken nuggets, I prefer my chicken on the bone and fried, barbecued, or baked. The heating options are oven or microwave and I went the microwave option. And heating options do change the product. Next time I will try heating them in the convection oven. With two minutes on each side for the full package they came out of my microwave in what I would consider properly cooked. The texture is a bit soft, and that may be the heating factor. I used catsup and deli mustard as dips. The taste, even naked, was pleasant with what I would consider slightly spiced allowing you to enhance it with your dipping choice. We will be buying more as a quick snack item. One 8 ounce package was what I consider a full sized evening snack supplanting dinner home alone. Barilla has been a constant in the kitchen. Joyce likes the way this cooks. On the table it holds its structure, has no bad after taste. Entered or updated April 2, 2015. This is a new product, as of April 2, 2015, for Betty Crocker. We found this at the Marine Corps Commissary at Miramar on a recent trip. Joyce mixed it by hand according to the instructions. She said the dough was not particularly sticky or annoying to work with. The dough rolled out into on a standard size pizza tray very nicely and was baked naked, without toppings, per the instructions for about fifteen minutes in our convection oven on a preheated pizza stone. After the "first bake" the crust was crispy and golden brown. With the toppings applied it is / was baked a second time for another ten minutes or so. The crust was thin and crispy - THE WAY I LIKE IT! 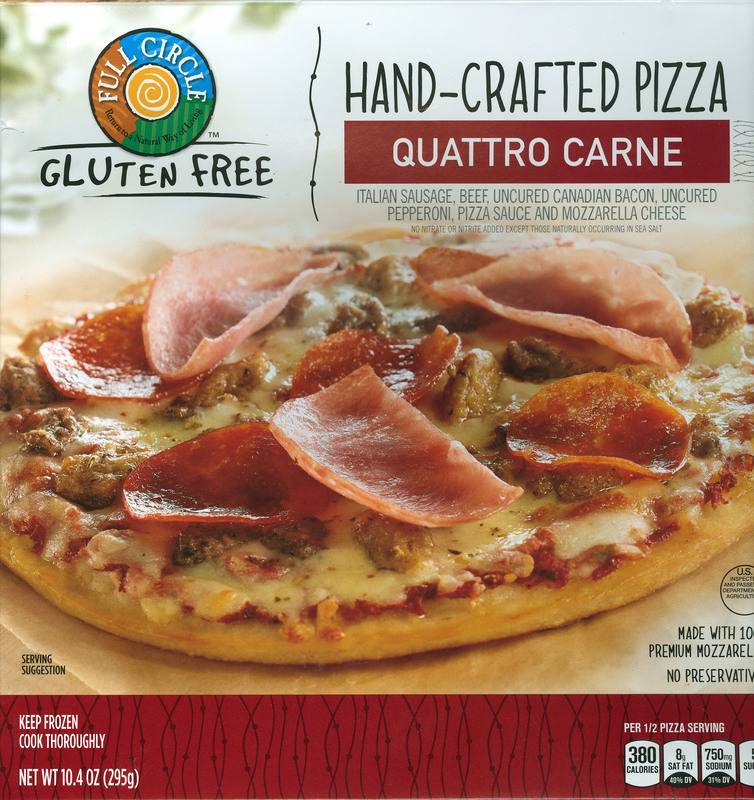 This is the first gluten-free pizza crust to attain that quality. The taste very good and the crust maintained it crispness after the topping was baked. 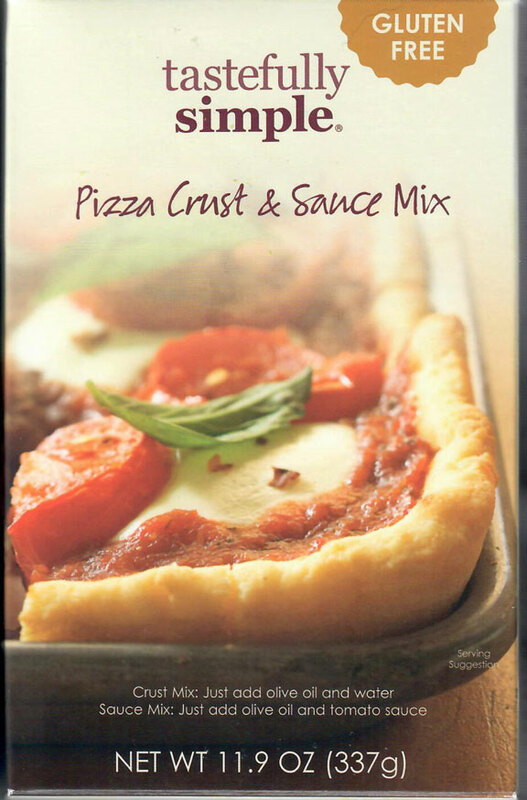 Betty Crocker Pizza Crust Mix is easy to work with, bakes to a crispy crust, has not taste / after taste issues. This is a rebuy. This is our first try with a Blake's product. My Daughter found it at Target and thought the price was reasonable so it came home. I cooked it in accordance with the instructions - covered with foil for the first forty-five minutes, then removed the foil for another ten minutes. The top crust stuck to the foil and I had to replace about 50 percent of it with a spoon scrapping it off the foil. Using our convection oven and conventional oven times and temperatures it came out warm. So this will be an adjustment on my end. The taste, though warm, was good for both the inner mix and for the crust. I will be trying another and will be looking for a beef option. We have tried several Blake's products and are overall satisfied. 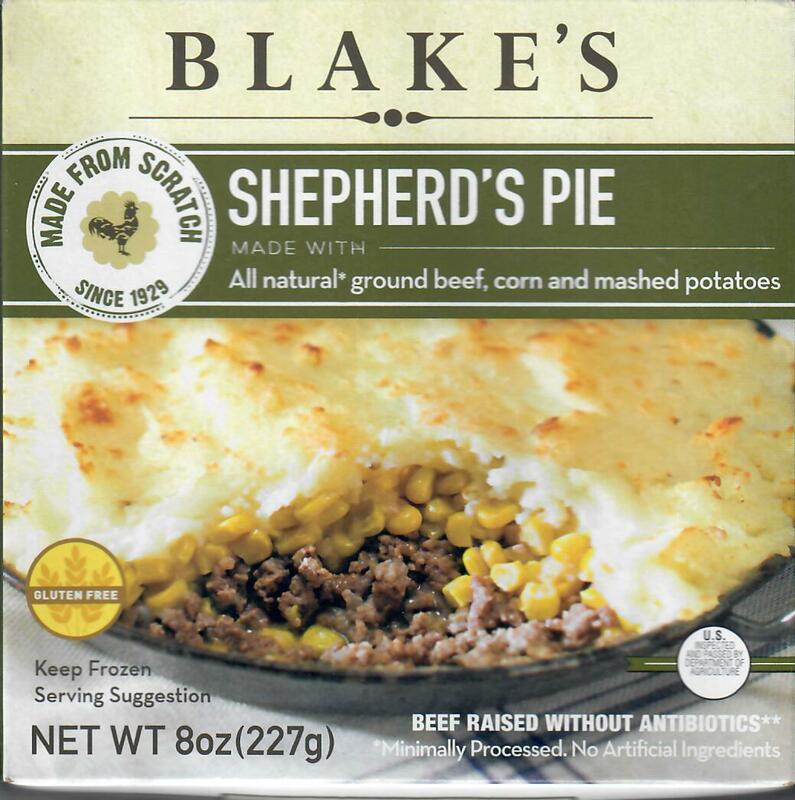 The taste and quality of the Blake's Shepherd's Pie is overall good when microwaved. Joyce and I split this for the first tasting. She liked it without comment. I thought there was a bit too much potato across the top. However, that would not stop me from having it in the house again. 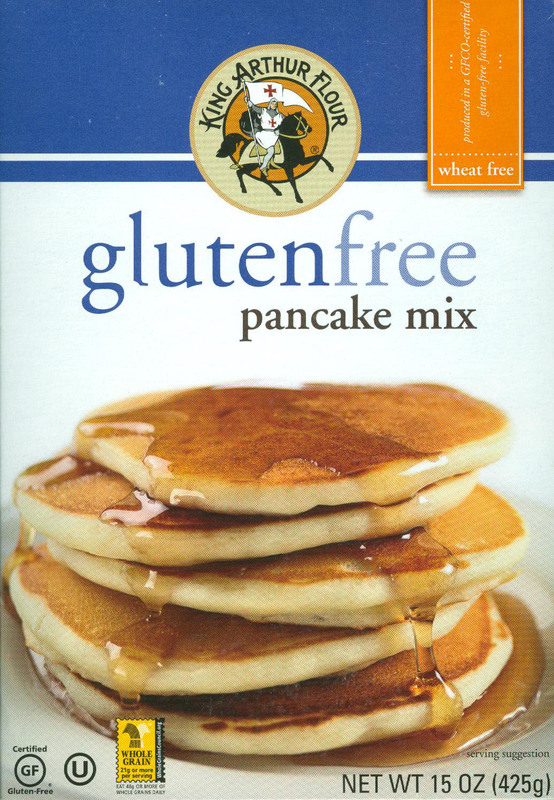 One of the things we did when we found out I won the Celiac Sprue lottery, a while ago when the market was not as well stocked, was bought a fair amount of mixes. THAT IS A MISTAKE IN TODAY's GLUTEN-FREE MARKET PLACE. 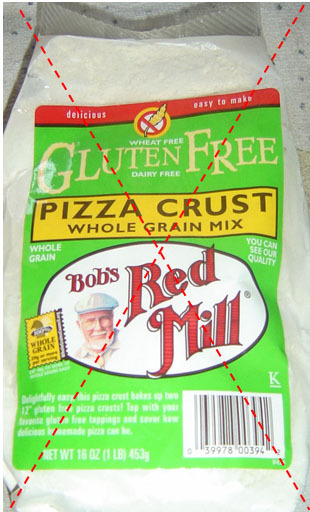 Bob's Red Mill Pizza Crust Mix makes two 12" crusts and requires a few common kitchen add-ins to be complete such as eggs, oil, etc. It comes with a self contained yeast package. The first thing it says in the instructions is to preheat the oven to 425. Later it will say let the dough rise for twenty minutes. Thanks for the advisory, my oven does not take that long to preheat. I mixed the ingredients with our dough mixing thing that Joyce got for Christmas a few years ago. As the package says, you are going to have to spread this out with your hands. IT STICKS TO EVERYTHING!! This stuff is stickier than duct tape and super glue combined. This stickiness of doughs is one of the down sides to gluten-free baking. As recommended on the package we tried wet hands. Reduces the stickiness but does not come near to solving it. We tried using a bit of gluten-free flour of some kind. Kind of helps but not enough. Do not touch this stuff with a rolling pin, plastic wrap, or tin foil, it will stick. Finally got the dough spread out to ALMOST round on the pizza pan. Following the instructions baked just the crusts for 9 minutes, 7-9 is recommended, before adding the topping materials which are not contained in the kit, the kit says "crust". This puts a "crust on the crust" so you can put the toppings on it. If we try it again, I may flip the crust over after the first bake and before putting the toppings on. This might help with the soggy middles. With the toppings, baking time for the pizzas is recommended for an additional 15-18 minutes. I did it for 18 minutes in the convection oven. Taste is enjoyable. The outer crust areas were baked through to be appropriately "dry" while the centers were a bit soggy. If we try this again, will lower the temperature and increasing the baking time to get the centers to bake through to a dry crust. This "wet center" is an issue with pizzas in our oven it seems. Because this mix is simply too sticky to handle, wet hands, oiled hands, gluten-free flour assist, it is not on the rebuy list for "manufacturing" issues. There is no unpleasant taste or after tasted issues. Without reservation, the crust tastes good, just too hard to "assemble" it. 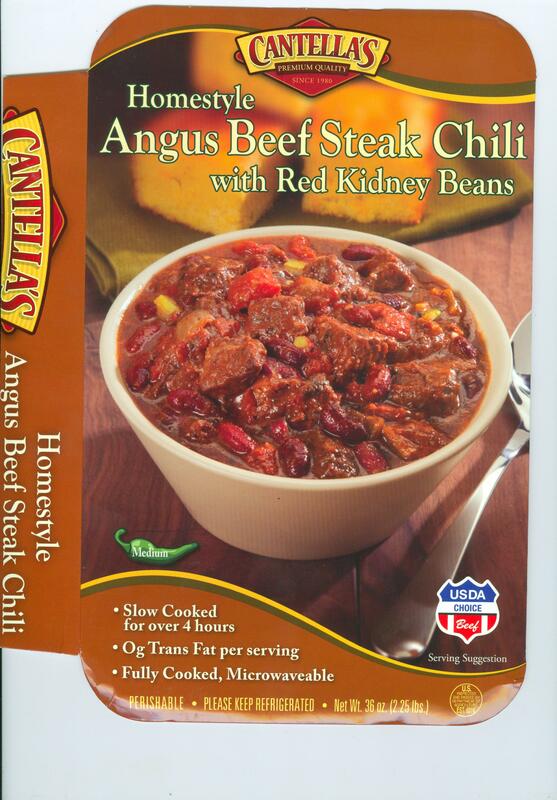 Cantella's Angus Beef Steak Chili was good. That heavy meal for a cold winter day in Ramona, California where it only got up to 70 degrees. Entered or updated June 8, 2017. Two medium sized tamales wrapped in corn husks. Taste was okay after being microwaved to bring them up to temperature. 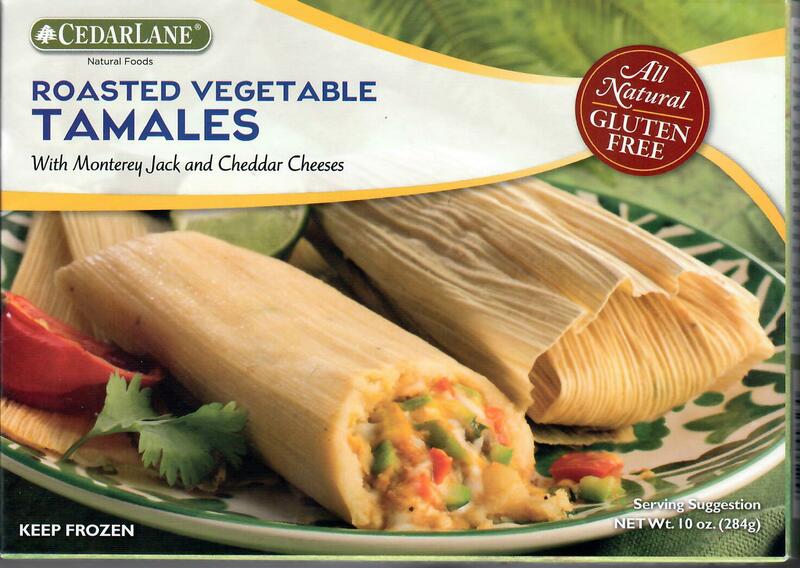 Joyce buys gluten-free tamales from CostCo in bulk and they taste just as good as these for a lot less money. 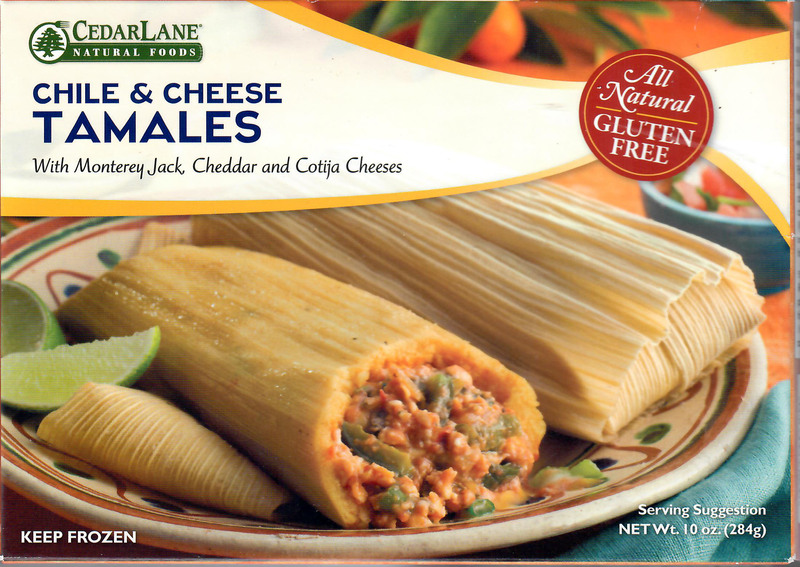 Asked Joyce to avoid buying any more Cedarlane Chile and Cheese Tamales. Cost, flavor, convenience, the CostCo bulk win out. Joyce brought two Cedarlane products home in one run, the first we had found. I nuked the Cedarlane Chile Relleno in provided containers. The taste was rather pleasant. However, the product simply oozed everywhere taking away its physical presentation when I tried to cut it. Would I like it in the house again? Yes, the taste overrules the lack of maintained structure. I recommend serving with a VERY SHARP knife. 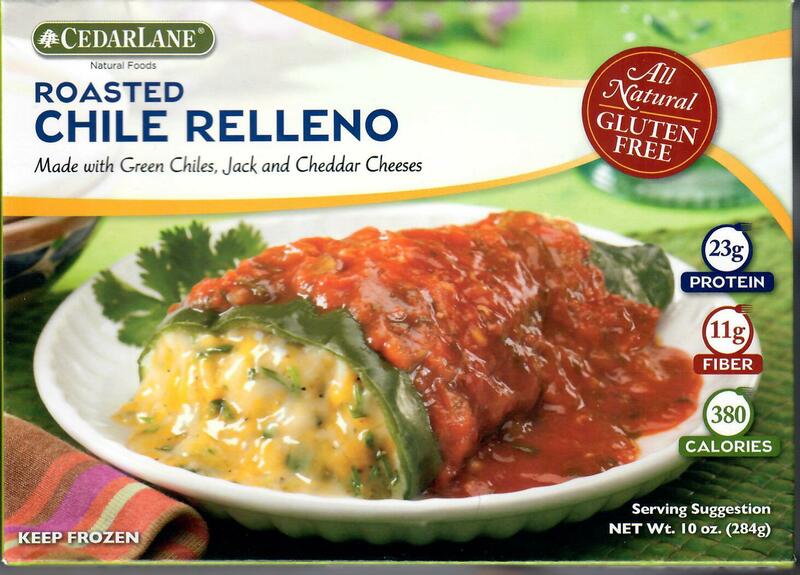 Joyce brought two Cedarlane products home in the first purchase, the Chile Rellenos was the other. I nuked the Roasted Vegetable Tamales in the microwave. I think our Kenmore Elite microwave nukes "cold" so it took about five minutes. Taste was good and so was product consistency. If you are trying to reduce meat in your diet, not a bad choice. Cedarlane seems to be increasing in shelf space at the local grocery store, I think it is Albertson's. Joyce brought this home for one of those "you are on your own tonight" events. I microwaved it and used a thermometer to determine if it was cooked our not. Our Kenmore Elite microwave does not cook / prepare foods anywhere near any labels. The end result was okay. Not particularly tasteful and not totally bland. Nice serving size. 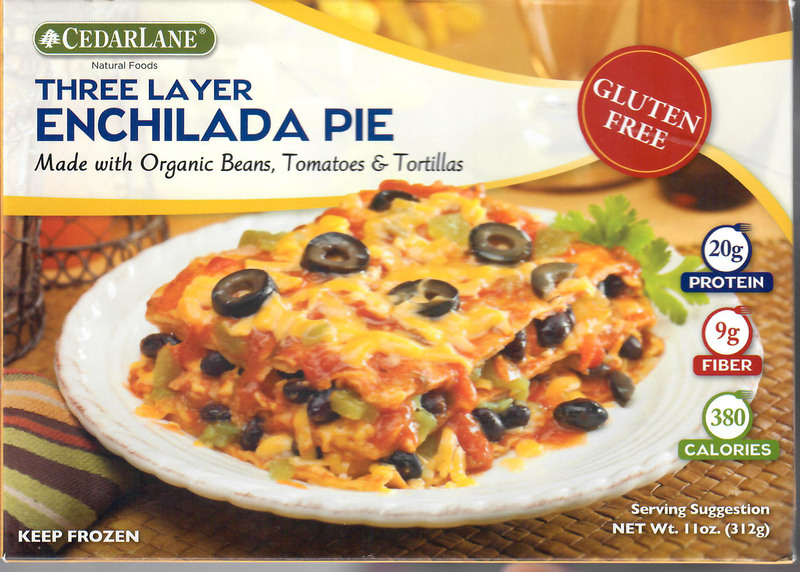 I would put Cedarlane Three Layer Enchilada Pie in the same category as I would corn dogs. If Joyce wants to use them for convenience, fine. Otherwise I will avoid them. Entered or updated June 25, 2017. 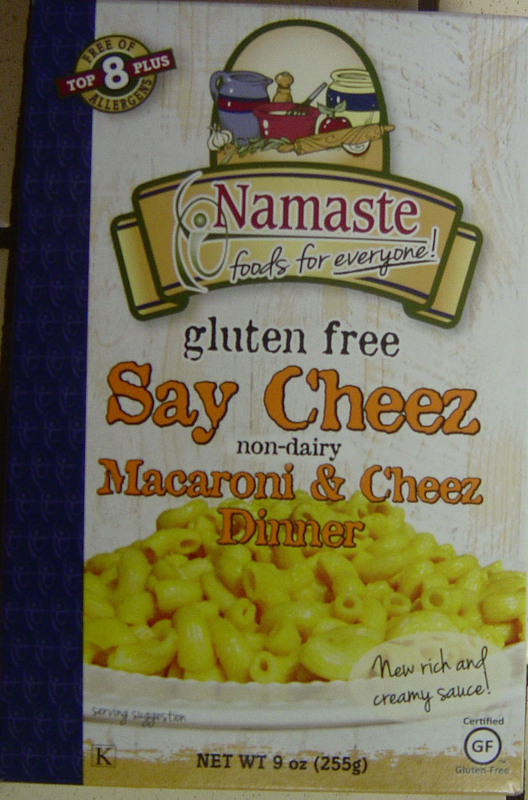 Joyce found these at our neighborhood Albertson's, which seems to be adding more and more gluten-free every day. The instructions say boil for 4 to 6 minutes. I set the kitchen timer for 6 minutes. I should have taken them out at 5 1/2 minutes. Another lesson learned was I poured the pan into a colander. I recommend you scoop them out with a strainer or net. They were "loose" in the boiling water and as they cooled in the colander they "molded" together. Taste and texture were satisfying and worthy of another try. I like fish that tastes something like fish. Joyce likes fish that taste like bread and is rectangular. I like this. It cooked well, tasted well, and left no bad after taste. I think this is our first item with DeBoles. Joyce made it for dinner following the instructions. The contained mix went in as a powder and "clumped" up and those clumps simply would not dissolve. While simple and easy to cook, the clumping issue is annoying when you are reaching into a hot mix to crush these things with your fingers. Joyce gave up on that. Taste is very bland. It needs to be dressed up with peas, carrots, slices of hot dogs, or chunks of ham etc. and that will not change the basic taste. The pasta does hold up in texture and structure during cooking and eating. Not on the rebuy list for us. As stated elsewhere, I tend to like my chicken looking like part of a chicken. These are good. I have prepared them several different ways and they are good in every manner I have tried. This is the first Frankly Fresh product I think we found. I had it for a dinner one evening. The taste is good, leaving no after taste. Not a lot of texture to this product. If it did not show up again, I would not miss it. Neither I nor Joyce have any memory of this. The Full Circle Pepperoni Pizza was pretty good. We baked it in the counter top convection oven, the Kenmore Elite simply does not hold temperature well. However, Full Circle ran second to the Sabatasso's Four Cheese Pizza. As with most pizzas, we have left the Kenmore Elite convection oven and moved to the counter top Oster Convection Oven. Nice, thin, fairly crispy crust. Good taste and good for leftovers if there are any. Challenger for variety with Sabatasso's Four Cheese Pizza. Entered or updated March 9, 2019. 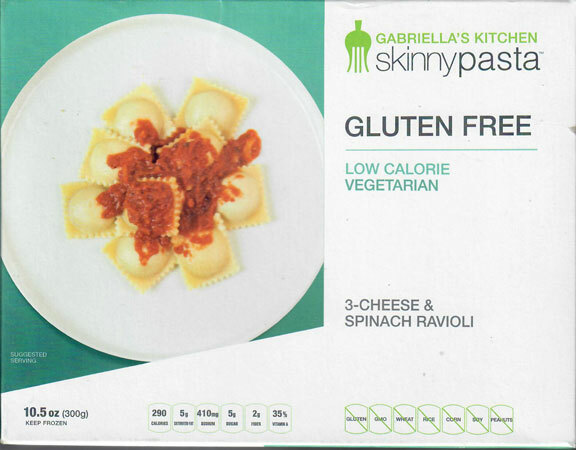 This is the first Gabriella's Kitchen product we found. Not sure where Joyce bought it. Single serving, the ravioli is FLAT. Not much filling. I cut a few pieces open and could not really see anything distinctly. My assumption is 10 ounces of pasta, and a total of 0.5 ounces of cheese and spinach. Not worth a second purchase in my book. If not for the tomato sauce, tasteless. 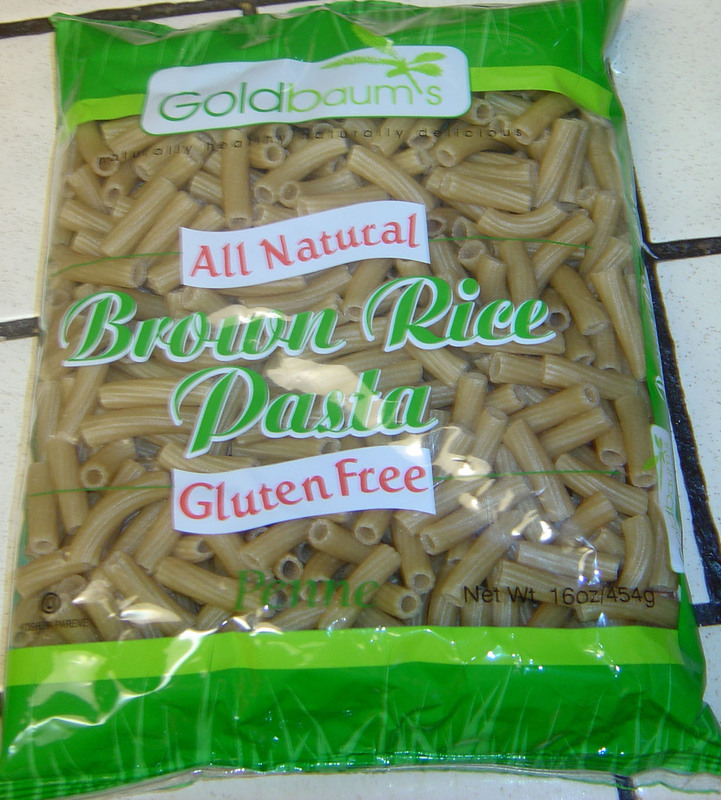 This is the first Goldbaum's product we found. It was located at CostCo in a box of four bags like this so you are going to get several meals worth. 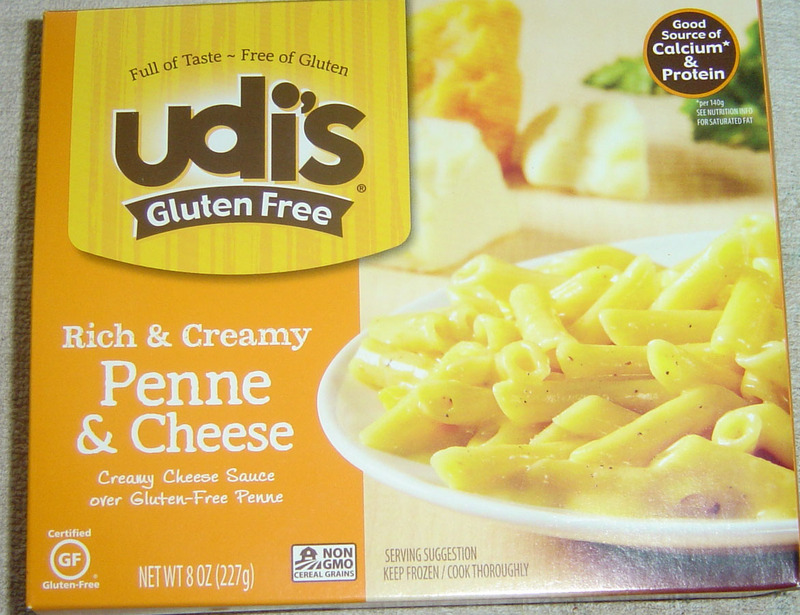 Gluten-free pasta has several issues and as time passes those issues are being solved. First, a fair amount of gluten-free pasta a nap-time effect on me about twenty minutes after the meal. Second, it does not reheat well. Goldbaum's does not drive me to the couch for a nice nap and it reheats pretty well at least a second time. 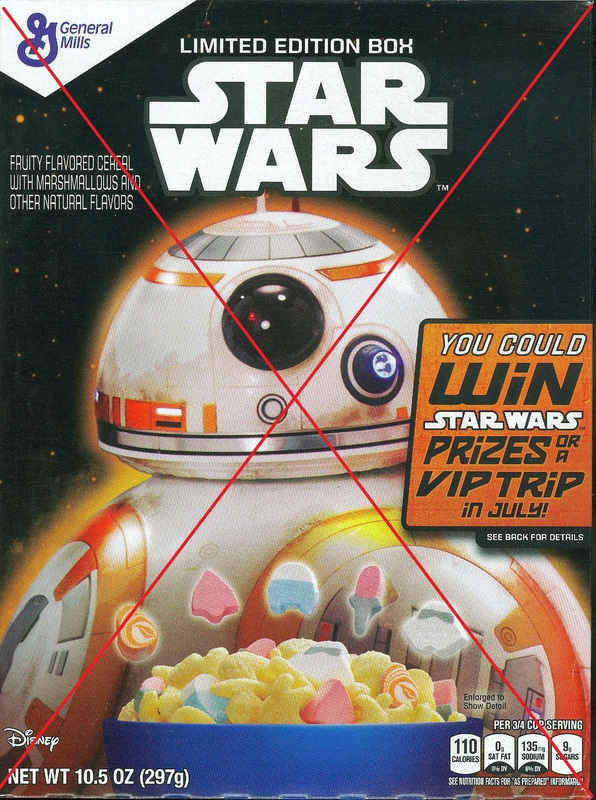 No after taste, not particularly chewy, and no problem in cooking. This will be a rebuy item. Entered or updated January 2019. I kind of like macaroni & cheese. Add peas, corn, string beans, some hot dogs, whatever else you have sitting around to dress it up. Gluten-free noodles are an issue. I found out that the cheese sauce for mac & cheese is also an issue. While Great Value Macaroni & Cheese tastes good, its sauce is runny. Entered or updated February 2019. 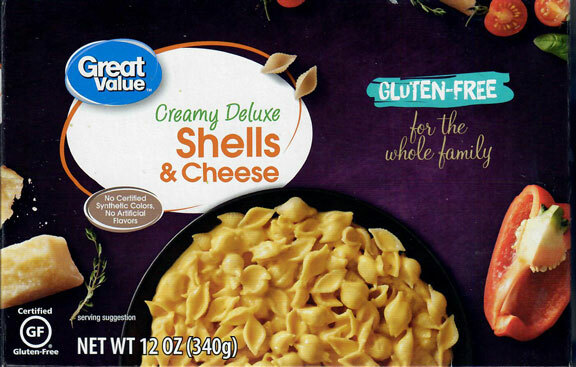 The same basic product as the Great Value Macaroni & Cheese. So we added peas, corn, string beans, etc. and "filled it out." Taste was good, sauce, while not as runny, was still a bit runny. Nice sized meal for two with additions like a salad and corn bread. 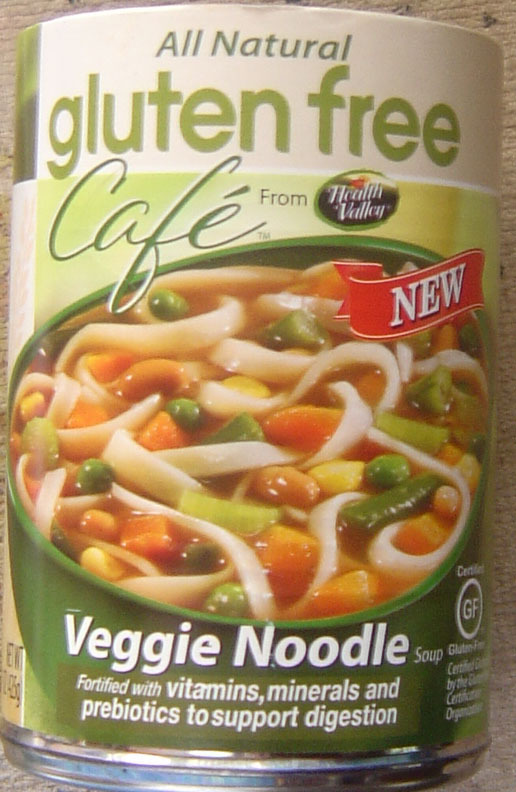 If I can figure this one out, this is All Natural Gluten Free Cafe from Health Valley - Veggie Noodle (Soup). No big deal there unless you are trying to find it by name somewhere. I think this is our first purchase from this company and not sure where we purchased it. It seems "All Natural" includes things like Calcium Phosphate, Niacinamide, Iron (Ferric Orthophosphate), Riboflavin, and Thiamine Mononitrate. Glad I do not have to pronounce them. I am not a scientist or medical professional but this sounds like a bit of a stretch for "all natural." While the vegetables and noodles had good texture this soup has an dominating taste of pepper. Not on my repurchase list for that single reason. I like chili. Great meal for those cold winter days here in San Diego County of 70 degrees. While a bit spicy for the older taste buds, we keep cans of Hormel Chili in the cabinet. One of those go to foods on certain days. I love fish that taste like fish. Joyce loves fish that are rectangular or square. I hate bread on my fish. Joyce thinks a fish item should be 50% or more breading. Joyce likes these so I eat them. They do taste good, as no after taste. I know how I like my fish. Joyce knows how she likes hers. This one surprised both of us. Not heavily breaded, not rectangular or square, and nicely spiced. I love onion rings and at the outset of "living with Celiac Sprue" we tried a number of offerings and numerous make at home recipes. So ended my relationship with onion rings. Then we discovered Ian's Onion Rings. The instructions say bake or fry and Joyce likes to bake since she can do something else while they are baking and frying takes a lot of direct attention. So ... bake it is. Baked these taste good and leave no after taste. In the baked configuration they do not get crispy & crunchy and they go from very flexible to burned and very rigid with nothing in between. I kind of like my onion rings crispy - pick them up and hold them up and they hold their shape. These flop over. Maybe frying solves this issue. Still excellent taste, 4.5 out of 5 stars for the no crispy feature if baked. Another winner from Ian's. These were rather heavily breaded but spiced nicely. They cooked well and held their consistency through dinner. No after taste, no annoying features. Katz is usually a winner and this is not a disappointment. These 6"~7" crusts are about 1/2" thick and are "bare" so you will need sauce and other toppings. Joyce preheated the crusts on a cookie sheet with parchment paper for five minutes. Then she put the "dressings" on the crusts and finished the bake cycle with another ten minutes. They are good and are nicely sized for an individual lunch with a small salad. 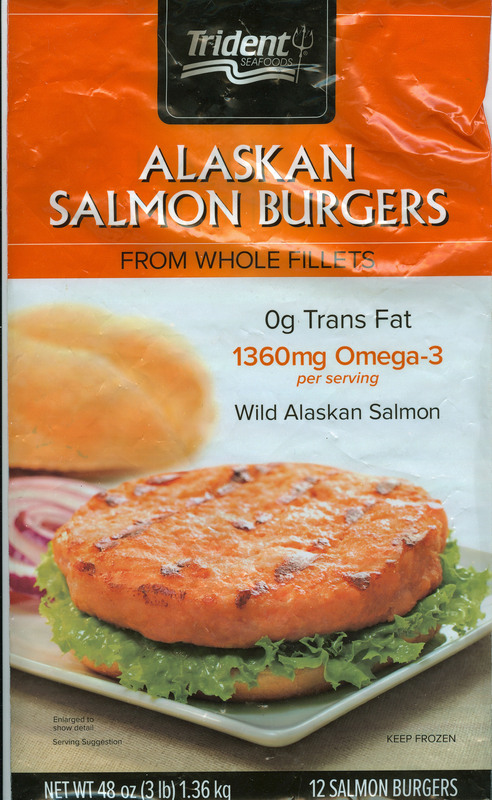 If you follow CostCo, they do a reasonable amount of research and testing most items moving into their warehouses. The instructions were clear. Baked in our Kenmore Elite convection oven with an internal temperature sensor. 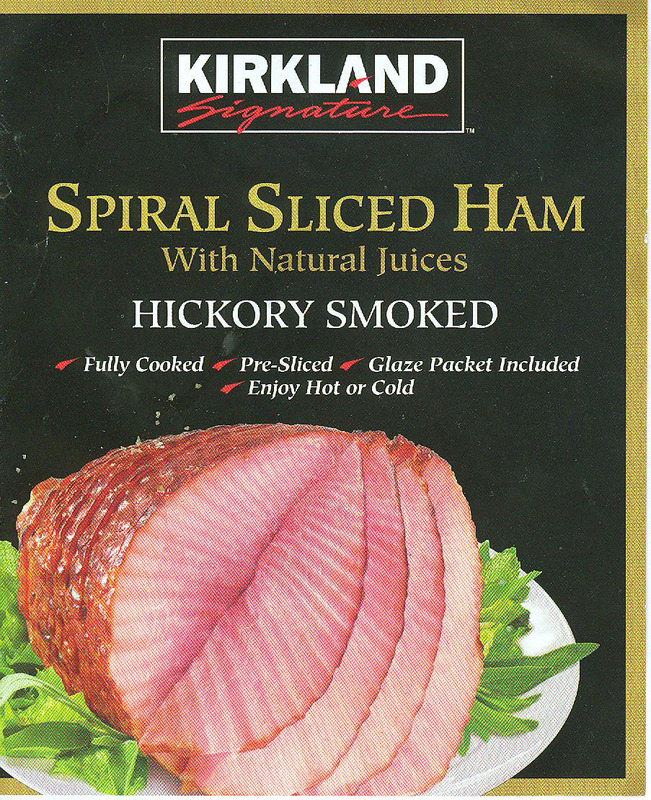 Tasted very good and provided ham for follow-on sandwiches, omelets, etc. This will be a recurring purchase. 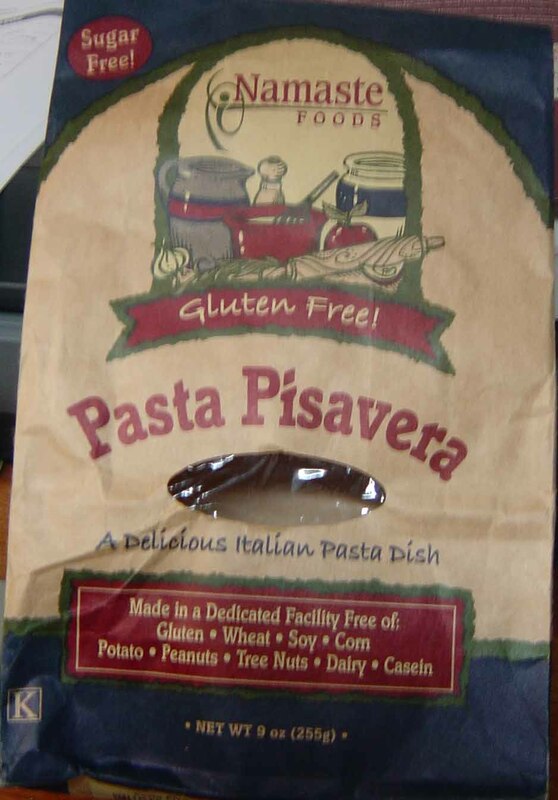 The Namaste Foods Pasta Pisavera was used with a marinara sauce and Italian sausage. The single 9 ounce bag resulted in just over what the two of us would eat at a normal dinner meal which included a small salad. Joyce said it cooked well by following the package instructions. The pasta held together well during cooking and after mixing it with the sauce. Good texture, good taste, no after taste. This will be on the rebuy list if we find it again. Entered or updated January 23, 2015. Mac and Cheese is a food standard. Joyce brought this home and I made it tonight. Following the directions the noodles cooked nicely and maintained the appropriate texture throughout cooking and eating. Nicely sized and no issues with them. The sauce was interesting. Followed the instructions which say whisk until it thickens. I whisked for more than 7 minutes and it stayed very fluid. Finally gave up and poured it on the noodles. The sauce remained pretty runny on the pasta. Not a great choice, not keeping it on the will buy again list. 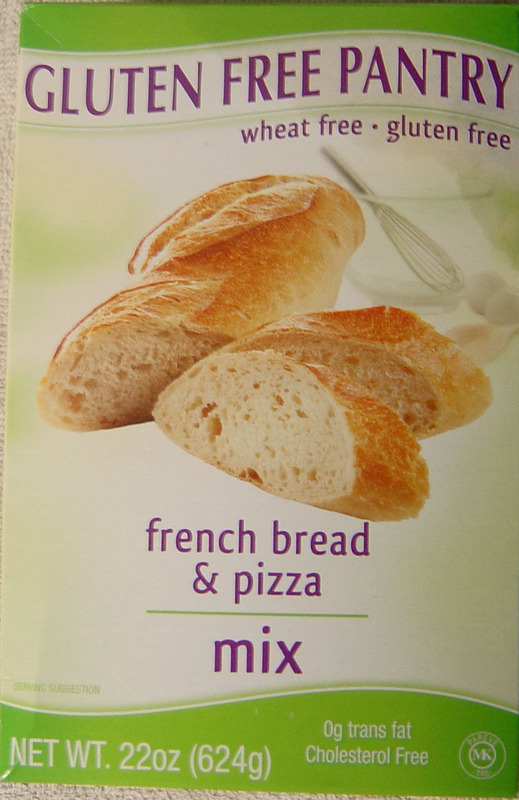 Each package has enough mix for two 14" crusts. Not sure where we picked this up or when. It has been in the cabinet for about awhile and was just outside its Best By date. I mixed it following the instructions with our KitchenAid and the KitchenAid Professional 600 argued with the dough as it started to "set up." It came out of the bowl looking more like the lunar landscape than a dough ball. To roll it out I ended up between slightly oiled sheets of wax paper. The dough was not very sticky, however as pressure was applied, the dough liked to wrap up on the rolling pin. It never rolled "clean and smooth" retaining its lunar landscape appearance. The package says to slightly oil our pizza stone and our pizza stone specifically states DO NOT OIL OR APPLY ANY OTHER SUBSTANCES type instruction. The pizza stone was preheated and the dough looked like it was going to break apart as soon as it was touched. The presented a problem because the pizza stone as hot and would melt or burn the wax paper. The solution was slip one pizza pan under the wax paper. Then remove the top wax paper and place the HOT pizza stone on the dough. Now, take the whole mass and flip it over, take the pizza pan and wax paper off. It worked. The dough remained as one piece - looking like the lunar landscape. Not a repurchase item due to the convenience and quality of other ready made crusts. After 10 minutes in the lowest rack in the convention oven at 425, following the instructions, the toppings were put on. And then baked for another 10 minutes. The Hawaiian style pizza tasted Hawaiian style. No odd tastes, no domineering tastes, no after tastes. The crust stayed together but is extremely crumbly. Entered or updated January 26, 2018. One of the numerous things I miss as gluten-free is a complete salad. 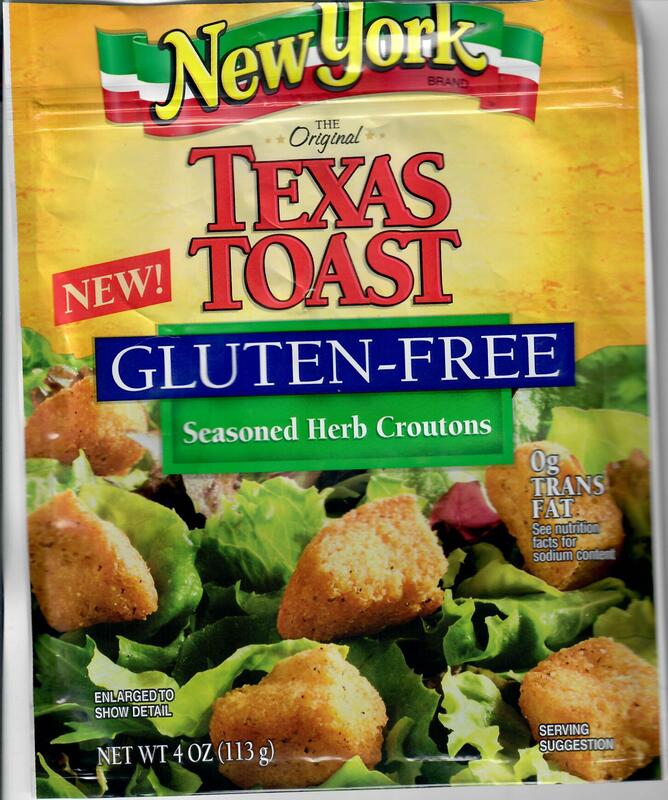 We have found several decent croutons along the way and New York Texas Toast Seasoned Herb Croutons have to rank among the top. Large - (Texas?) and nicely seasoned. Pizza dough has been a problem. Several years ago we were mixing our own and it was so sticky you could not get it off your hands. And if you found one that was not sticky it tasted like cardboard that had been burned. 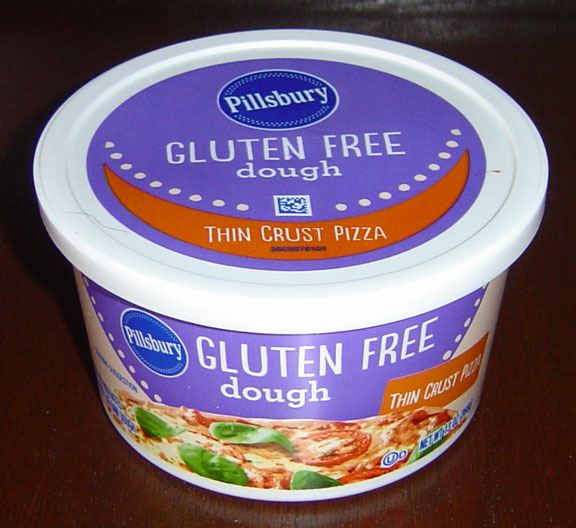 Pillsbury earns 5 of 5 stars for their Thin Crust Pizza Dough. And you can roll it thin - saltine cracker thin, and it bakes crisp. When our local store gets this in we purchase four or five at a time. Pillsbury as a superb, 5 stars of 5 stars, cookie dough in a similar container. Neither product is stocked locally in quantity. Not labelled gluten-free and I checked the ingredients. 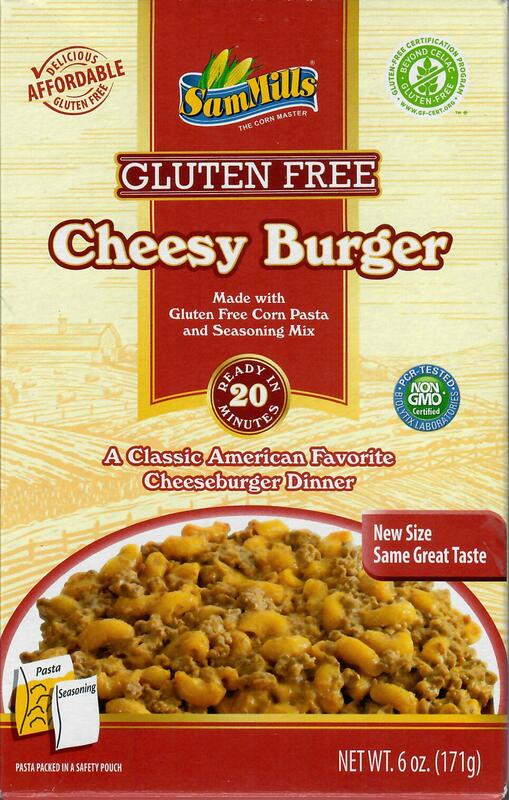 You will need to do this if you purchase it as well until it is labeled Gluten-free. Excellent taste. I consume about two or three cans a month. A piece of toast and Parmesan cheese on top finish this off. I love traditional "white" New England Clam Chowder. 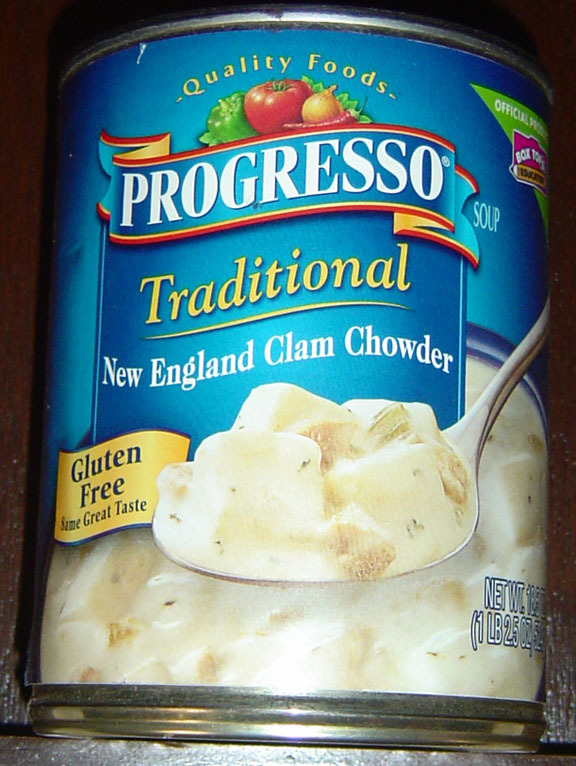 Progresso's Traditional New England Clam Chowder is a five star of 5 star product. With or without Celiac Sprue I would be eating this clam chowder. This pasta cooks well and tastes good. 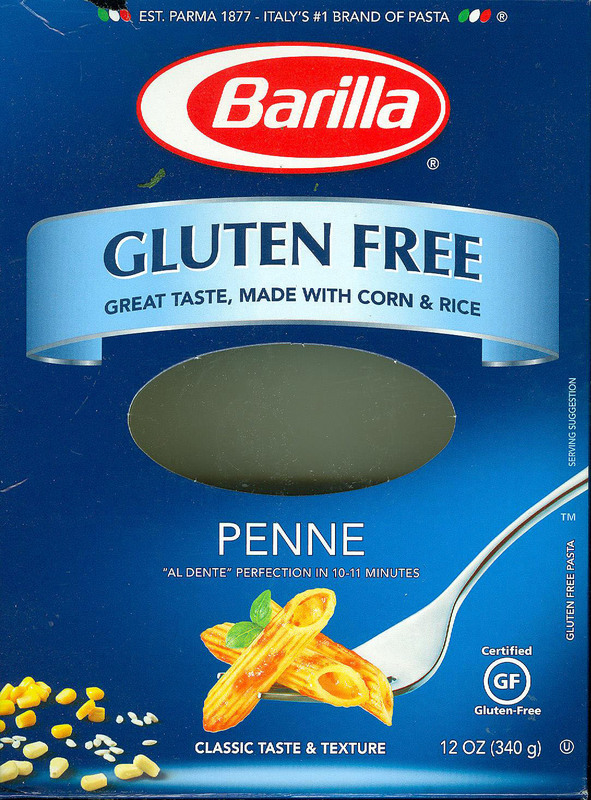 Something we have learned from all gluten-free pasta that I did not notice with "ordinary" pasta, is that you must place it into the pot strand at a time. Gluten-free pasta seems to stick into large clumps when cooking and they do not seem to break apart if put into a pot as a handful and then stirred. Even if the water is rotating at the time the pasta is put in. This is not a comment against Quinoa. 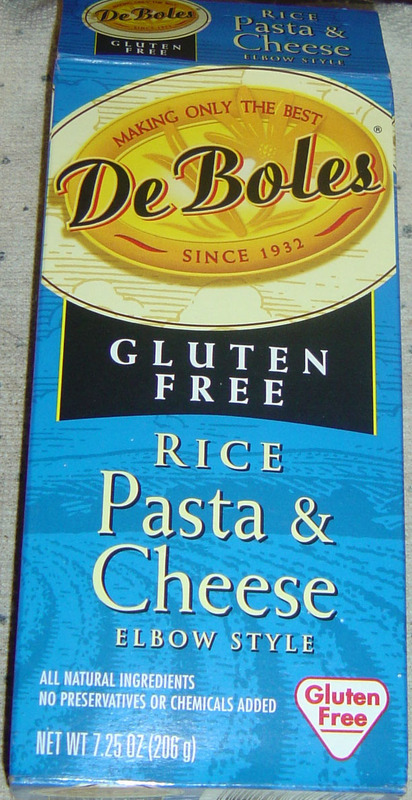 We like this pasta and will select it again if it on the shelf. It cooks well and has no unusual flavors while eating and it has no after taste. 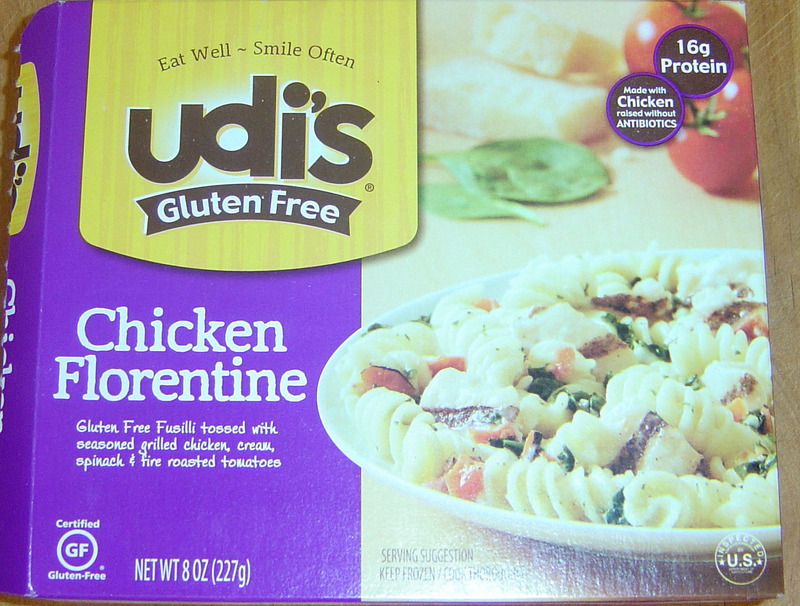 Many gluten-free pastas put me to sleep shortly after eating them. This pasta does not have that effect. Entered or updated April 23, 2015. There are two options, one in a skillet, one in a microwave. I think a microwave "mushes" pasta so it went into the Lodge's skillet on our gas range as a self-contained mix. As the instructions said, in about fourteen minutes the chicken was up to about 165 degrees Fahrenheit so off to the table. There is probably enough in the bag, 2 pounds, 8 ounces or 40 ounces, to be a solid four servings with a small dinner salad and some gluten-free garlic bread. (I would recommend sherbet for dessert, its non-dairy qualities offset spices nicely while dairy conflicts with them.) The presentation on the table is very close to that on the bag - FOR ONCE! The Chimichurri Sauce is a bit over the top but acceptable. Therefore the taste is a bit spicy, otherwise very good with a lot of texture and differences with the mix. I think if you microwaved this, you would lose some of this presentation. The shelf life in a freezer is about eight months so this is most likely a rebuy and put it away for that "need a bit extra meal without much notice" type requirement. In the ten years or so of being gluten-free the quality of pasta has significantly increased. 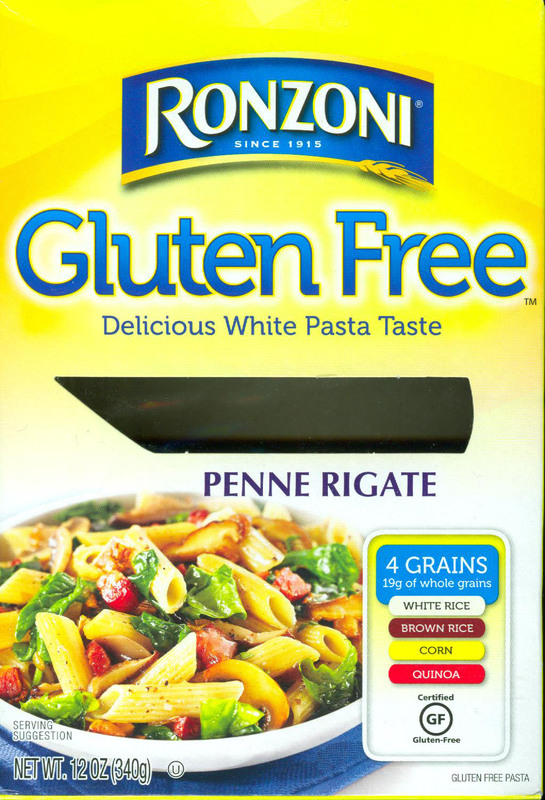 Ronzoni's Delicious White Spaghetti Pasta is easy to cook. 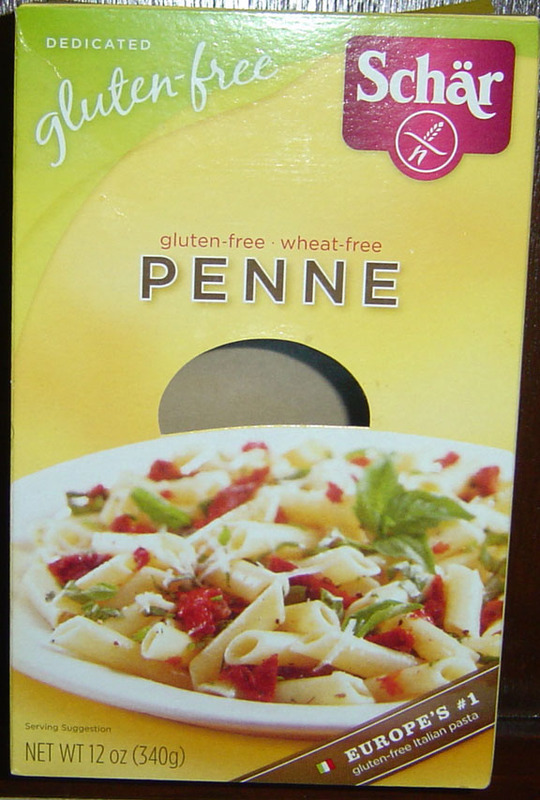 The same comment with other gluten-free pastas, you need to put it into the water strand by strand to prevent clumping. It tastes good with no unusual or unexpected favors, and it leaves no after taste. Not sure if it was the pasta or the day, after our first meal with this I needed a nap. Prior to the meal I had been working outside in the San Diego County sun for several hours at 85 degrees plus. This is another pasta product that if we are purchasing pasta and this is on the shelf, we will take it without reservation. Entered or updated July 11, 2016. Joyce keeps a box or two of this in the cabinet. It prepares well and holds its texture nicely. No after taste, no issues. Joyce uses it for noodle salad. Entered or updated May 15, 2015. 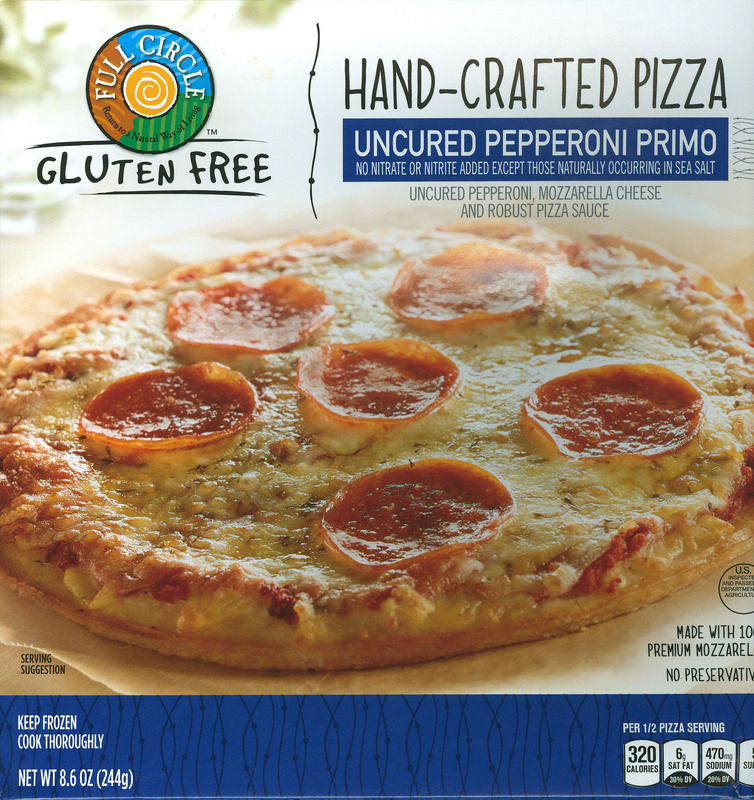 Joyce finds these Sabatasso's Pizzeria Gluten-free Pizza, Four Cheese thin and crispy products at Costco in the frozen food section so they have a relatively long shelf life. (I am not a thick crust or chewy crust pizza guy.) In reading the box, a bad habit, Sabatasso's is a subsidiary of The Schwan Food Company so you may be able to get these "off the truck" so to speak. Out of the box these two pizzas are about 11" in diameter, our measurement, not their statement. We have added pre-cooked Italian sausage to some and pineapple chunks & ham bits to others for Hawaiian style. Tip, make sure you drain the pineapple very well. Both offerings were very good. Our first tries were on a pizza sheet and the very center of the crust was "damp," close to uncooked, so we tried our pizza stone for the next tries. Same results, "damp," close to uncooked, centers. So we tried cooking one on tinfoil for maximum heat transfer - NOT RECOMMENDED. The center of the crust stayed "damp," close to uncooked, and the pizza tore through the tinfoil when we tried to remove it from the oven - more than a bit of a mess. We tried one pizza without any "protection" straight onto the rack. BIG MISTAKE and MAJOR MESS. Oh well. This "damp" center has no unusual taste, just "flexible" while the rest of the crust is rather crispy. All of these were cooked in our convection oven. So, with numerous pizzas out of several boxes "bare on the rack," with tinfoil, with a pizza sheet or with the preheated pizza stone, we got damp" centers. Our latest try was on parchment paper without a pizza pan or pizza stone. The size of the gooey center has been substantially reduced and the pizza came out of the oven without a problem when the topping was done. We tried lowering the temperature 25 degrees and increasing the cook time on parchment paper in our next effort to get a non-gooey crust when the topping is done. Not good either. Success #1 - Kind of. We had been using the "convert conventional oven temp to convection oven temp" for 425, which is 400 up to this point. We went straight to 425 on the convection oven, put the pizzas on parchment paper, cooked them for 12-14 minutes and they come out FANTASTIC!!!! With this process pizza has returned to finger food. Now whether you do squares, my personal favorite, or wedges, dig in with the paws. These guys now get five stars for taste and five stars for crust cooking consistency. Before updating the page we have cooked four pizzas with the same results. Kenmore from Sears gets no stars for properly converting conventional oven temps to convection oven temps. Success #2 - Working towards perfection. I tried something else since the parchment paper concept occasionally results in an overcooked or burned topping, including cheese, before the crust in baked. Joyce bought a "screen" that has 1/4" holes for the barbecue grill which is intended to keep food from falling through the grate. In convection mode I preheated the oven to 450 with the pizza stone inside for about 20 minutes. It takes a while for the pizza stone to come up to temperature. Then I set the temperature in convection mode to 425 for the pizza. I put the pizza in on the open rack with the screen underneath it in convection mode so the air circulated. After about 10 minutes I slid the pizza from the screen onto the pizza stone for two or three more minutes. The heat from the pizza stone turned the crust into a light brown. The crust was done through and through but still lacks "rigidity." Next try will be an earlier, around 8 minutes, transfer to the pizza stone. I think part of the solution, which seems to take a bit more work than desired, is to have the pizza baked in the convection, circulating air mode, then let the pizza stone "toast" the crust for several minutes. Note on our Kenmore Convection Oven. Not impressed with its temperature control or accuracy of the temperature. With two different oven thermometers it runs low or cool consistently. The difference between the digital display of "set and held" temperature and thermometer temperature depends on the mass in the oven. More mass, more differential - a science thing but the unit cannot seem to generate heat quickly to replace the heat absorbed by the food in a baking process. It appears that Sabatasso's has changed their box. Seems to be the same product. I found the new boxes at CostCo in San Marcos, California. Poway, California is still a no joy on this product. Entered or updated July 11, 2015. This is another item Joyce keeps around the house. With pasta, as the center of meatball sandwiches. Quite honestly, I do not taste the provolone or tomatoes. Still good. Joyce tops them with spaghetti sauce and cheese for a very good sandwich. Entered or updated November 2017. Entered or updated August 2018. This is the second try of a Sam Mills product. Joyce is not sure where she found it, most likely MCAS Miramar Commissary. Easy to fix and went on the table nicely with a small salad. Tasty with good texture. Entered or updated May 2, 2015. This is the first try of a San Pedro Fish Market product. And the very next day after this dinner we received Consumer Reports, June 2015 issue, which had a super series on shrimp. And one of the important things learned was identify where the shrimp come from - The package states farm raised in Vietnam. 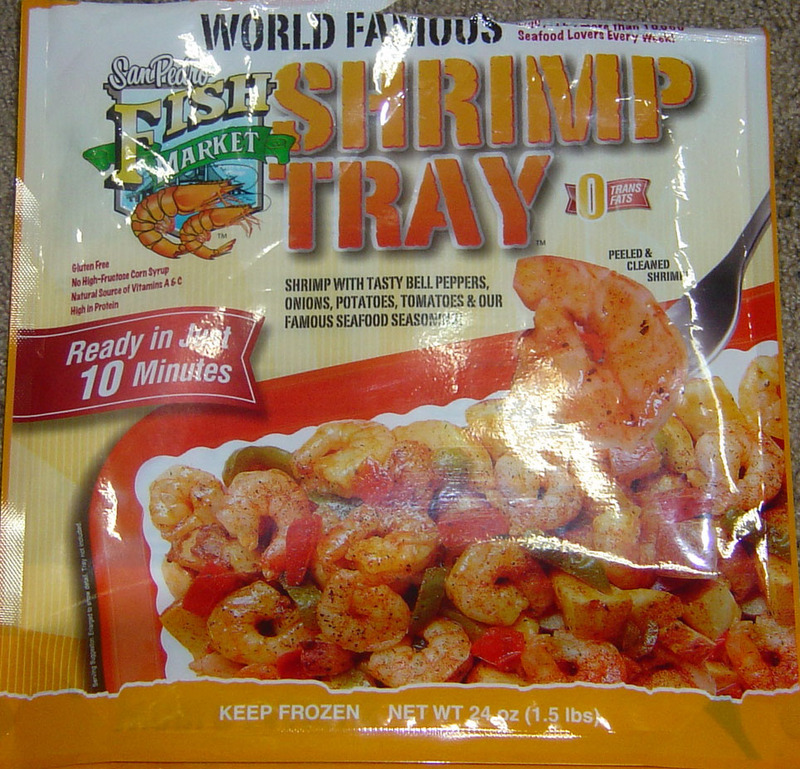 The packaging is good - a package of vegetables, a package of shrimp which had consistent size with farm raised, a package of oil for the pan, and a package of seasoning. I "fried" it in a large, covered, skillet on our gas range with occasional stirring for ten minutes. I tried a potato and it was HOT so I figured it was done. Turns out that some of the potatoes were almost done, warm all the way through but not hot, my fault. The "presentation" was less shrimp than the package indicates but a good ratio of shrimp to vegetables, very pleasing in this factor. I served it on steamed rice and it served two very nicely. Thirty years ago I would have thought the spices were "adequate." Today I think I will add about 75% of the spices next time. Slightly intimidating on the spice side. This is a rebuy. Shelf life indicates about twelve months so it can be a keep in the freezer for the kind of special meal. Schar is normally a pretty safe move for gluten-free. Here is their Penne pasta. Works well in ravioli and other dishes. No after taste, no problems cooking. 5 stars of 5 stars from the cook and the eater. Schar is generally a safe bet. The preparation required will generally follow the provided instructions and will usually closely follow their glutenated relatives. The taste of Schar products will usually satisfy even those that did not win the Celiac Sprue lottery. Their gluten-free pizza crust is no disappointment. In the boxes we purchase there are two pre-formed crusts and each is about a 7 1/2" crust about 3/8" in thickness. Joyce has figured out that if she bakes the crust without any toppings for about four minutes first it makes the crust a bit crisper. The results reheat okay in a microwave but a convection oven works better. 5 stars of 5 stars for these guys. Schar's Spaghetti Noodles follow the same run as most of the other Schar products. Cooking these has the same issues as glutenated spaghetti noodles, 30 seconds short and they are chewy, 30 seconds too long and they are mush. 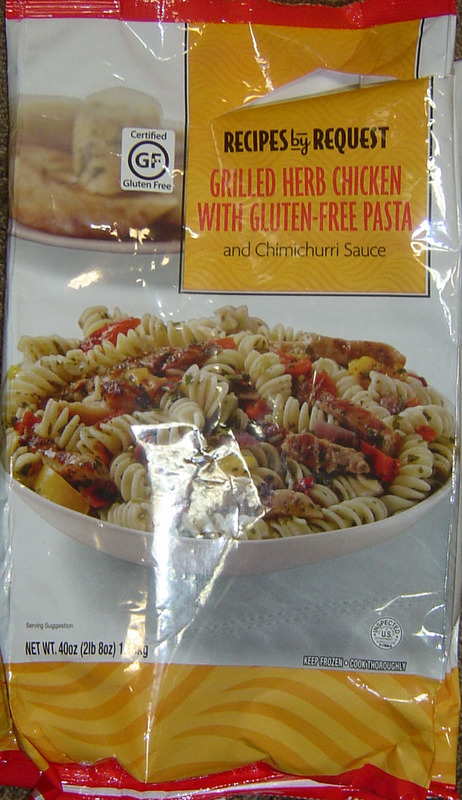 The difference is while glutenated noodles may have an "acceptable cook range of two minutes, the "acceptable cook range of gluten-free products is much smaller, such as 30 seconds. Following the instructions has not led Joyce wrong in preparing these. HOWEVER, do not ignore them for any amount of time. On the dinner table they taste good and leave no after taste or "heavy" feeling other than that related to the amount you ate. A standard for Schar, 5 stars out of 5 stars. I like fish. 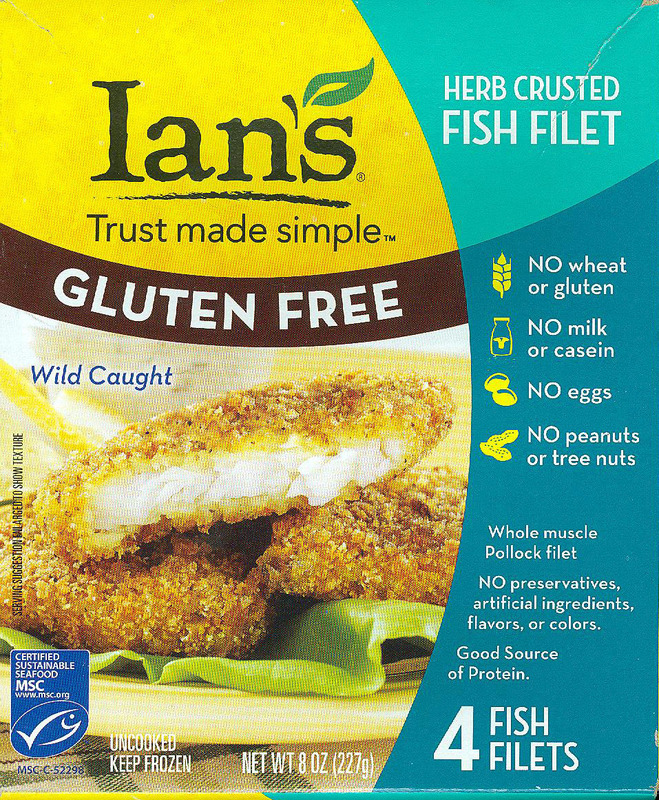 I do not like fish that are rectangular or square and have tons of breading on them. 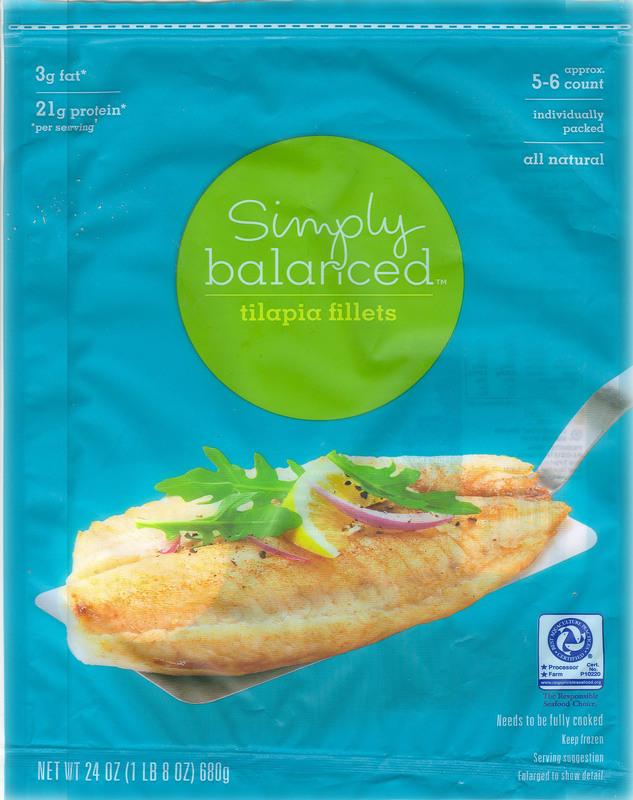 I like Simply Balanced's Tilapia Fillets. I prepare them in the Oster counter top convention oven or I fry them in the Lodge frying pan. Good either way. Remember, with fish, always have bread available for the bone lodged in the throat issue. The Sonoma Flatbreads BBQ Chicken & Bacon Pizza is actually the third of different varieties of the Sonoma Flatbreads pizzas. Joyce likes the variety of taste. I prefer consistent quality. 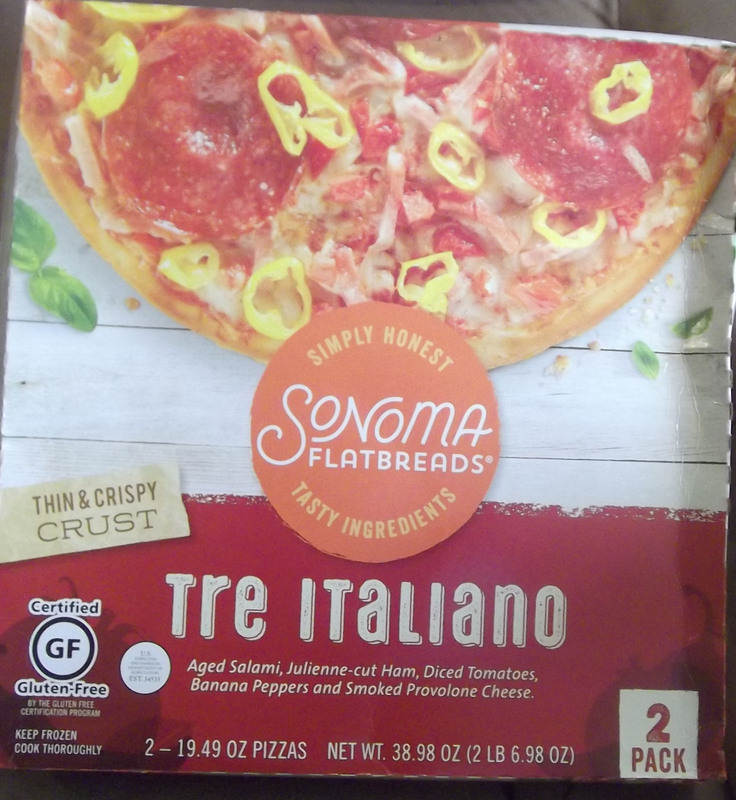 While the BBQ Chicken & Bacon Pizza may come into the house occasionally, neither it or the Sonoma Flatbreads Chicken & Smoked Gouda Pizza will be a consistent purchase. Clumped meats on the product and an overly aggressive assault of taste are the two major factors. Entered or updated January 24, 2017. Sonoma Flatbreads Chicken & Smoked Gouda Pizza is a new addition at CostCo. So far we have baked four in the Oster counter top toaster / convection oven. Joyce likes them and I agree with her that they have a different taste than most other pizzas. However, the chicken has been clumped into two or three piles on the pizza. Frozen in place before baking and once baked, you really tear up the cheese when you redistribute it. For its difference in taste, which is almost enjoyable, the frustration of having two or three clumps of meat on the pizza exceeds the taste factor. Joyce will continue to buy them, I will continue to eat them. However, I will not enjoy them due to their structure and layout. I prefer only their Supreme variant. Sonoma Flatbread has a problem that totally annoys me. Once again the toppings of this pizza were clumped rather than distributed. While the Sonoma Flatbreads Chicken Rustica Pizza prepares well in the Oster counter top convection oven and the taste is acceptable I have asked Joyce to purchase no more Sonoma Flatbread pizzas. Entered or updated October 11, 2017. Sonoma Flatbreads Sausage & Kale Pizza was "interesting." Not a fan of eating a bunch of salad on my pizza. The toppings on this pizza were actually fairly well distributed, contrary to the track record of Sonoma where they are commonly piled in one area. Joyce thought the taste was unusual and interesting. I thought we should be buying a different brand. That taste, in my opinion, while interesting, is confusing. 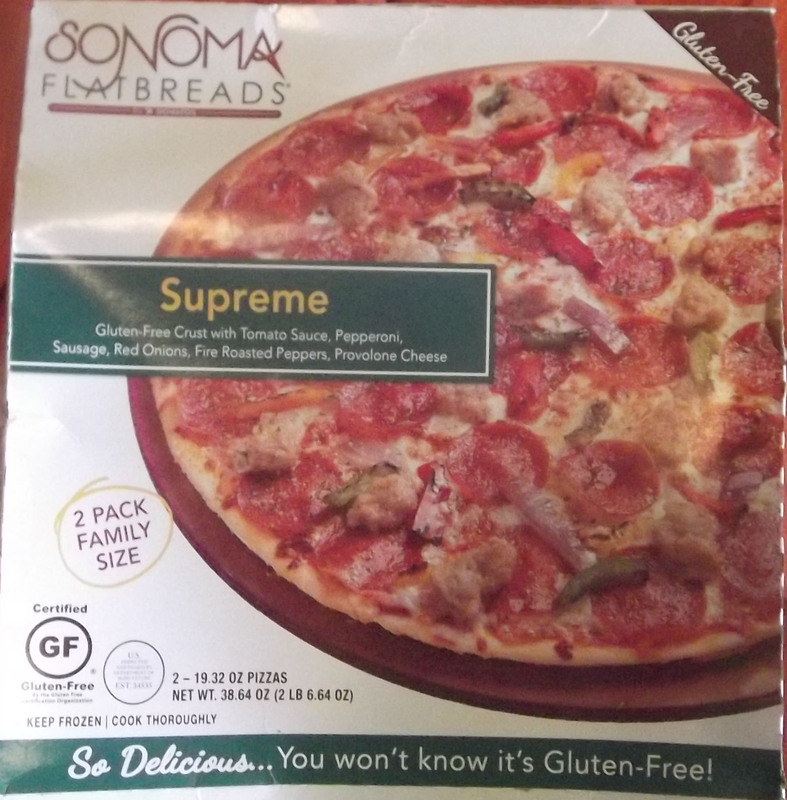 Sonoma Flatbreads Supreme Pizza is a new addition at CostCo. So far we have baked four in the Oster counter top convection oven with the 12" round cooling rack underneath to support the crust. Half way through baking we rotate it to prevent a burned edge. It bakes well and tastes great - this comment, updated March 26, 2017, is applicable only to the Supreme. Joyce really likes it as it is complete with toppings. With the Sabatasso's Four Cheese Pizzas, addressed elsewhere, toppings such as Italian sausage or ham & pineapple must be added. Entered or updated February 7, 2018. CostCo started this, I kind of hope it is a short live trial. First, taste and texture - pretty darn good - if you like salami and banana peppers on your pizza. I am not a big fan but could be if .... And this is where Sonoma consistently fails. The toppings were pretty much in two heaps on both pizzas. The salami was piled on about third of the pizza, say from 12:00 o'clock to 5:00 o'clock. The banana peppers were kind of piled on another third of the pizza, say from 5:00 o'clock to 9:00 o'clock, from 9:00 to 12:00 o'clock it was a cheese pizza. Trying to move the toppings while frozen, pre-baking, impossible. Trying to move them after baking gets you burned fingers and torn apart toppings. 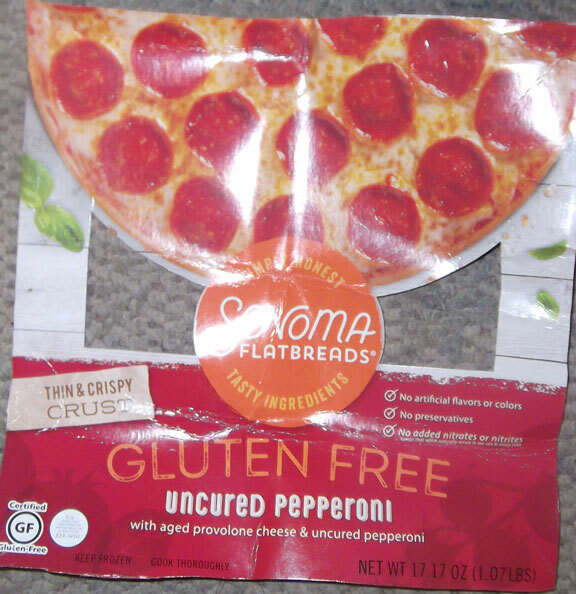 Sonoma Flatbreads pizzas consistently fall in this clumped topping realm. Undesirable. Entered or updated October 27, 2018. While not bad, just not good enough to take us away from Sabatasso's Pizzeria Four Cheese Pizza. Baked for the instruction time at 425, as instructed, and the crust was very chewy while I prefer crispy. Joyce's comment was that the overall product is very sweet. Entered or updated November 26, 2018. Joyce thinks this came as part of a gluten-free bundle she purchased somewhere. In mixing the dough I used the bread hooks on my Oster and it worked well. The dough spread to cover about 12" as expected and was about 1/4" in thickness. To spread the dough I used the back of a cold spoon occasionally dipped in oil. This stuff, like most gluten-free doughs, is VERY sticky. I pre baked the crust on a ventilated pizza pan on our pizza stone, which had been preheated to 400 degrees for about 20 minutes. The dough rose to be about 3/8" thick. With the sauce, cheese, and toppings, back on the pizza stone without the ventilated pizza pan. The crust came out golden brown, nicely baked. Even with the pre baking the crust was towards completely baked and chewy and a bit too thick to make me happy. If we try Tastefully Simple Pizza Crust and Sauce Mix again I will work to get it very thin. Taste was good. Crust, bread, in the real world, should be close to tasteless unless intentionally seasoned - ryes, etc. Wheat by its chemistry is tasteless and sandwiches and pizzas should be tasted for their sauces and toppings, not the crust. Not sure where Joyce picked this up. The label states "Just add corn and water." Joyce added frozen corn. The package states "Makes about 6 servings" and I agree. 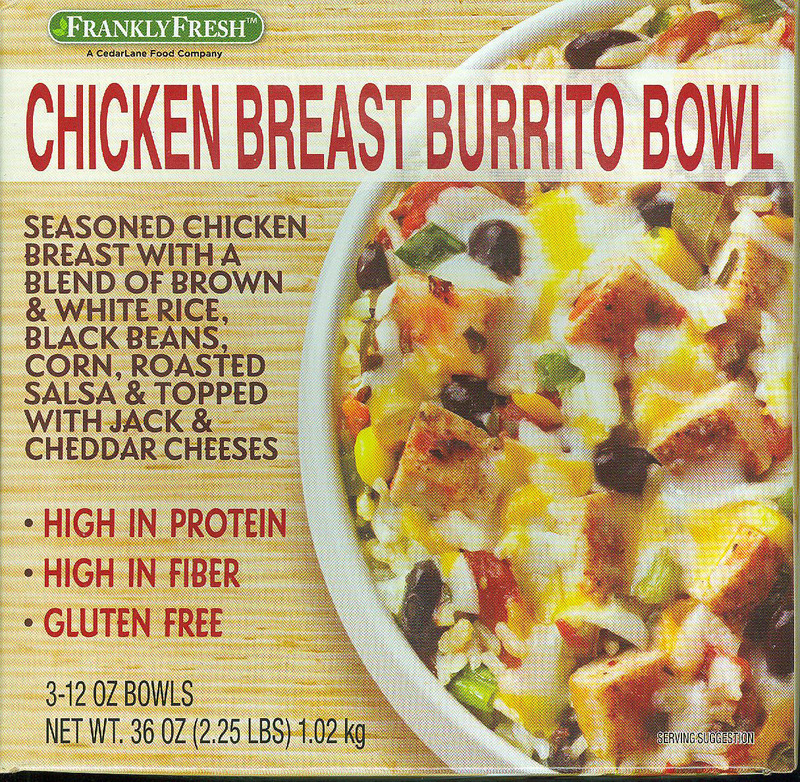 We had full bowls for dinner, I had some for lunch the next day, and we finished it as dinner a couple of days later. Twenty years ago I would have really enjoyed this level of spice. Today it is just a bit over the top. If Joyce buys it again, we will eat it. If she does not, I am not going to ask her to find it. Good, satisfying, just a bit too spicy to really want her to hunt it down again. This is the first Tinkyada product we have found or used and it cooked correctly and tasted excellent. With lasagne some prepare it shallow and wide as in a cake pan. Some prepare it deep and narrow as in a bread pan. I prefer the bread pan as it seems to hold a bit more moisture but takes a bit longer to cook. Paste in a gluten-free world seems to be a problem. Two seconds under cooked and it is tough and chewy. Overcooked two seconds and it is a gooey mess. Joyce followed the directions on our gas fuel stove and it came out perfect for texture. No after taste, no problems cooking. 5 stars of 5 stars from the cook and the eater. Not sure where Joyce found these. She knows I love fish so home they came. Not bad. I actually made a sandwich out of a couple and ate a couple as fillets on the plate. Good both ways. Not sure where Joyce found these. She knows I love fish so home they came. 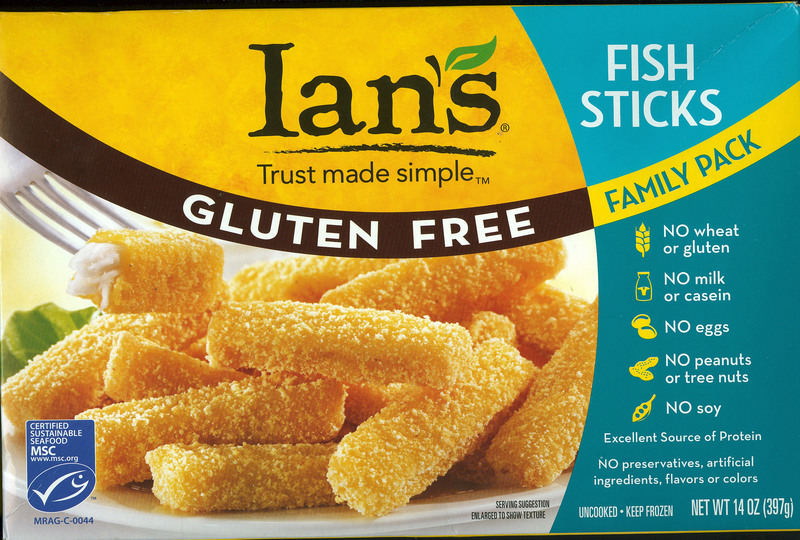 They are "fish nuggets" if you will. About an inch in diameter balls. Obviously a way to recover and sell small bits compressed into something edible. Still, good, spiced nicely, tasty. 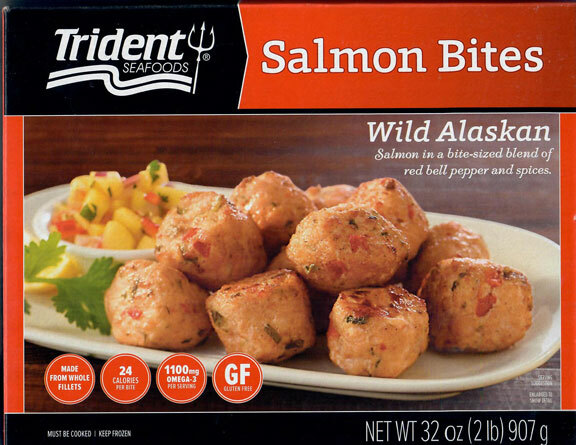 The box says "Wild Alaskan." 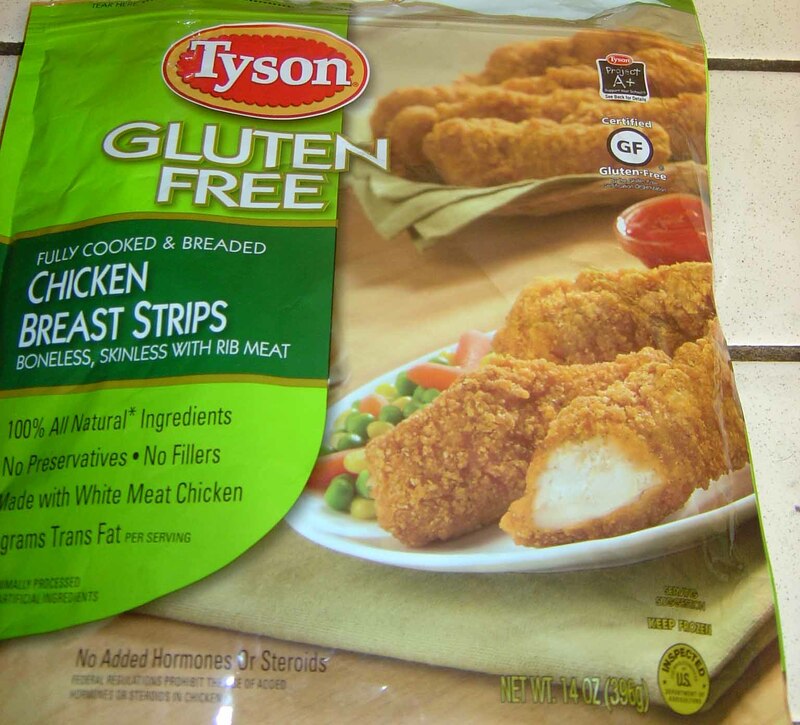 Tyson is usually a very reliable company to deal with and their Tyson's Breaded Chicken Breast Strips continue that trend. There were only four good sized pieces in the bag so it was one meal for the two of us with mashed potatoes, vegetables, and a small salad. Joyce followed the package instructions and they heated through and through in our convection oven. Taste and texture were superb as dinner plate items and would probably make a great sandwich on a sub bread type roll. Joyce said the price was reasonable at Albertson's so they are on the rebuy list without a reservation. 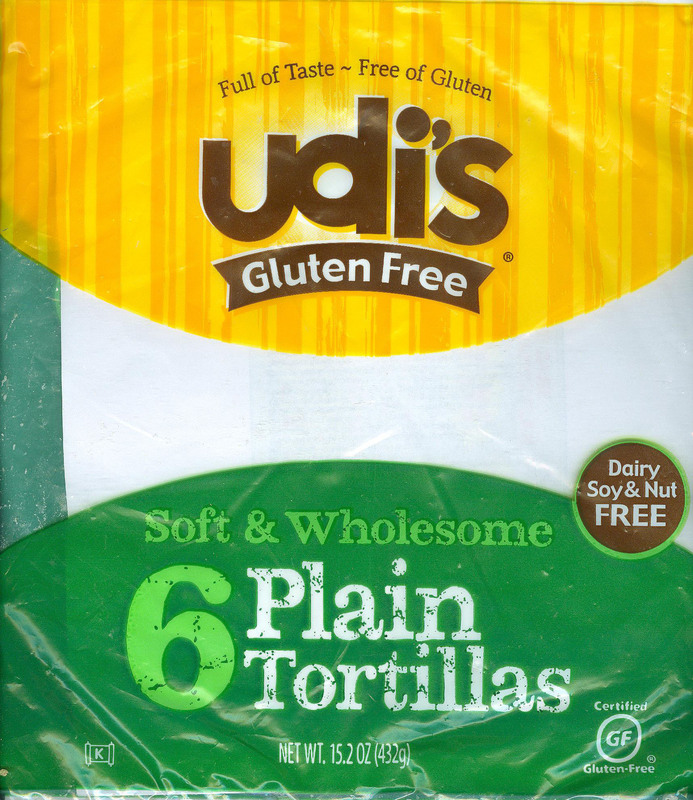 Udi's is becoming a gluten-free standard. Our daughter found these at Target, which is carrying more gluten-free on every shopping trip. The instructions are simple, create some slits, nuke it until at least 165 degrees Fahrenheit. The kitchen thermometer protects you against the under cooked poultry issues. It cooked as the instructions stated and after the minute or so sitting to stabilize the temperature, lunch began. The product in the package is actually pretty close to the picture on the package. The taste was enjoyable. If these showed up in the freezer again, they would end up as that kind of extra special lunch. In the pre-Celia Sprue world Joyce made, and I ate, tons of lasagna. 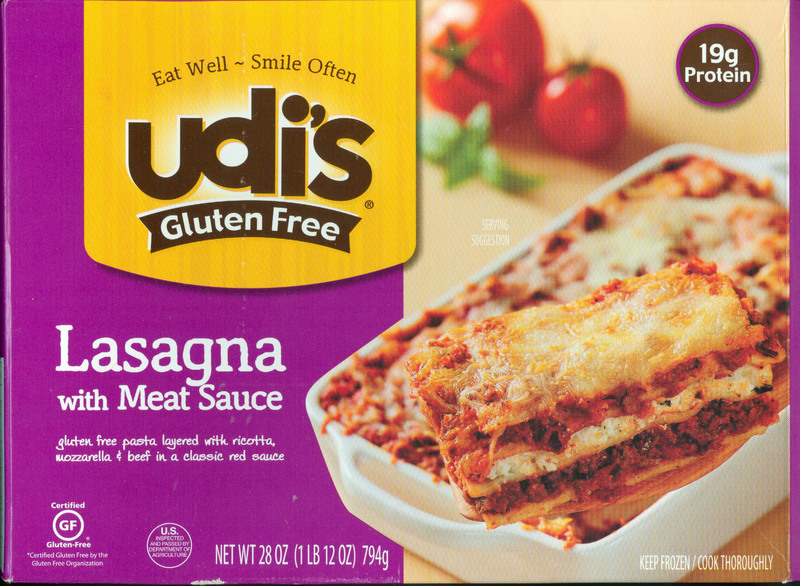 She is still making great lasagna and I prefer her homemade lasagna with gluten-free noodles listed elsewhere here. 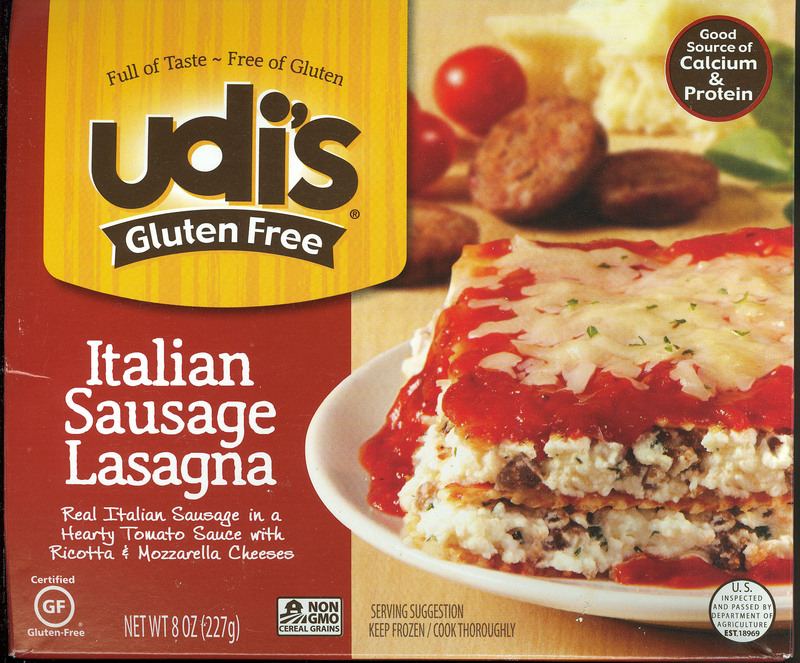 However, Udi's Italian Sausage Lasagna is good. Joyce likes the time saving fact it is heat and eat. I can handle that. Not bad tasting. Entered or updated March 7, 2015. 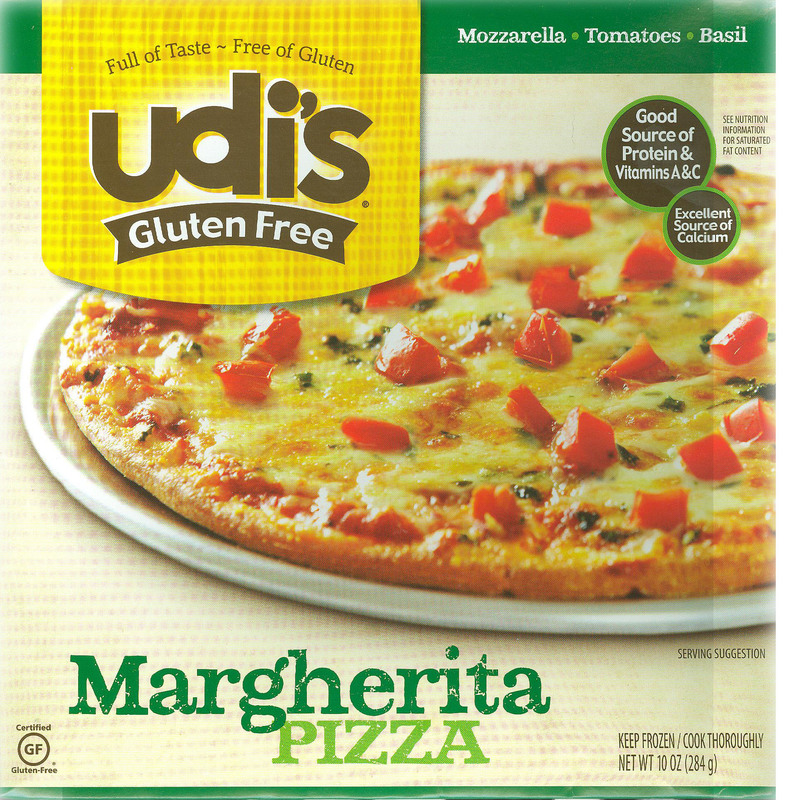 Udi's Margherita Pizza is different. I am kind of a basic pizza guy. Thin crust, Italian sausage or ham and pineapple, or plain. Pepperoni is on the far back burner. This surprised me. Different and tasty. Joyce brings one home every once in a while for heat and eat. Variety when the quality is good, is satisfying. Udi's continues to deliver. An expensive name for Mac & Cheese, this is good. The instructions are slit the top, nuke for a bit, stir, nuke for a bit, wait, stir, eat, and it works. The cheese retains heat. The finished product looks like the box cover. 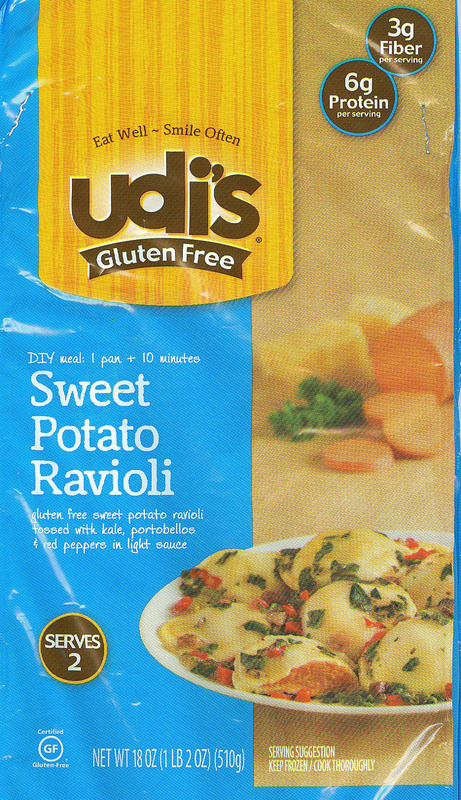 Another Udi's product that may sit in the freezer in small quantities for that special lunch or light dinner. I do not remember this item and will update it if we purchase it again. Entered or updated March 26, 2017, Post crash. 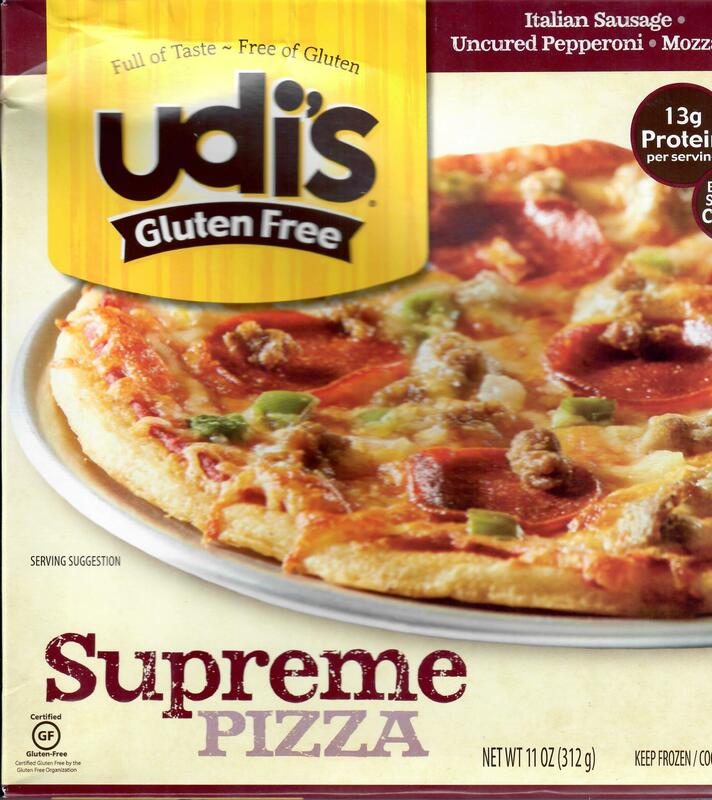 Udi's Supreme Pizza is rather supreme maintaining Udi's level of quality. Sized a bit too big for one person and a bit too small for two it requires a good sized salad or garlic bread to be the main part of a lunch or dinner meal. It was baked in our counter top Oster Convection Oven nicely in accordance with the instructions. We turn the product 180 degrees about half way through the bake cycle or the product at the fan gets burned. 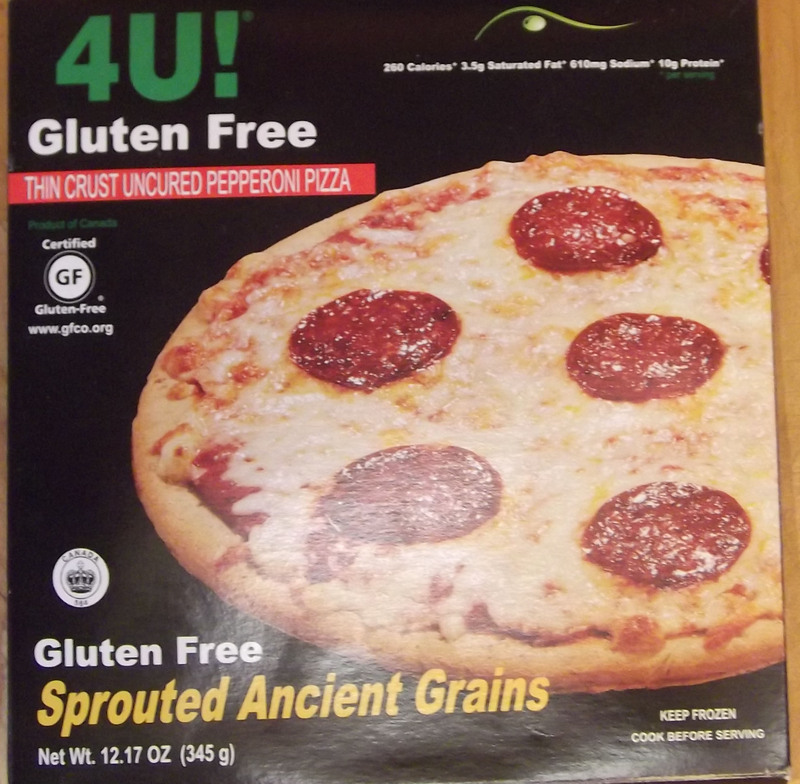 When I won the Celiac Sprue lottery pizza was totally out of the picture. Manufacturer figured out it is a demanded product. There are many out there now. While the Udi's Three Cheese Pizza is good, it loses to Sabatino's and now Sonoma Flatbreads. Nothing bad, just not as good. 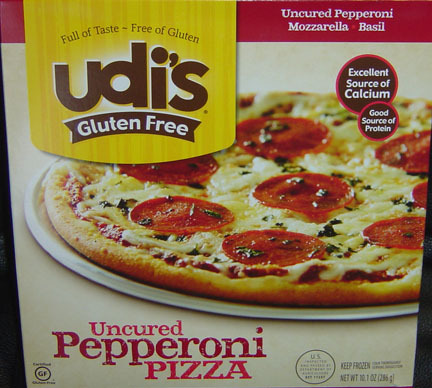 Udi's as addressed elsewhere, is generally a safe bet when going gluten-free. This pepperoni pizza is no different for taste. The instructions, which include gas grill information, say put the crust directly on the oven rack, do not use a pizza stone or pizza sheet. Every time we try the pizza crust rips and falls through the rack making a decent mess. While the instructions say do not use a pizza stone we have preheated our to temp with an indirect reading thermometer before putting the pizza on it and had good results. Our oven's rack wires are about 1 1/4" apart so we tried a cookie cooling rack under the crust. This allows you to lift the pizza out by lifting the cooling rack. Once on the table same issue, the crust easily tears. Taste-wise and overall satisfaction is good and we will be buying more. Boy, there are a lot of words in this title for a conservative guy. It hit the plate smelling great, it tasted great, it left no after taste. Joyce has looked for it again and it has not been there. Missed product. I am not sure where Joyce buys these. However, they show up about once a month without a problem. She does them on the grill and has rice and other stuff on the side. Fun meal. 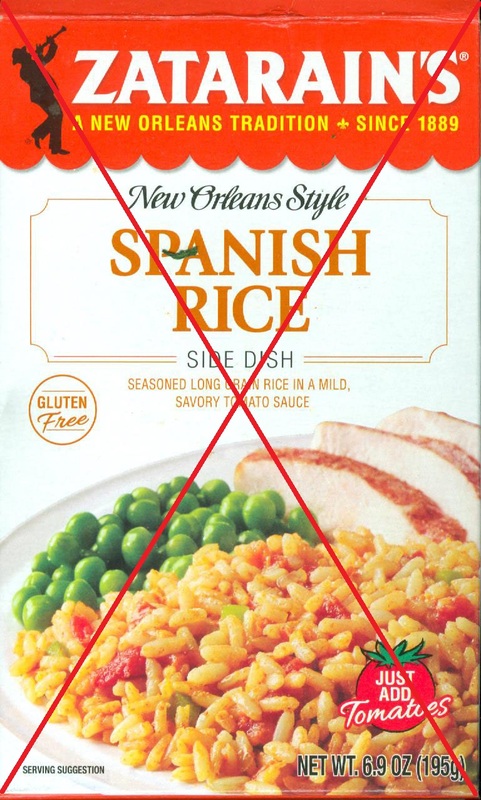 Zatarain's Spanish Rice is a staple in the cabinet. Joyce loves it. It is a bit spicy for me so when it is on the table, so is sour cream to bring it down a bit. No memories of this product. Cooking instructions are a guideline so change them as you will, baking instructions are a formula, follow them to the letter. I made these today and tried them out. Maybe I was expecting them to rise a little more in baking, they came out the same basic size they went into the oven. I baked them for 18 minutes, the instructions are 16~18, in our convection oven at a "convection conversion" temperature of 375. The photo shows how they came out, the dinner fork is for a size comparison. While they are warm they were soft and chewy, as expected, and tasted very good. As they cooled off, they kind of "set in" becoming a bit harder and more chewy, also as expected, still tasted good. At this size and density, probably a very good size for a reasonable snack or add-on to breakfast. Not one of those "here's the calorie count of the next week" cinnamon rolls you find at the fair. Even warm or cold, they are good and will most likely be a rebuy item when the Udi's Cinnamon Rolls are not available and I have the taste for cinnamon rolls. Not sure where or when we got this package. The "best by date" was a couple of years ago so it is "new old stock." Joyce followed the directions and inserted an apple butter type filling. Baked it in the convection oven for the recommended 30-35 minute time at the stated 375. The end product came out very nice. And like the Chebe's Cinnamon Roll Mix #1 mix, not that county fair kill the calorie count for the next six weeks type size. Taste is very good, size is right. Maybe another roll to get crowned royal with vanilla ice cream after dinner. A rebuy if we find them in this package. 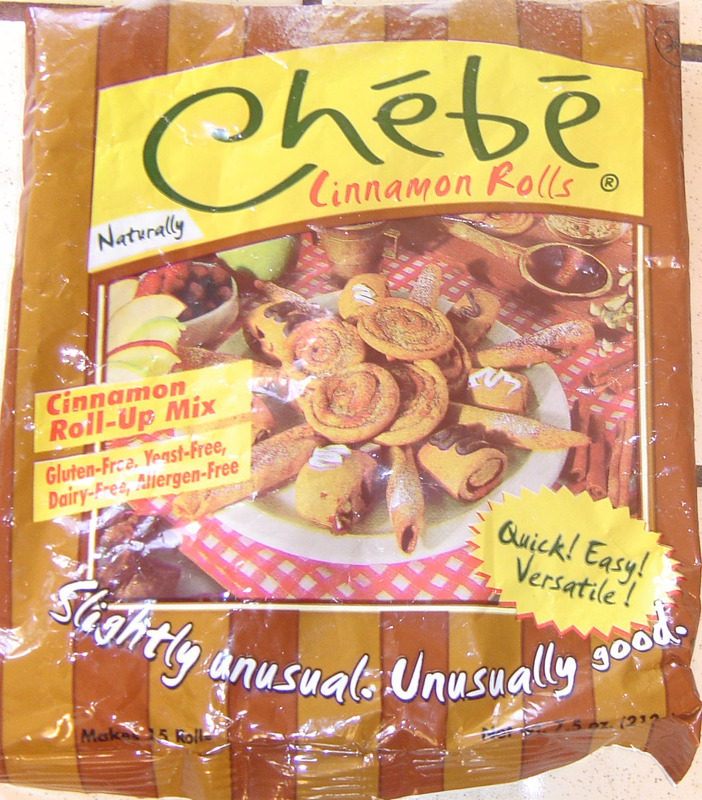 The Chebe's Cinnamon Roll Mix #1 may be a newer packaging. The instructions are slightly different. Maybe product improvement? Still good. Joyce thinks she got these at our local Albertson's. About 5 1/2" in diameter, two are a nicely sized breakfast. Good taste and they toast well. 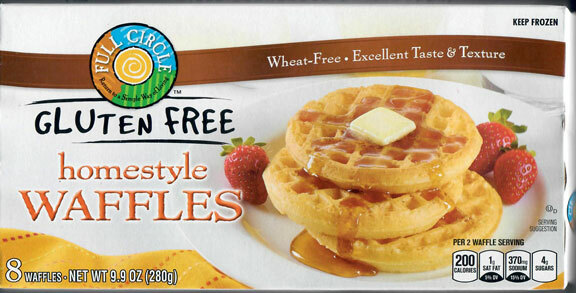 They attain that bit of a crispy texture that the gluten-free Bisquick waffles do not. 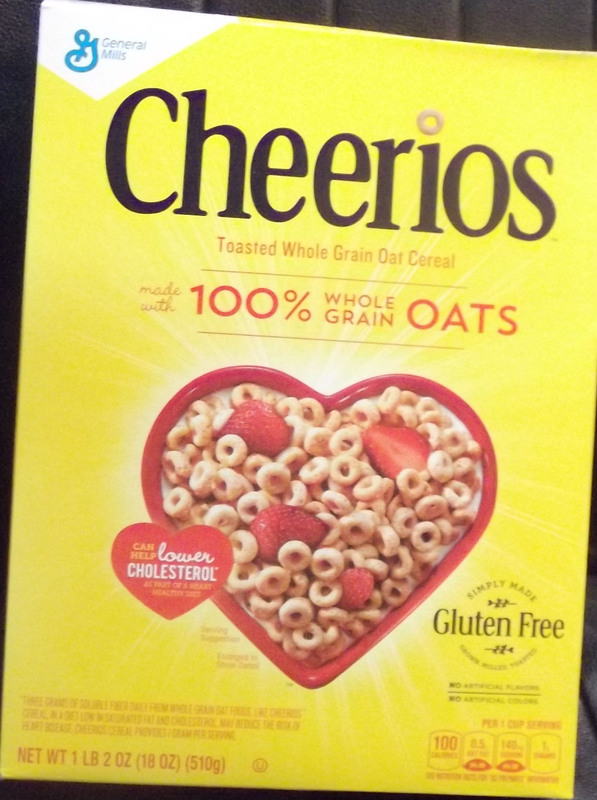 General Mills through its Chex Cereals has numerous gluten-free options and every one is 5 stars of 5 stars. General Mills Cheerios was a cereal of growing up. Since they went gluten-free, I am back. I probably eat Cheerios four or more times a week for a reason. IT IS GOOD. Even though I lost the original file, I remember this one. 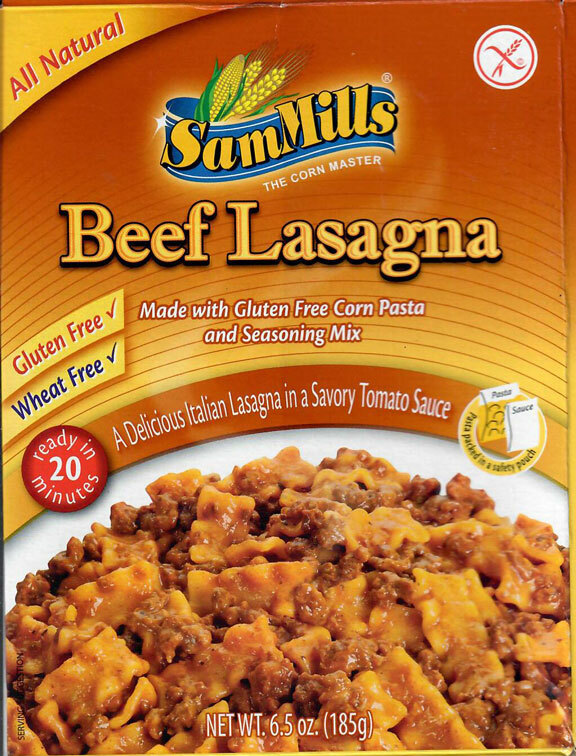 General Mills does not list any gluten materials in the ingredients. So I tried it. One bowl. Joyce finished it. It gave me an upset stomach tending towards cross-contamination issues. I contacted General Mills and they were very nice offering coupons. I turned them down. 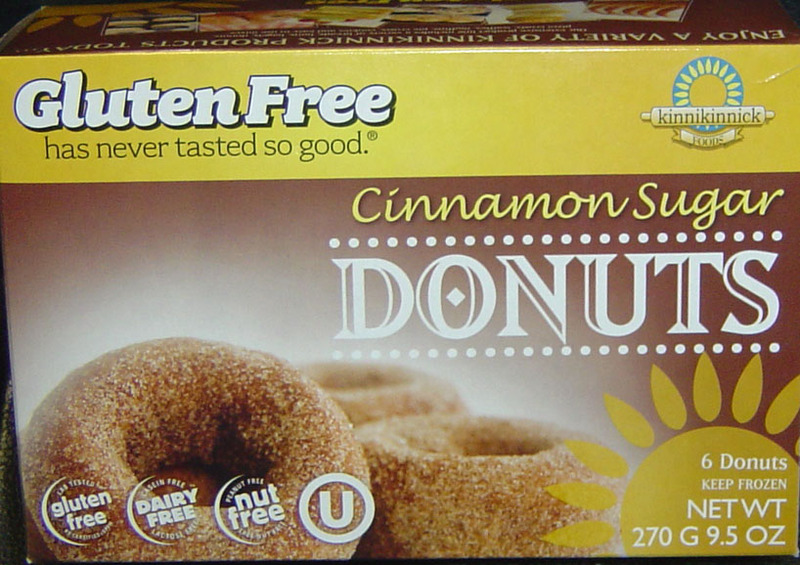 The product does not say "Gluten-free" and it does not list any gluten. How do you hold them accountable for cross-contamination. They did confirm it is made in a "glutenated" facility. I tried. Entered or updated October 2014. Glutino continues to be an anchor in the gluten-free world. 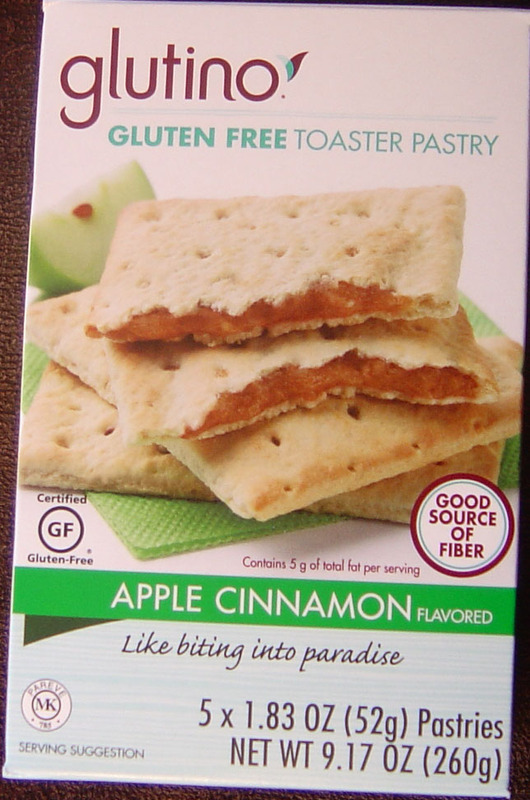 Their Apple cinnamon toaster pastry tastes just like the mainline product you would purchase in the glutenated world. The instructions say something like completely pre baked so only reheat on low for a short period of time. There are microwave instructions. I stuck it in my toaster/oven for about four minutes on the Toast setting. Came out VERY warm. Like the mainline product, tasted good and was "dry." These are not frosted. FYI - There are five individually packaged toaster pastries in the box. Makes it nice as one would be a good road snack. I am not a big fan of toaster pastry type products even when I was living in the glutenated world. My preference was toast with jelly. While these are easy to prepare, taste good, leave no aftertaste, and I have no annoyance with them, I remain a toast & jelly guy but may keep a box of these around for that "on the run" breakfast or road snack. Kashi has been a healthy choice generator for awhile according to their ads and my family members enjoy many of their other products. When Kashi Organic Promise Simply Maize showed up on the local shelf with the declaration "Gluten-free" it was a must try. 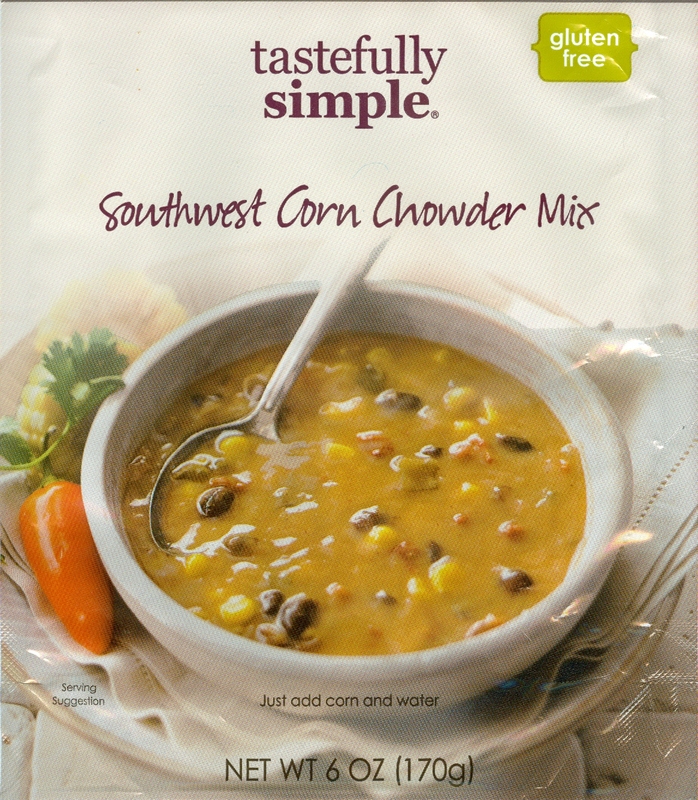 The taste is nice, kind of like a slightly sweet corn flakes cereal, not quite to the point of "frosted" for sweet. Its ingredients list molasses and this is most likely where that nice, tangy taste comes from. Not sure why but every time I have this for breakfast with fat-free milk and a sliced banana I have an annoying upset stomach starting about twenty minutes later lasting for about four hours. Not on the rebuy list for that single factor. When I "slightly" violate my Celiac Sprue allergy such as French fries from a fryer next to an onion ring fryer my stomach twists and turns for twenty-four or more hours. 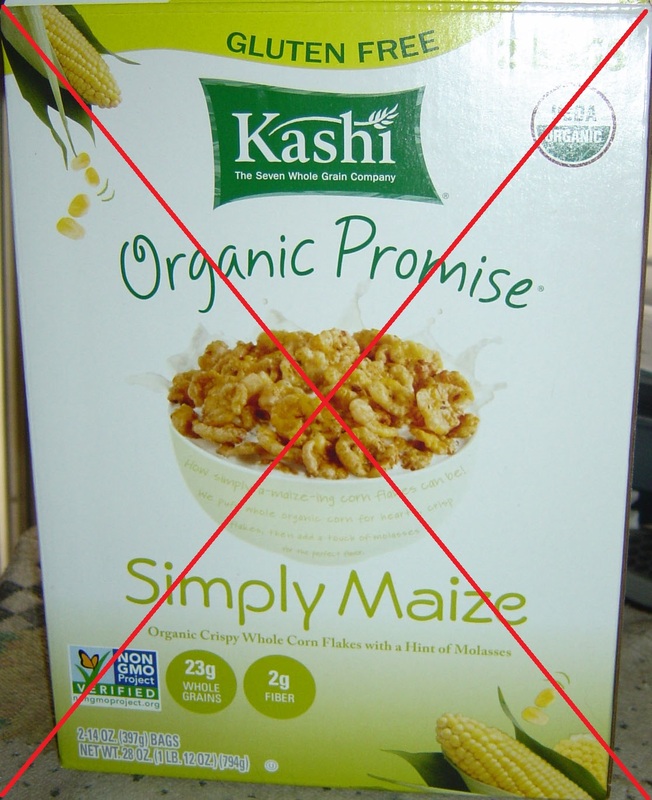 The "level" of twisting and turning caused by the Kashi Organic Promise Simply Maize Cereal is not as high as the known cross-contamination issues. However, it is past annoying and distracting as well as totally uncomfortable. Katz seems to be a consistent winner. These, as shown in the picture are "topped" with chocolate. Taste is great, not intimidating or overwhelming. As a heating note, I recommend microwaving at a sixty percent power level for longer than the full power setting. It seems to keep the chocolate in a better state. As addressed elsewhere, in my amateur efforts of research, there are two basic types of donuts. "Pastry" which is fluffy and light and "Cake" which is dense and the "normal" type for the supermarket 12 in a box sale. These are almost pastry. Light with a good taste and no after taste. They are a bit sticky once nuked. However, licking my fingers after a good donut has never been a problem. 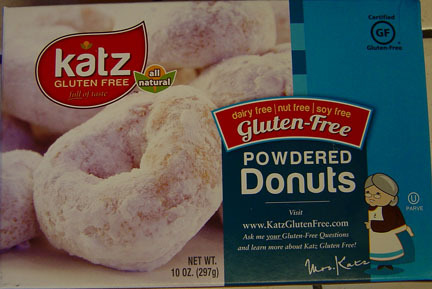 Katz has other styles of donuts. The powdered and chocolate donuts, addressed elsewhere are good. These taste great under a scoop of vanilla ice cream after dinner. Entered or updated August 11, 2016. 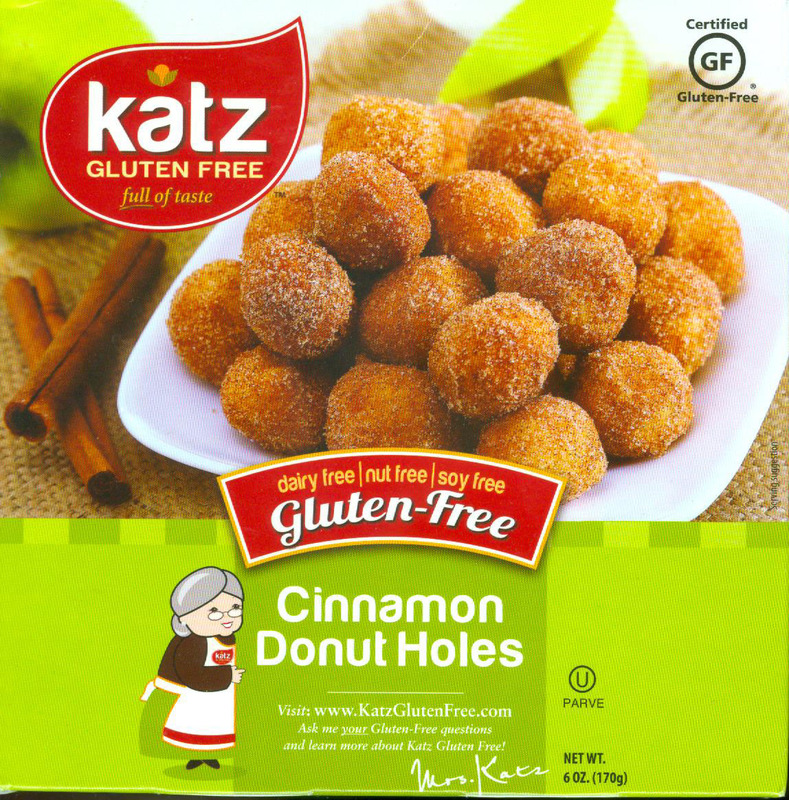 Katz has a high degree of quality in the gluten-free world. When it tastes good or is one of those fun foods it does not hurt at all. I put about four of these in the microwave for breakfast and they just added that nice touch to the morning. In my amateur efforts of research, there are two basic types of donuts. "Pastry" which is fluffy and light and "Cake" which is dense and the "normal" type for the supermarket 12 in a box sale. These are almost pastry. Light with a good taste and no after taste. I nuke them next to the oatmeal which means they get two 55 second cycles. After that they are a bit sticky. However, licking my fingers after a good donut has never been a problem. 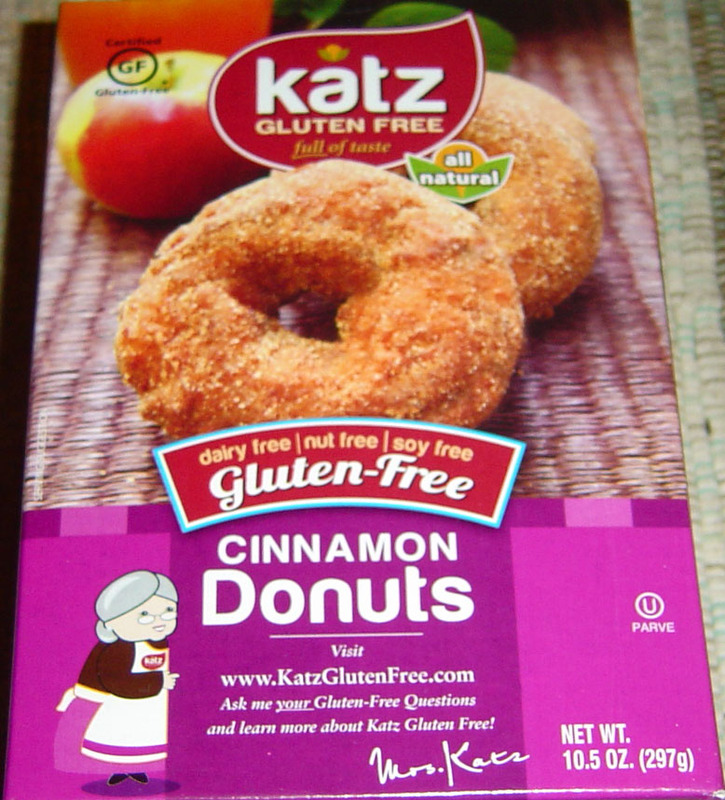 Katz has other styles of donuts, cinnamon which is also listed here,and chocolate. I think I do not care for the chocolate. I will update if I try the chocolate ones again. 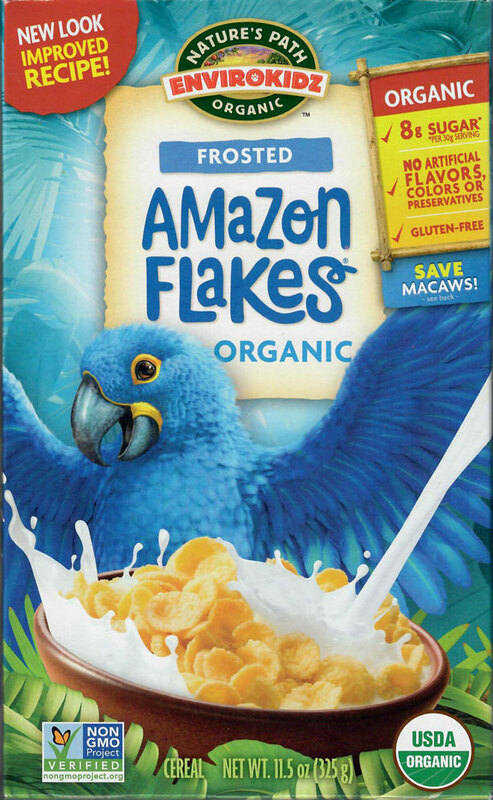 Kellogg's has taken several steps towards gluten-free. Their Eggos were heated in the counter top convection oven in toaster mode. They came out somewhat crisp, an issue with the Oster, not the product, and warm. They taste good. However, I have no need for them. I make Betty Crocker Bisquick waffles by the double batch and freeze them. Taste just as good and cost a lot less. Entered or updated February 10, 2015. 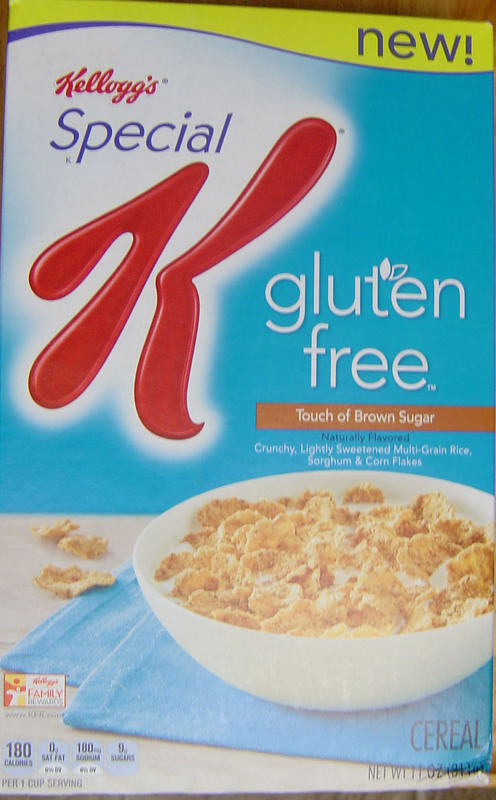 Kellogg's has two versions of this long time label on the market, the "glutenated" Special K and the Gluten-free Special K. Both are available in most of the grocery stores we have been in. I have not had Special Ks for a long time and these have a slightly different flavor than I remember. Joyce has tried them and also noticed the difference. Not annoying, just slightly different. 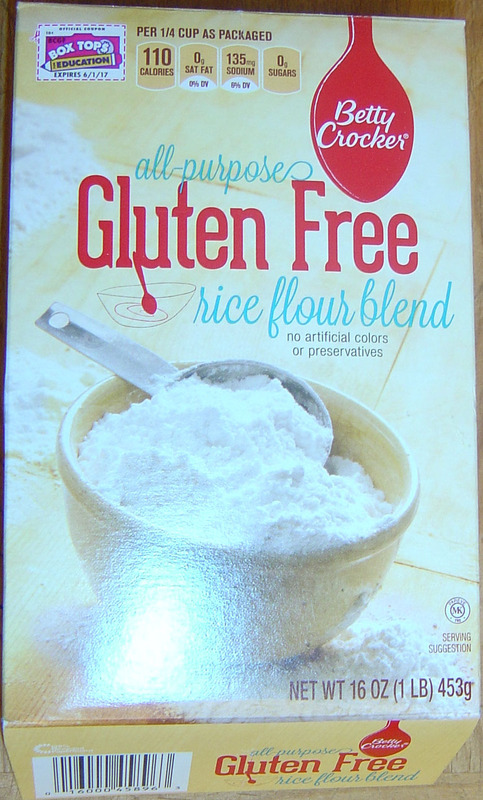 Kellogg's Gluten-free Special K has become a box that lives in the pantry. The cereal holds its texture while eating at a normal, paced, rate. Some of the earlier gluten-free cereals turned to mush if not eaten quickly. These are a restock item. I got these as part of a multi-part Christmas package. No problem with the mixing and they mixed smooth. I made them in the Lodge frying pan. No problem with the cooking. Good tasting. Between pancakes and waffles, I will go with waffles. Between King Arthur and Betty Crocker's Gluten-free Bisquick, I will go with Betty. I love diets and the calories in the hole fit my diet perfectly. l love these. Nuke time is critical, in my system it is 20 seconds. Not long enough and they are cold and partially frozen. Too long and they are cook-hardened. When over cooked a milk dip is the cure. 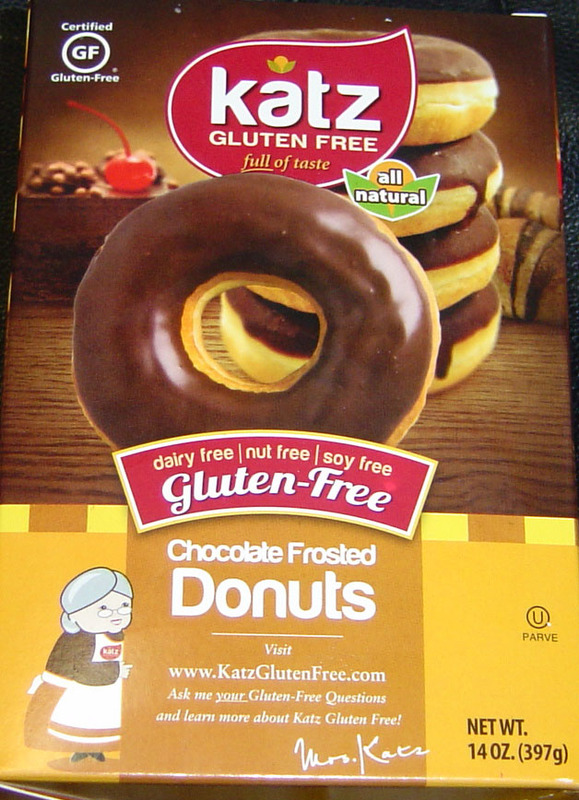 As with other donuts, I tried these under a scoop of vanilla ice cream. Super! 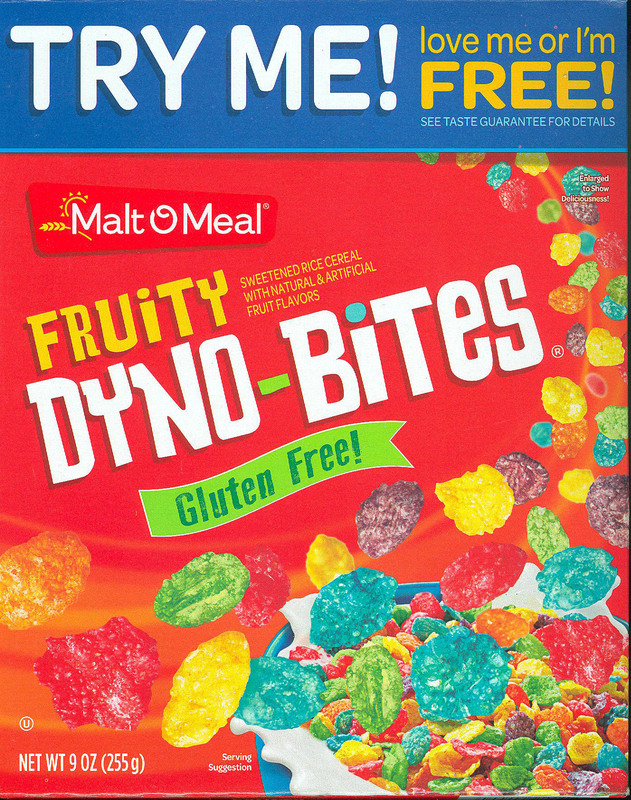 We found Malt-O-Meal Fruity Dyno-Bites in a dollar store. 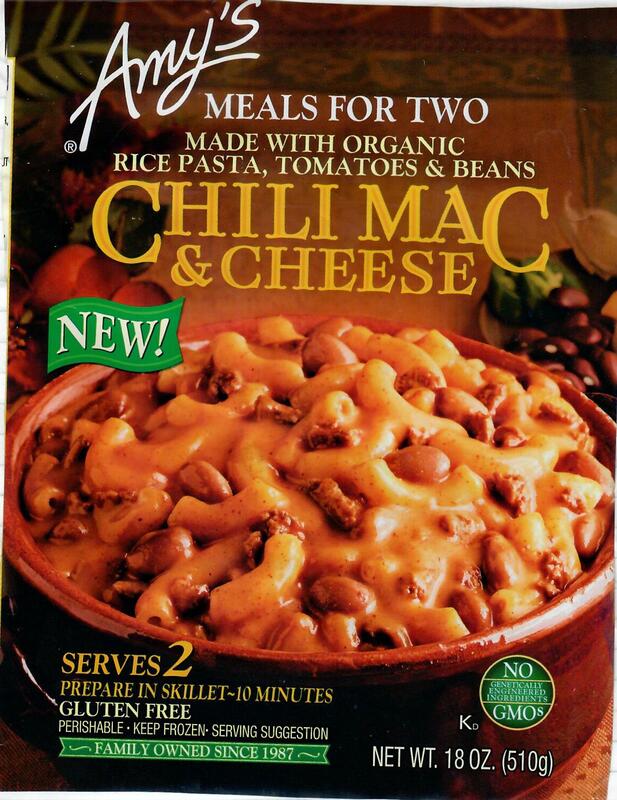 I remember Malt-O-Meal from cold days in Chicago. I picked it up. Yes, it is a kid's cereal. I liked it. When we go back to that store for other stuff, which we occasionally do, this will be on the list. Entered or updated January 14, 2019. This is a first try of Mom's Best Cereal. Not sure where Joyce bought it, I assume Albertson's, locally. I generally find cocoa, a different product than chocolate, as being a harsh for my preference. This tastes pretty darn good. May have it in the cabinet as an alternative to the Chex cereals. Nature's Path products are one of those consistently safe products. We found a triple pack at CostCo, this was the first box out of the pack. Lightly frosted so excessive sugar is not an issue. Kind of under whelming taste - you are expecting tons of sugar that is not there. Still, enjoyable. Nature's Path products are going to be one of those that build confidence. Their Homestyle Waffles fit that bill. We "toast" them using the convection setting in our toaster oven for best results. I love my pancakes and waffles with grape jelly - period. 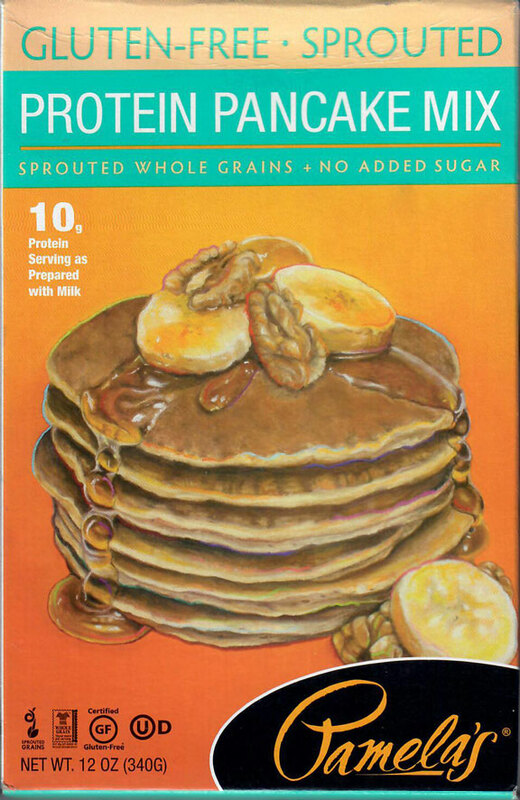 I have tried these with fluids such as maple syrup and warmed butter due to the melting reputation of gluten-free. Not a problem. We usually have a package in the freezer. I have used these to make sandwiches during (inhouse) gluten-free bread shortages. Very good. They do have a nice "soft" taste to them. During "cooking" the aroma from the toaster oven will not let you go far. For some reason I like breakfast. I like lunch, supper, and dinner too. 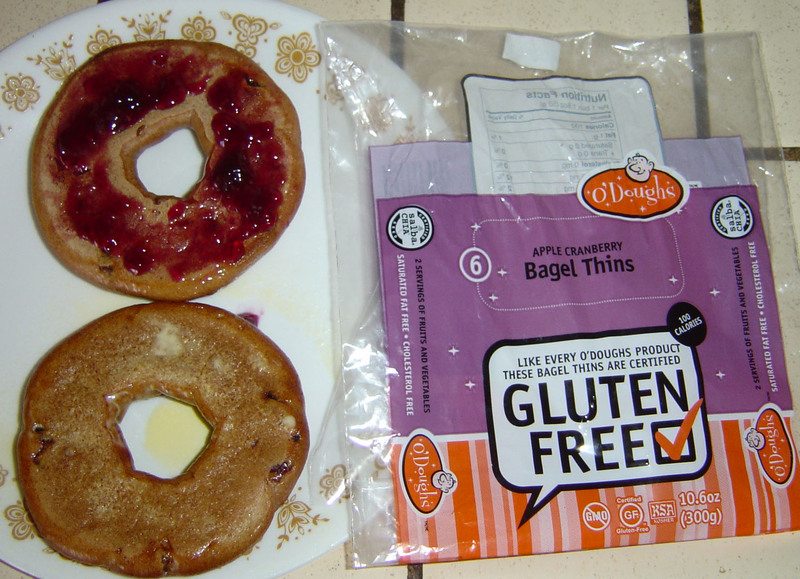 Joyce found the O'Dough's Apple Cranberry Bagel Thins at the store about four days ago. And in the gluten-free world trying is something that becomes a common practice. The product is three bagels already sliced in half, and refrigerated so shelf life is shorter than frozen. I popped two at a time in my counter top convection oven / toaster for a normal toast cycle. They came out hot all the way through. Each half accepted a topping, I have used jelly and butter at this point, very well. The bagels held their consistency as I nibbled my way through breakfast and checking e-mails. The taste is probably the best tasting bagel yet. No off taste and no after taste. Another product on the "Rebuy when available" list. Entered or updated April 22, 2018. Joyce purchased this online. It mixed well, tasted good. Pamela's continues to provide high quality across the board. Entered or updated May 7, 2017. 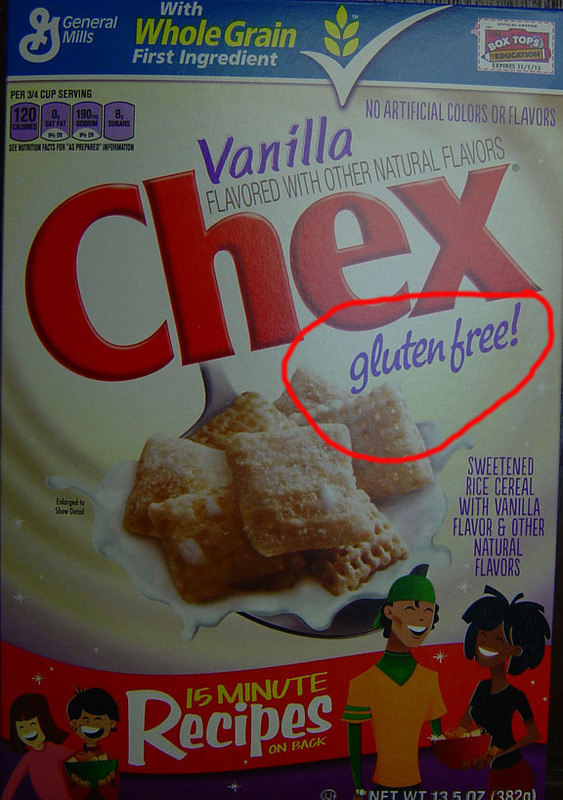 More and more breakfast cereals are going gluten-free. 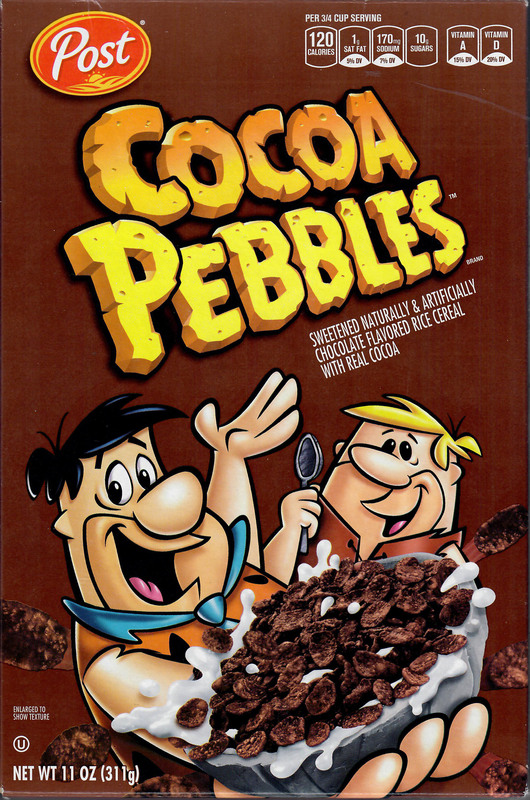 Not sure when Post Cocoa Pebbles went gluten-free or if they ever contained gluten. 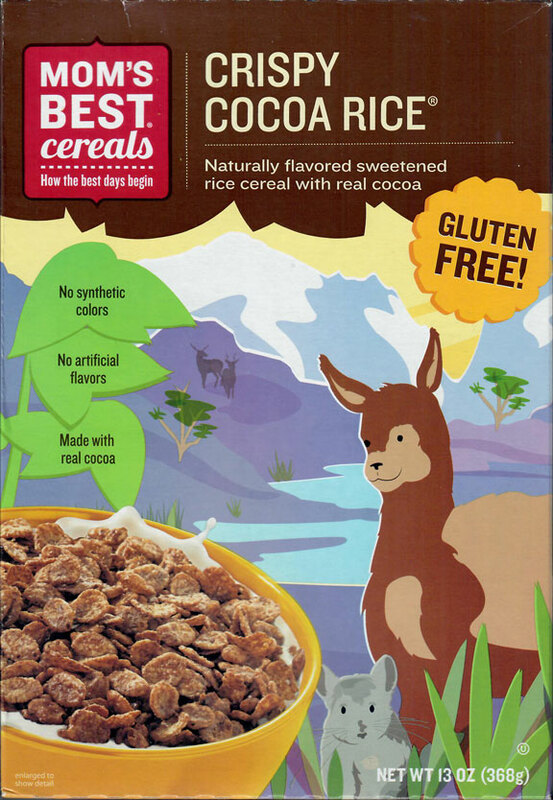 Not a big fan of cocoa or chocolate cereal for breakfast anymore. Do not think I ever was actually. However, Joyce keeps looking for variety and found Post Cocoa Pebbles so they ended up in the cabinet and I ate them. Not a bad taste, just a bit too cocoa-ee for me even with a banana sliced on top and with 1% white milk. Will not be annoyed if Joyce brings Post Cocoa Pebbles home again but will stop her from buying them if I am with her at the store. One of those borderline tolerable items. to make this clear, no issue with after taste or digestive issues. Just prefer to keep cocoa and chocolate in the "after lunch" dietary schedule. Entered or updated May 12, 2017. Not a big fan of chocolate in my breakfast foods. 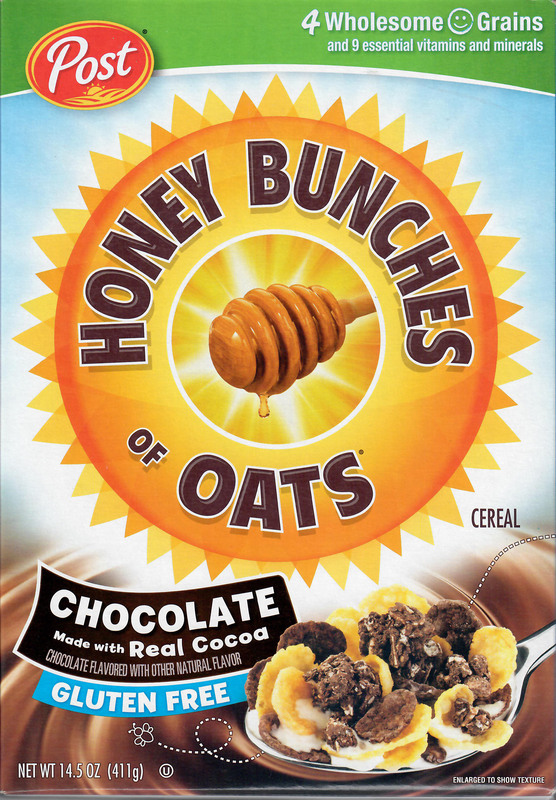 With that said, the chocolate of Honey Bunches of Oats with Chocolate is not intimidating until the last several spoonfuls. My comments to Joyce were that as a variety every once in a while, Honey Bunches of Oats with Chocolate would be enjoyable. Not desired as a main staple of breakfast. 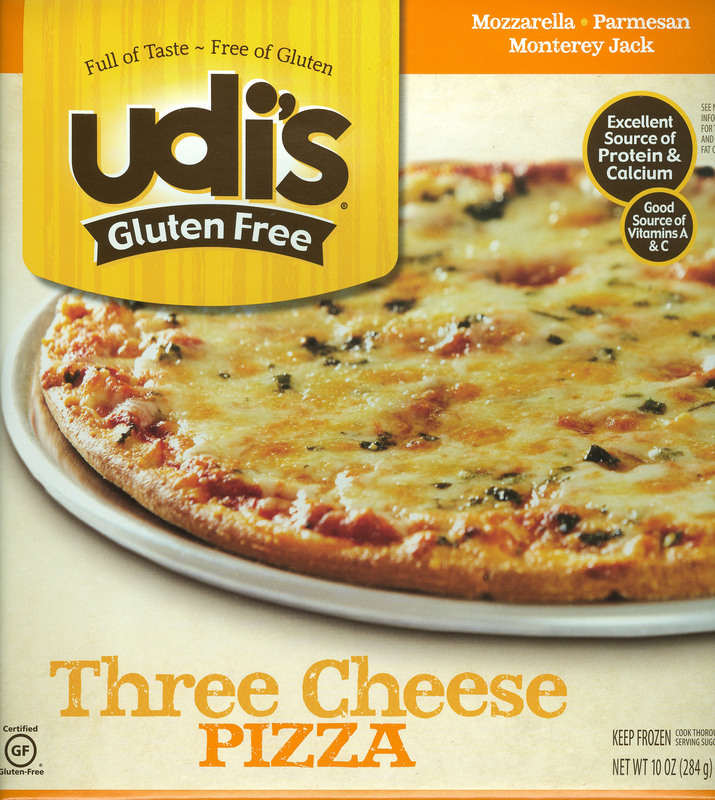 For the gluten-free world Udi's is pretty consistent at delivering quality. These are no exception. There are four large cinnamon rolls with two packets of icing in each package. We found out that nuking them in our microwave for about twenty seconds then icing them and nuking them for about seven more seconds works very well. Even tried one with vanilla ice cream on top after heating. Nice dessert. At that point in my life and weight that I am cutting these in half and only eating half at a time. In the refrigerator for about five days before all consumed and the last one was getting a bit hard after that time. Very good taste, lots more icing in the packets than I used. This is a will buy again item with the waist line considered. Udi's is a consistent win. Becki found these at Target. I used a thermometer to ensure it was cooked through in the microwave inside its moist paper towel. It seemed to cook well. The ends where the tortilla folds were a bit rough due to the mass of wrap. Kind of mild taste at first, about one third of the way through I added salsa and it was a winner. There is another flavor according to Becki so the next trip down the hill we will get several of each. A rebuy. And nicely sized for that mid morning snack. Udi's is a pretty strong contender for consistent and good. Their Udi's Sausage Breakfast Sandwich failed for me. In my opinion it was tasteless. I tried adding hot sauce and then American cheese and never got anything but hot sauce and American cheese for taste. I contacted Udi's and we swapped e-mail comments. I felt they were concerned. That is a plus in my book for Udi's. I have provided them with several comments and every one is responded to as if they read them. Better than a 'courtesy auto reply." I do not remember this one and will update it if we purchase another one. Gluten-free is an issue for what we expect for breads. The key is two elements - gluten and wheat flour. Most breads are held together by the "glue" aspect of gluten and wheat flour is tasteless so "white bread" is actually tasteless. These two elements explain why wheat flour seems to be everywhere - gluten increases the mass of something without altering the taste- it makes drippings thicker and turns them into gravy, it reduces the runniness of dressings, and the glue aspect holds spices in place without adding its own (lack of) taste, etc. So any sandwich with white bread is the taste of the contents, not the bread. When we go gluten-free we lose the glue factor so gluten-free breads are often crumbly. And gluten-free may give us the taste from the substitute element for wheat flour. 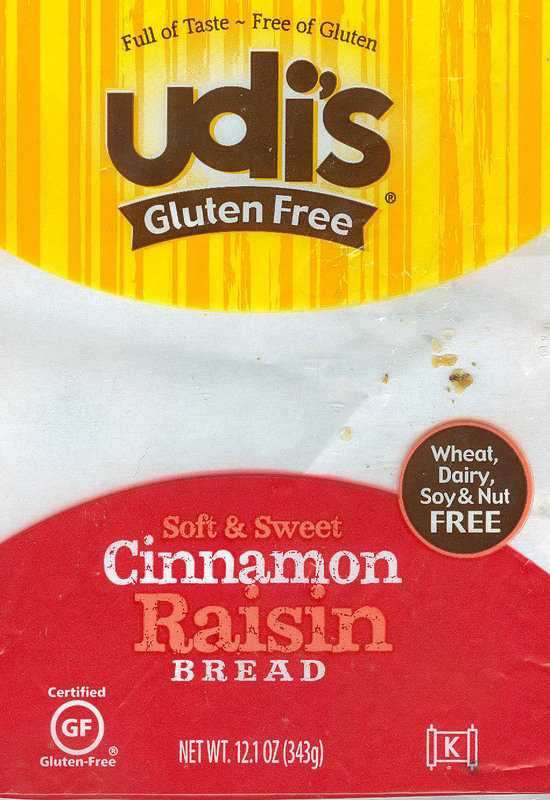 So expect gluten-free breads to be crumbly possibly with a flavor or taste not associated with "normal" bread. 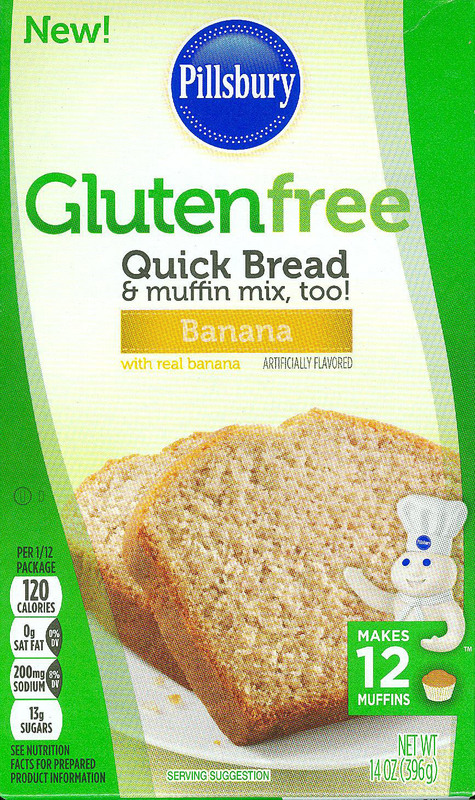 Gluten-free breads are often denser than wheat flour breads. 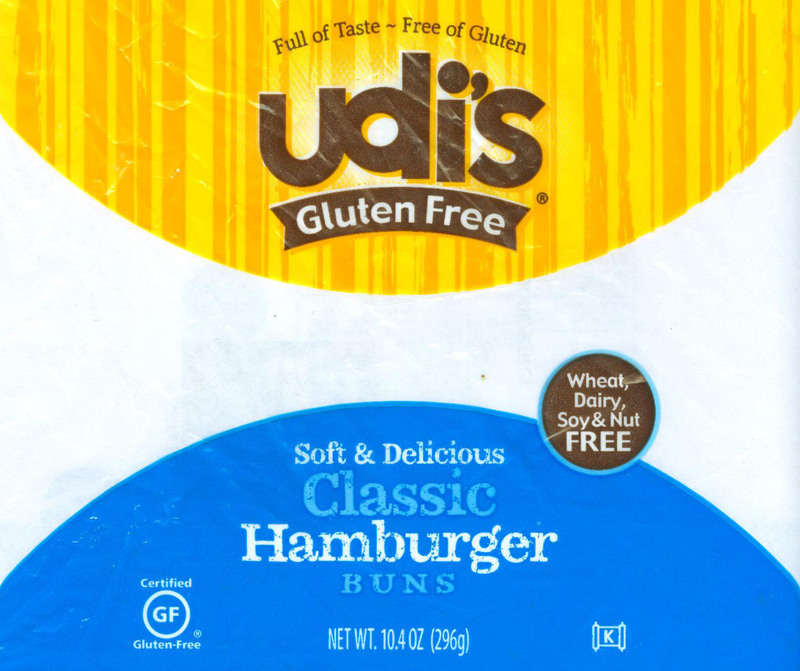 Another issue frequently found with gluten-free breads is they "melt" into goo shortly after condiments such as catsup, butter, and jelly are put on them. This creates a problem for the 7:00 AM made lunch sitting in the sack until noon. The solution may be put the condiments between the slice of cheese and the meat (where they can squeeze out) or put them in a container until lunch, then apply. Some restaurants have given me handfuls of individual serving condiments, others have "sold" me a good amount for a couple of dollars. Note: Try toasting gluten-free breads. The removal of moisture seems to slow the "melting" issue and reduces the crumbliness. Making gluten-free bread is going to involve some tolerance and experiments in your kitchen. I have found my Breadman bread maker lets me down more often than not. I have not figured out how to appropriately extend the bake time or temperature to handle gluten-free. The result quite often had a very doughy, dense, unrisen center. So I switched to baking in our Kenmore Elite conventional / convection oven. I am convinced it is baking cool and working on raising the temperature reference five degrees at a time. What I have discovered in my kitchen is that I must use the conventional oven temperature as the target convection temperature. The Kenmore Elite has an "auto conversion" option and it does not work for me. At the end of the bake cycle, if the toothpick is clean, I shut the oven off and let the bread remain in the oven with the door cracked to its cooling position for another five minutes or so. The result has consistently been completed baked, no doughy center sections, of bread. Gluten-free home baked bread has a short shelf life. Within a week it is going moldy in my home and as the only "gluten-free" eater, this is expensive and wasteful. After the bread cools I use an electric knife, the twin blades do not tear the bread up, and slice into thin slices. Then I place the slices on flat surfaces in the freezer for fifteen to twenty minutes to freeze them before bagging them. Bagging them in freezer bags AFTER being frozen allows you to take out one or two slices at a time without having to break the slices off the loaf. For some reason most gluten-free bread tastes and holds together better if toasted immediately before use. Even if you toast it and then let it cool before consumption. Bread and sandwiches are great opportunities for cross contamination. Recommend you review that section earlier on this page. I am not a big fan of muffins. I am not a big fan of blueberries. So out of the box these had two strikes going against them. They are tasty, more moist than most muffins. Not annoyed when Joyce puts these on the table if they compliment something else on the menu. Entered or updated April 7, 2019. Canyon House is appearing on television with ads. Have not seen or heard of them until a couple of months ago. Now several local stores are carrying them. 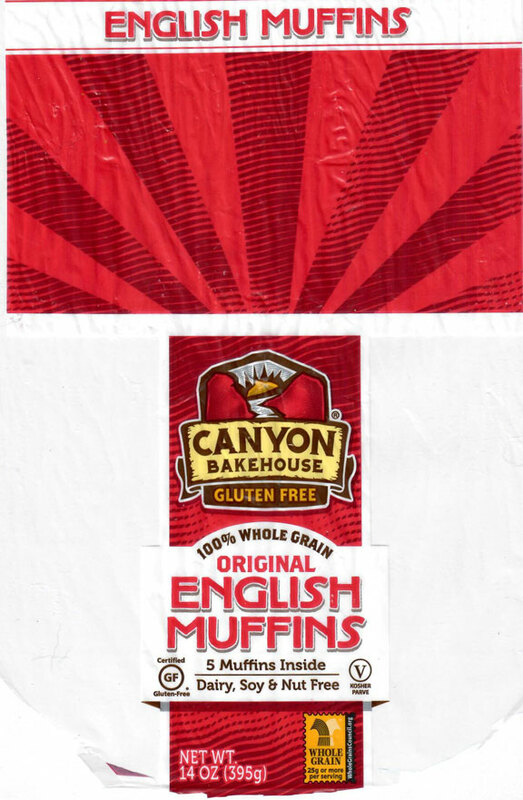 Purchased the frozen Canyon House English Muffins. Five to a package and not pre sliced, both issues a bit unusual. Have to nuke them in the microwave for about 30 seconds before you can slice them with an electric knife and then toast them. They went from slightly under toasted to significantly over toasted in seconds. Good taste, no after taste. Makes a good egg muffin type sandwich, good with jelly. Entered or updated January 6, 2015. Not sure where we picked this up, most likely Sprout's. I followed the mixing instructions, adding the gluten-free baking powder, however, deleted the cheese. The dough mixed very well and was workable with my hands and a rolling pin. Not sticky or gooey at all. I cut it into 2" by 4" "slabs" about 1/4" thick. I ended up with seven good sized pieces. I baked them in the convection oven at 375 for 25 minutes. At the end of the baking cycle the toothpick found a pretty firm crust and came out clean. The bread rose about 1 1/2" making them very nice for sandwiches. I cut the first one open, a bit "interesting" with the fairly firm crust. The inside is baked through. The bread has that nice "crusty" texture and tastes very good. No aftertaste. Lots of holes for jelly, butter, peanut butter and very light with that delightfully chewy crust. This is a buy again item. Entered or updated January 7, 2015. Chebe continues its run of good products. 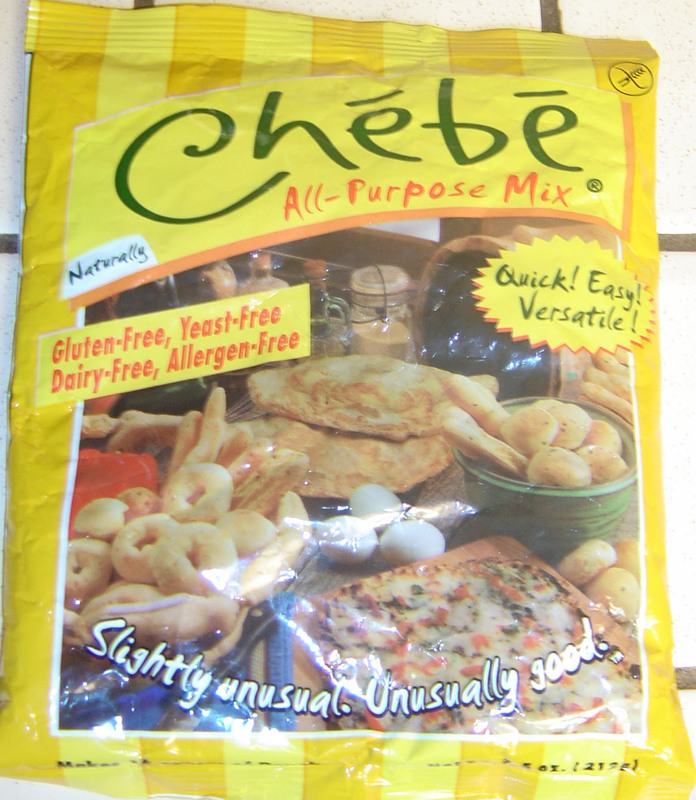 Not sure where we bought this, I checked with Sprout's today, January 7, 2015, and they do not carry Chebe's. Possible that we bought it from Henry's before it got acquired by Sprouts. 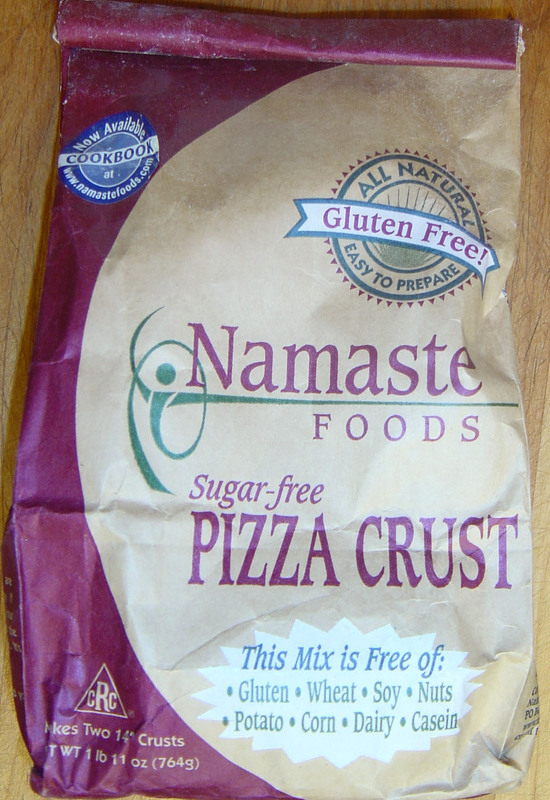 There is mixture for one pizza crust in the package. Joyce followed the instructions and had no problem in mixing. The dough was manageable, not excessively sticky, during handling. The instructions have you bake the crust bare first to seal it. Joyce did that on a pizza pan. Then the toppings, Italian sausage in this baking, and into the baking for the second time. The final effort resulted in a crust that was done and maintained its structure once it hit the table. The crust is a bit chewy but holds together, does not rip or tear easily. No aftertaste or bad taste associated with the product. Not a bad item to keep in the cabinet just in case. 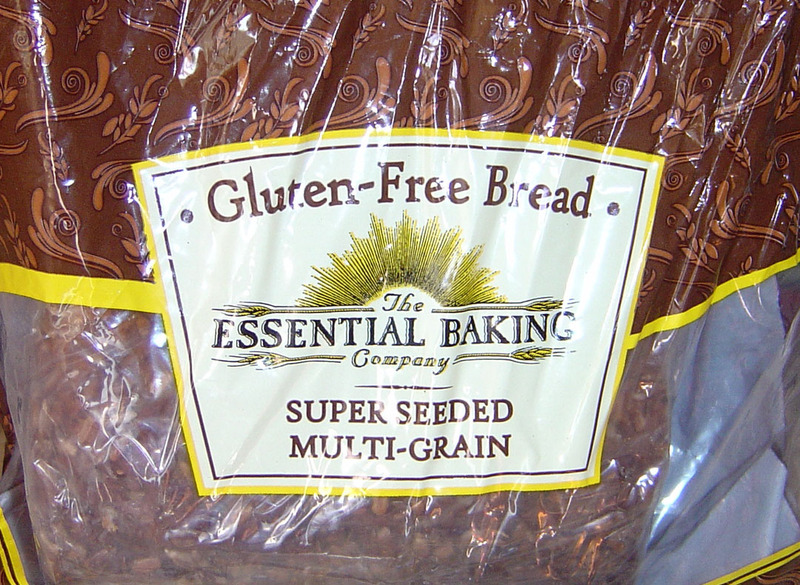 We found this Essential Baking Company Super Seeded Multi-Grain Bread at CostCo for a reasonable price for gluten-free, two loaves in one bag, the total weight is just over 34 ounces. The bag states each loaf is stored in its own oxygen-free container and can be stored for months without freezing. We have not had it that long yet, we are into our second week. In appearance this bread is a dark, dense bread similar to very dark ryes and it is heavily seeded on top. The taste is rather aggressive without being dominating and pleasantly surprising at the same time. While many gluten-free breads leave an after taste due to their substitute for wheat flour, this one is "clean" and nice. I have had grilled ham and cheeses, buttered toast, and a few other sandwiches so far. Following the standard "if it is gluten-free, toast it" it has held up well in all formats. One note with this is that the crust tends to get towards the well-done definition as the bulk of the bread is getting near "ready" for things like grilled cheese and grilled ham and cheese. I have not noted an unpleasant taste in this dark brown to blackened area and it is not crunchy as you would expect with burned bread. This will be a buy again item. Entered or updated March 20, 2015. I am a big French Bread and a bigger pizza fan so this sounded like a natural selection. Because our bread machine does not like baking dense gluten-free breads I followed the Oven Method instructions and baked it in the convection oven at the conventional oven temperature setting for the conventional oven times. Our convection oven seems to be a bit low in temperature every once in a while. At the end of the bake time the toothpick went in "tough" even after it broke the crust. It did come out clean so, having learned from other gluten-free bread bakes, I tried something. I shut the oven off and left the bread in the oven with the door closed for about twenty more minutes. I cannot say what caused what, but the bread came out fully fully risen and fully baked. No "doughy middle section." After it cooled I sliced it into slices about 3/8" thick, and than placed the slices in single layers on plates and froze them in the freezer. This way they stack in the freezer bag as slices you can take out easily. The first PB&J was super without toasting. This is most likely a continue to buy item. Next, I need to try it for pizza -MAYBE. The dough was a bit sticky so I am not sure I want to try to roll it out. Entered or updated January 11, 2015. I am not sure what makes cornbread "Yankee Cornbread" so I have to leave that issue alone. It mixed, baked, and tasted like cornbread. Joyce followed the instructions and baked it in the convection oven. Came out just like good cornbread and tasted just like good cornbread. 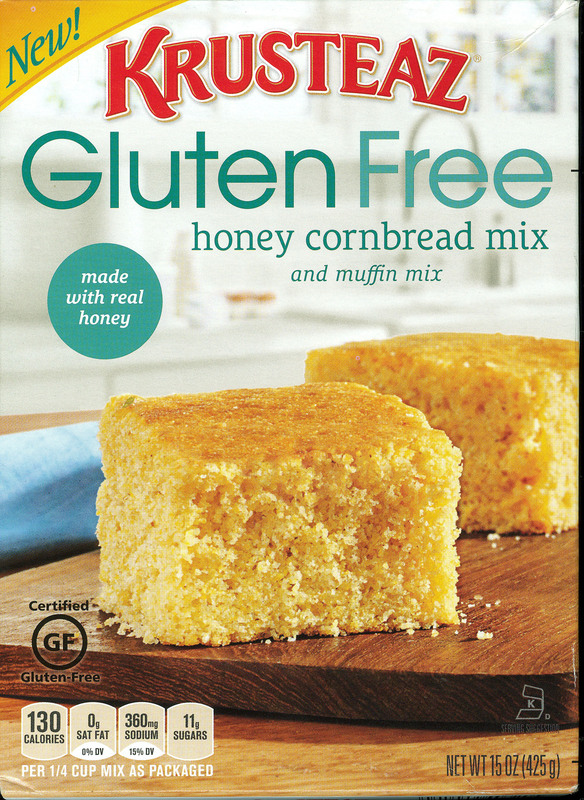 Just like "cornbread," the Gluten Free Pantry's Yankee Cornbread is a bit crumbly. No after tastes, no issues. I was surprised awhile back cruising through the supermarket to find how many of the cornbread products actually have wheat flour in them. Most likely as a combatant in the war against crumbly cornbread. 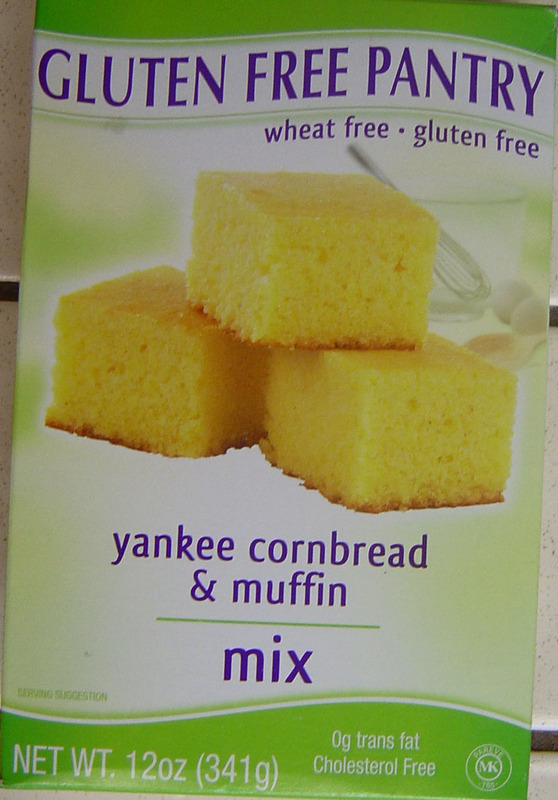 Gluten Free Pantry's Yankee Cornbread is good and will be on the repurchase list. 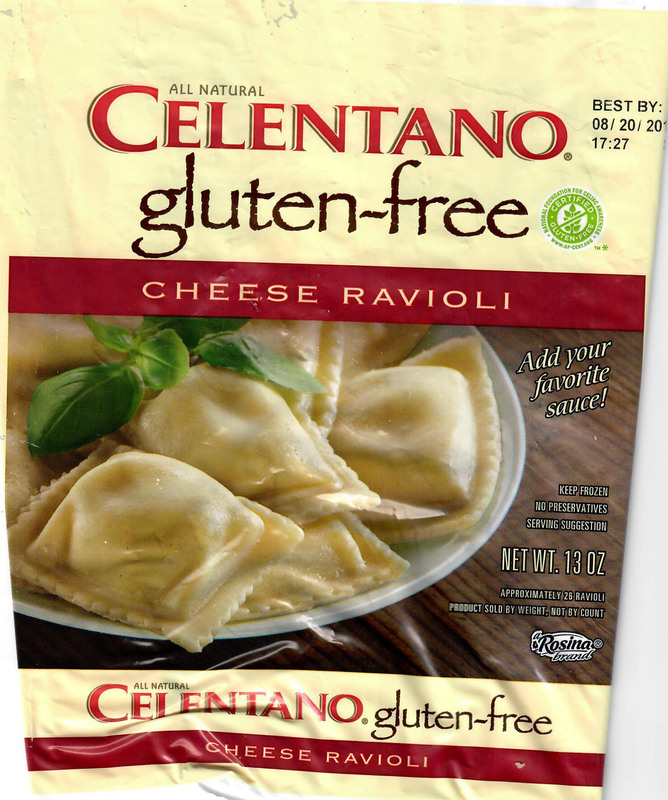 Glutino is becoming one of those trusted names in gluten-free for us. Joyce found these somewhere and brought them home for a trial. Now she needs to find them again. They toast very well, take butter or jelly without a problem, and to not turn into goo while I munch and check my morning e-mails. I love ham, egg, cheese, and muffin sandwiches about once a week and these work great. When Joyce brings them home next time we are going to try them as hamburger buns. Most gluten-free breads are pretty heavy or dense, BUT GETTING BETTER, and these are very light and enjoyable. Entered or updated April 11, 2015. 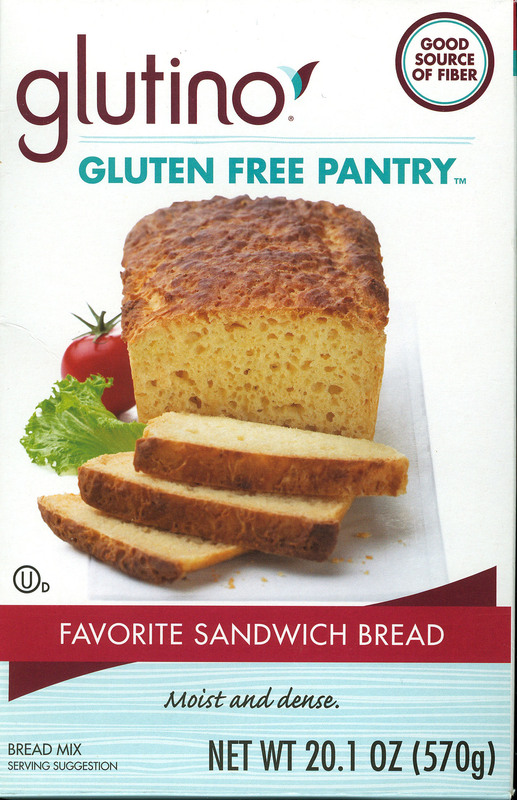 Glutino is one of those reliable gluten-free products and Glutino Favorite Sandwich Bread maintains the string of successes. The recipe comes with the mix and the yeast, add butter, milk or water - I went with the milk, and eggs and start mixing. I have been disappointed with gluten-free mixes in our bread maker so the Glutino Favorite Sandwich Bread went into a greased pan and the convection oven at 375. Baking is a learning experience and our Kenmore Elite oven, convention or regular bakes below temp and I am working on adjusting that. The dough rose very nicely in the warming drawer and was baked at a convection temperature of 375. At the end of 35 minutes the toothpick was dry on extraction. A learning thing on my side, I shut the oven off, cracked the door, and let the loaf remain in the oven for another five minutes. Then to the cooling rack. The bread was baked through and nicely risen - lots of holes in the slices, no "doughy" sections even in the center. After cooling I sliced it and froze most of it after making a very good tasting BP&J. I am shifting away from store loaves of bread. Many of them seem very dense or have a side taste. This mix / loaf, tastes great and is easy to make. A rebuy item. There are some things you simply remember. For some reason I ended up with about five packages of King Arthur's Banana Bread Mix. Some for Christmas presents. I mixed it, no problem. I baked it in the Oster counter top convection oven and it did nicely. 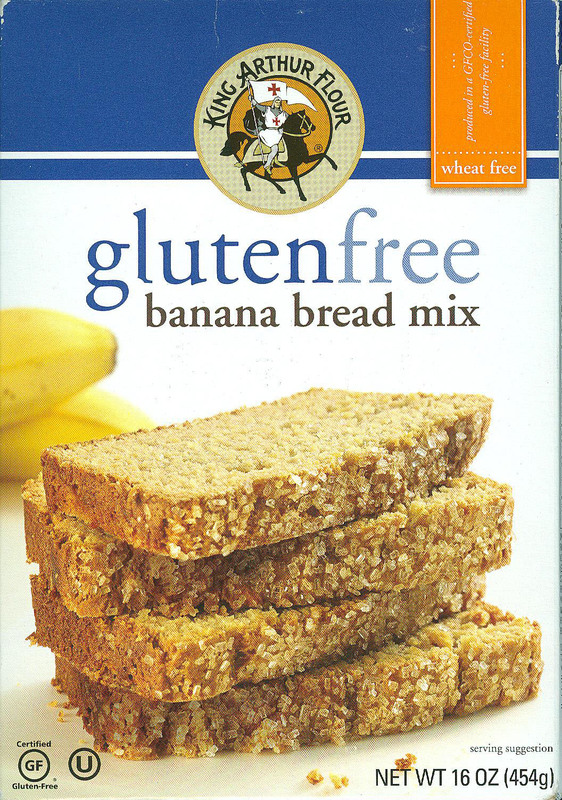 I enjoy banana bread and this left no after taste or had any issues other than a bit more crumbly than glutenated banana bread. Entered or updated March 4, 2019. I have tried numerous bread mixes. This one probably comes out in the top three. Very light, soft, with plenty of expansion holes. Taste is as bread should be - tasteless. Good white bread should not have a taste that interferes with the contents. Entered or updated March 29, 2015. This is a first try with King Arthur Flour products. Not sure where it came from. I followed the simple directions and added about 3/4s of a cup of chopped pecans to the mix. The directions say up to 1 1/2 cups of add-ins. Baking was done at the stated temperature of 375 Fahrenheit using the convection oven and no adjustment. I am convinced our convection oven is a bit cooler than setting and our oven thermometer agrees by about 10 degrees. Because of the add-ins the mix filled twelve regular size cupcake holes and than about five mini cupcake holes. After about twenty minutes the minis were done to a tee. The regular size cupcake muffins were a bit underdone - dirty toothpick. After another five minutes the regular size cupcake muffins were "almost done." So I simply turned off the oven and let them sit in the residual heat for another five minutes. Done to perfection. Both the mini and regular muffins are done to a tee. The muffins are excellent tasting with just a bit of crunch from the pecans but not intimidating. Totally enjoyable. I am not a "doughy" muffin eater and like corn bread muffins only if we have chili on the menu. These have become finger food and resulted in frequent passes on the refrigerator. Kinnikinnick products have a pretty darn good reputation in the gluten-free world. We found this somewhere so home it came. We tried it in the bread maker with only a minor problem. The center is a bit "wet" for a full loaf of bread. HOWEVER, we found it superb as a "little biscuit maker" solution, those mini cupcake things. Baked in our convection oven without an "adjustment for convection" temperature for the stated time and they come out very nice and tasty with a golden brown color. Throughout the day they get a bit of butter or jelly and go down without a problem keeping me away from the candy bars and cookies. The mix bag has a lot of material in it so two packages may be an over purchase. "Assembly" is easy - WATER. The dough is a bit sticky not not nearly as sticky as most other bread mixes in the gluten-free world. Nice taste, nice density, no after taste. A rebuy if we are after "mini-biscuits." As I remember, the Krusteaz Honey Cornbread Mix went together well and was baked in the counter top Oster convention toaster oven. It tasted good, as is standard with cornbread, it was crumbly. I found it safer / better to spray or squeeze butter on it rather than try to spread it with a knife. Not a big fan of cornbread. Entered or updated April 5, 2015. Salads require the extra little bit. 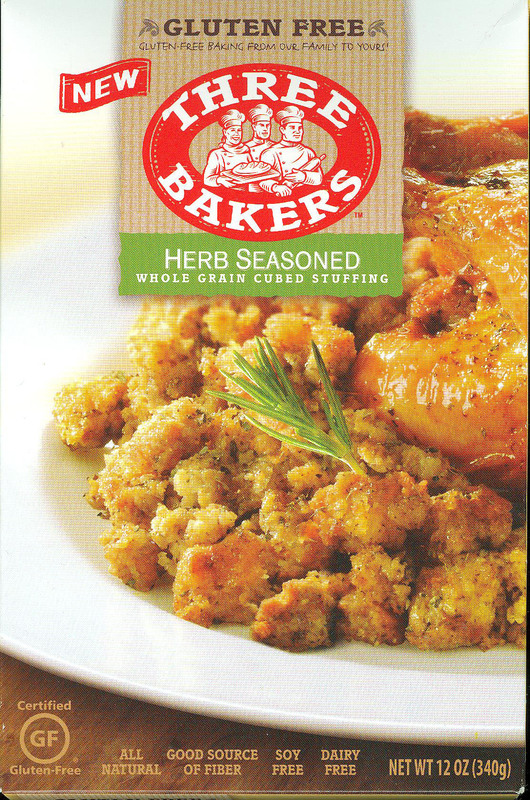 We tried making croutons from our baked gluten-free bread and the purchased gluten-free bread. It simply did not work. 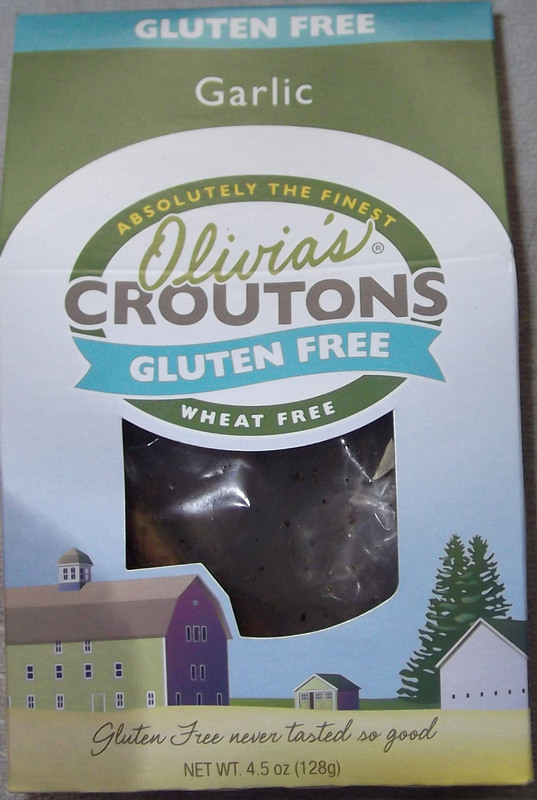 We found Olivia's Garlic Croutons somewhere and brought it home for a trial. It hits the mark. Any salad has Olivia's Garlic Croutons on it. Simply a must buy again. However, the box is ample for MANY salads so, one box at a time is good. Pamela's just continues to hold with "satisfied with the results." Joyce backed these using the conventional to convection temperature feature of our oven. This is a mistake. We have learned that we use the conventional oven temperature for everything. The mixing went well. On the first baking the toothpick came out clean but upon cutting only the outer "panels" were baked through. Those were removed for dinner. The inner "panels" were left in the oven for another seven minutes or so before they were baked "dry." The taste is like glutenated cornbread. It is as crumbly, not no more crumbly, then glutenated cornbread. It went well with the chili. The next day it reheated well on top of the chili in the microwave. This is a repurchase item. I will update this as we go. I used the recipe for the bread machine batch. The instructions say to set your bread machine to the 2 pound loaf setting. Ours goes to 1 1/2 pounds. Hmmm. At the end of the baking cycle the bread had risen to fill about 2/3rds of the tin. When it cooled I sliced it kind of thin. Gluten-free bread is often kind of heavy. The top 1/2 of the loaf was very airy and light. Nice, about the same texture as "glutenated" enriched white bread. The bottom half center was fairly doughy - it needed more baking time. Toasting two of those doughy slices for a PB&J resulted in a nice, kind of dense sandwich. No bad tastes, no undesirable affects. Two of the upper slices were turned into garlic bread for a pasta meal. Nice and they held up well. Of note, most bread mixes come complete. This one needs live, good, yeast. I think this is going to be a "in the convection oven" substance and will update this listing as I play with it. 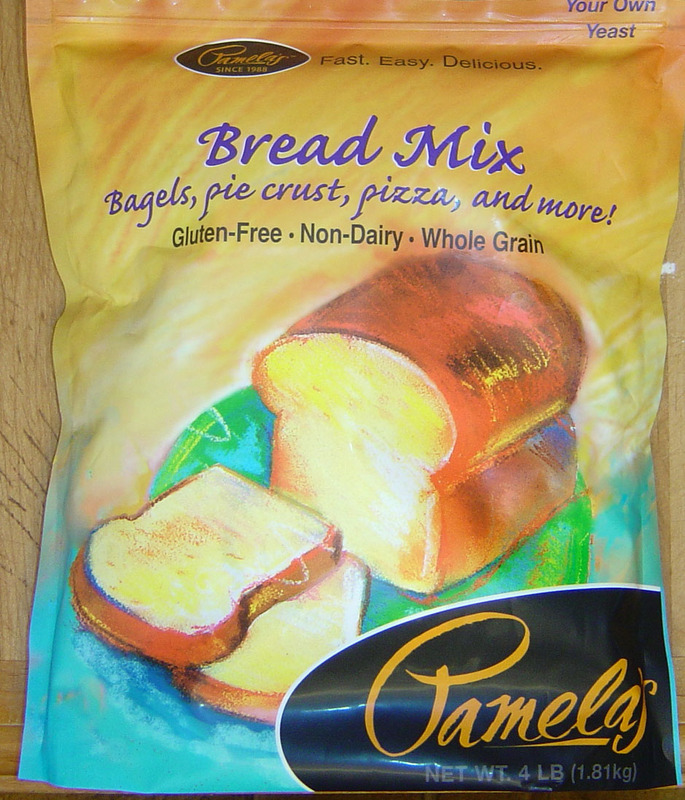 The same product as Pamela's Bread Mix in the larger package. Just very convenient for one loaf of bread. 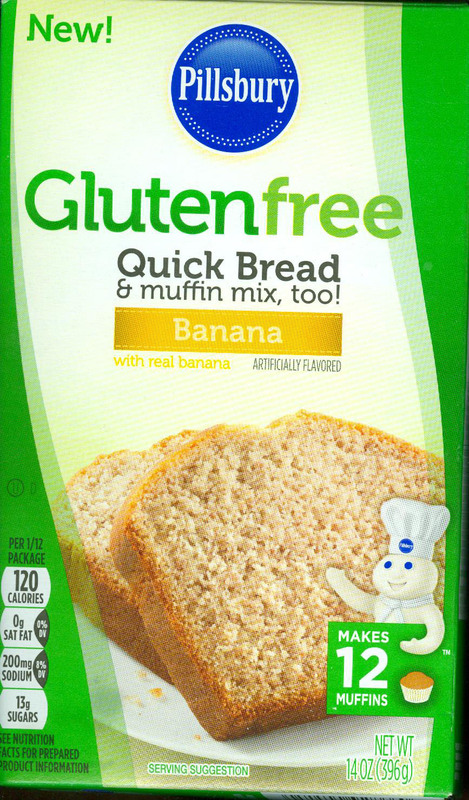 The Pillsbury Quick Banana Bread mixed well and baked well. In the Kenmore Elite Convection oven it took a long time. In the little Oster counter top convection oven it was right on time. I like banana bread. Once about every three months is nice. Joyce keeps one of these in the cabinet and I make it about once every three months. Good taste and texture. The Pillsbury Quick Bread and Muffin Mix mixed well and I baked it in the Oster counter top convection oven. Taste and texture is totally acceptable. I prefer the Pamela's Bread Mix in the large package. 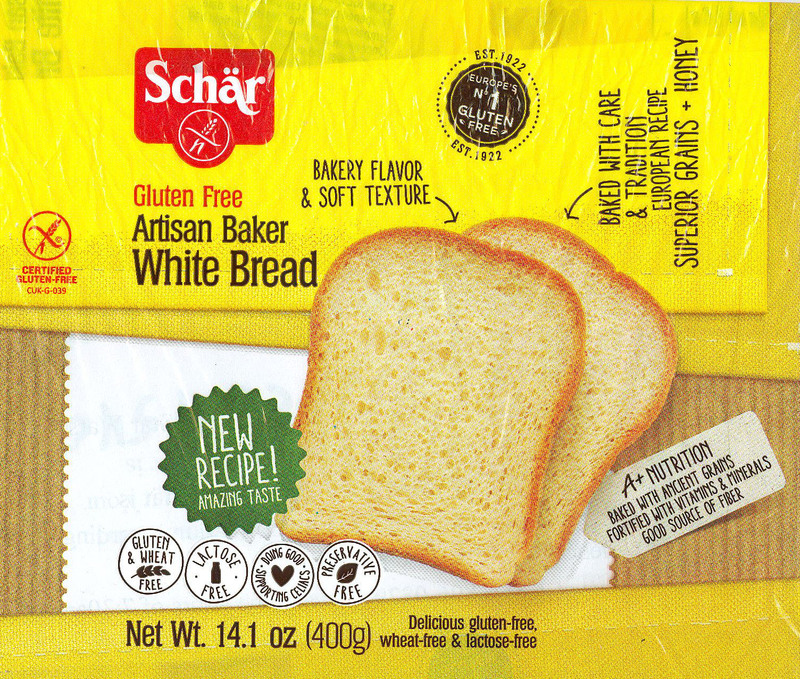 The original recording regarding Schar's Artisan Baker White Bread was done before the data was lost in mid 2016. Schar's is a reliable company for gluten-free and not sure when I went with Pamela's Bread Mix as my consistent bread. May have to try it again. Schar continues to hold a high degree of trust with their Schar Baguette Bread. Joyce keeps this around for sub sandwiches and garlic bread. These breadsticks are about 3/8" in diameter and about 8" long. Crisp, no distinctive taste and no after taste and they just hit our table with more than Italian meals. The house is seldom without at least one package. 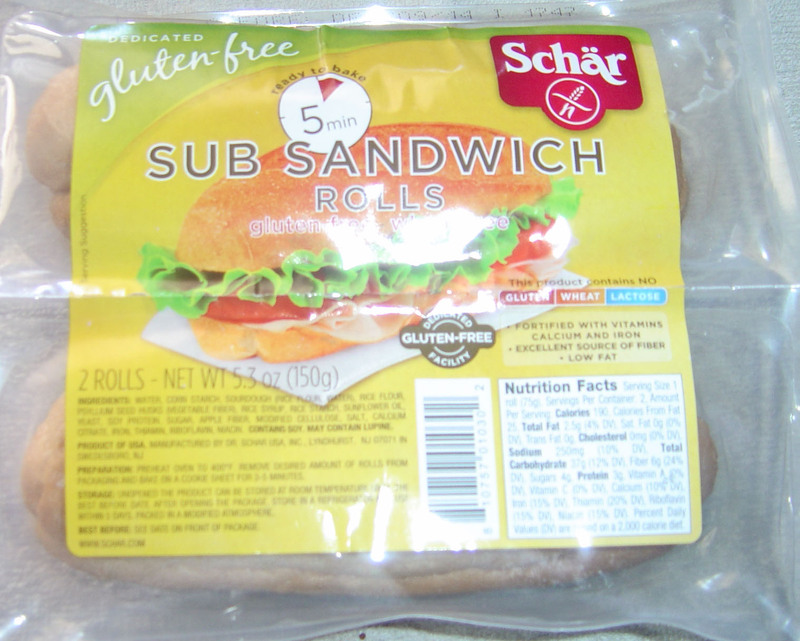 Schar has been a consistent winner in the gluten-free market and their Sub Sandwich Rolls run right up front with the quality and satisfaction known with Schar products. These state "Ready to Bake - 5 minutes" and we followed those instructions. Excellent taste, low density, and they held together well. Nicely sized at about 5-6" long and about 2-2 1/2" in diameter. 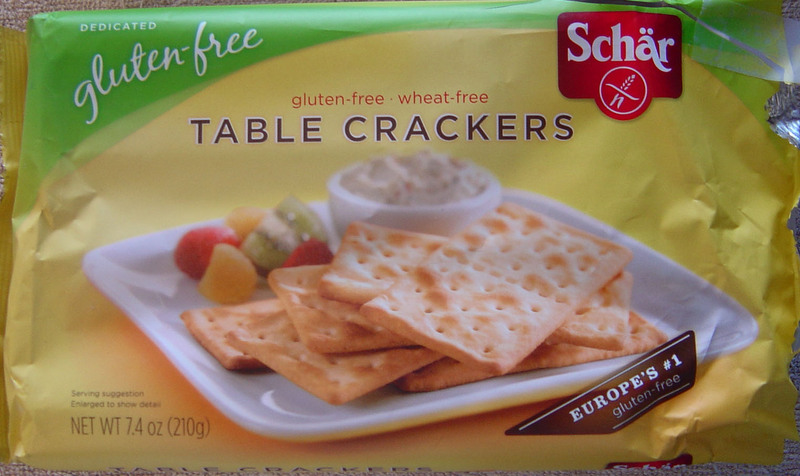 The Schar Table Crackers are standard sized "saltine" crackers. They sit on our table for "just because" and get nibbled through "just because." Nice, small PB&J snacks. They are a bit crumbly but totally manageable. 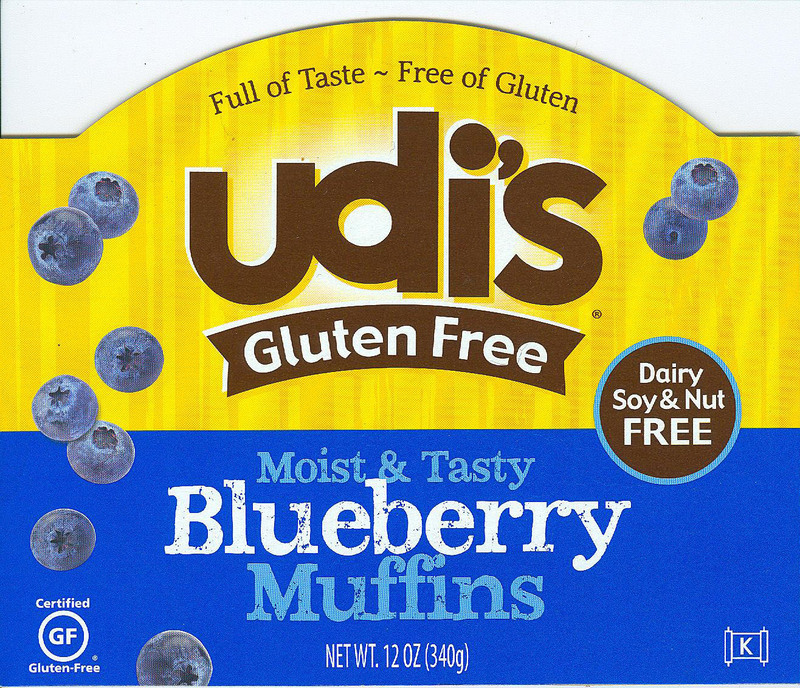 Udi's is a consistent winner in the gluten-free world. I think I have two unfavorable comments in relation to their many many products. 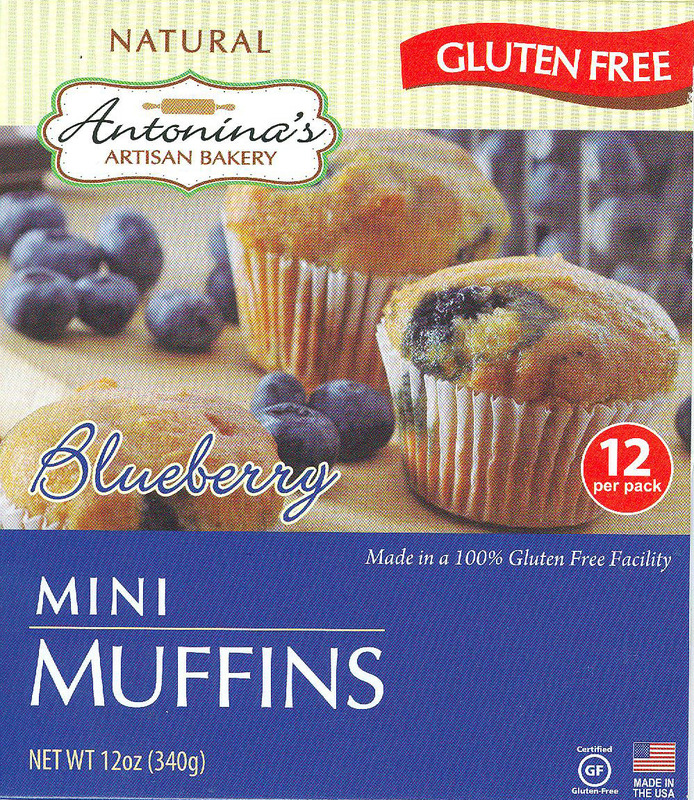 I am not a big fan of muffins or of blueberries. Joyce is a big fan of both. So these come home for me. They are tasty and I eat them. Just would prefer something else. I love cinnamon raisin bread. Joyce brings this home several times a year. It toasts well, is great with breakfast, it is a great afternoon snack, not great with peanut butter and jelly. This was a surprise. The slices in ONE of the loaves was all screwed up. I contacted Udi's and they are very receptive to my comments. This lack of consistency with Udi's is unusual. I owe Udi's an apology for this. These are so common in the house that they were omitted from the listings for a LONG time. Joyce usually warms them in the steam over some water on the stove or in the microwave. The Oster convection oven on Toast makes them a bit hard. My only complaint is the closing device, shown below. I recommend that as these come into the house, the plastic clip be replaced with a wire tie. Same comments as the Udi's Hamburger Buns. I owe Udi's an apology for this. These are so common in the house that they were omitted from the listings for a LONG time. Joyce usually warms them in the steam over some water on the stove or in the microwave. The Oster convection oven on Toast makes them a bit hard. My only complaint is the closing device, shown below. I recommend that as these come into the house, the plastic clip be replaced with a wire tie. This type of closing device is extremely common. The problem I have with it is that falls off larger plastic packaging. I recommend you replace this with a wire tie when you see it. However, many manufacturers print the batch / date information on this clip. Entered or updated July 24, 2016. If you want those big tortillas for large tacos, enchiladas, and burritos, these are these. 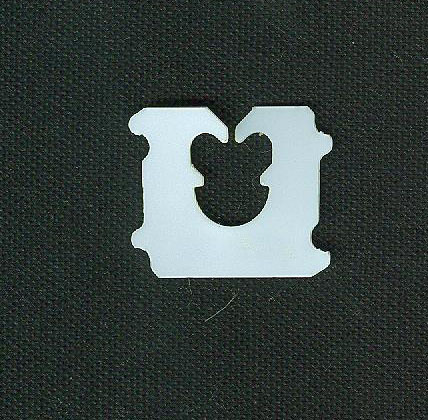 Standard, high quality Udi's product without any issue. They are about 9 1/2" in diameter. Bagels are one of those interesting "food groups." And Udi's pulls in another winner. Toasted in the Oster counter top convection oven as halves and they are ready for butter, cream cheese, or jelly. Entered or updated June 24, 2017. Udi's missed on this one from a couple of angles. First, the muffins are sliced poorly. 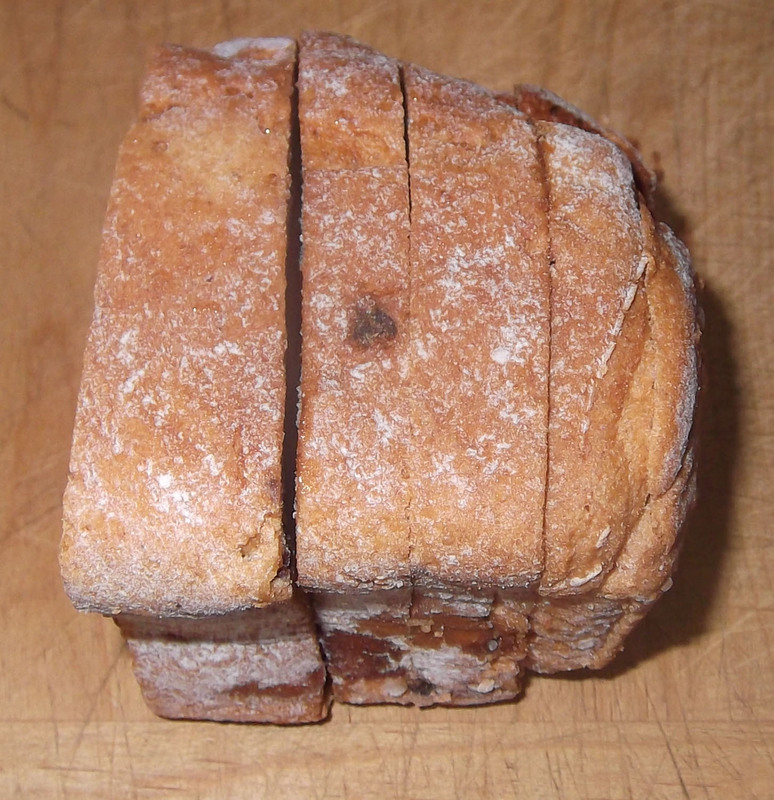 The top slice is 75% ~ 80% of the product, the bottom slice is the remaining 20% to 25% and often falls into numerous small, unusable pieces when the muffin is cut through. Note, when slicing breads use a serrated knife for best results. I have not found a way to cut the muffin or separate it while frozen so I cannot get it in a "slice" toaster. I "toasted" two in the Oster Counter Top Convection Oven on the Toast setting and the centers were still close to frozen when the outer surface was approaching slightly burned. Microwave for 90 seconds seems to be the only solution. Udi's offers no guidance on heating. Once heated, the muffins are totally "crumb-able." They simply like to fall apart. This is a problem with gluten-free products. I asked Joyce not to purchase them again. Entered or updated March 6, 2015. While the amount of gluten-free items on the market increases daily, there are times when you need flour. I used the Betty Crocker Gluten-free All-Purpose Rice Blend Flour to make bread with the stand mixer and a bread pan in the convection oven. Using an Internet recipe, the mix was nice without excessive stickiness. It rose nicely and dropped a bit during baking. Dense is the word with a fairly firm crust. The very center was a bit under baked, still kind of "doughy" but it toasts nicely without an awkward taste. I sliced it very thin, just over 1/4" thick. The bread toasts well and holds its shape without becoming crumbly. No after tastes, no undesirable tastes. With the ability to slice it thin, this may be my bread for a while. Nice work Betty and the Internet recipe guy. Betty Crocker has a hit here for good tasting pancakes and waffles. We have tried some other recipes with it and have been less than totally satisfied. 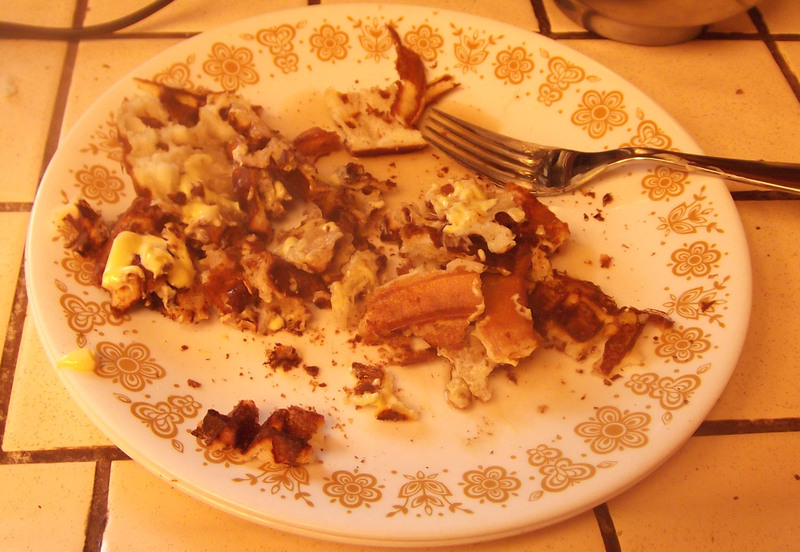 However, as a pancake and waffle mix, 5 stars out of 5 stars. The question to both Betty Crocker and Cuisinart was, "Why did this start happening all at once?" I suspect that Betty Crocker changed the recipe slightly somewhere along the way. 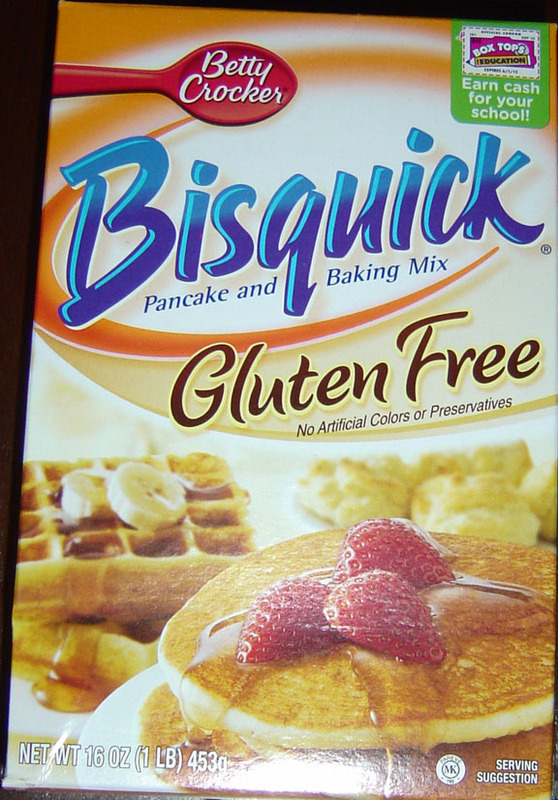 The problem commenced with a new box of Gluten-free Bisquick and continued with all the boxes after that. This started in mid-May. The waffles started sticking to the waffle iron and needed to be pealed or dug out. Regardless of cooking time. Not sure what the cause of this is and I have contacted Betty Crocker and got a "Good luck, have fun, see you later" response. We have a round Cuisinart waffle iron. Cuisinart Internet interaction asks one question at a time and it takes several days to ask the next one. Even though I provided the information earlier. Cuisinart has offered a warranty replacement for $10 in shipping. I need to send the old one back insured - which costs about $15. Total warranty replacement cost for a waffle iron that cost $15 in the first place is about $25. This is not a ding to Cuisinart. It is reality. These are the terms of the warranty and logical. If I had a $250 appliance, not a problem. For a $15 waffle iron? We will buy a new one. One of the suggestions from Betty Crocker or Cuisinart was to spray the iron with a stick-free spray. Tried it. Did not help. Tried adding just a bit more vegetable oil to the mix. Did not help. Bisquick & Cuisinart, sorry, I try to keep things current. Not sure what solved this. The combination of Bisquick and the Cuisinart waffle iron are agreeing on how to make waffles again. Entered or updated December 27, 2014. Not sure where we picked this up, most likely Sprout's. I followed the mixing instructions. The instructions offer an option of oil or soft margarine. Since the margarine was in the cold refrigerator, I used Wesson Oil. The KitchenAid did a good job, the instructions say to finish the kneading process by hand and that was needed just to "polish off the process." I rolled the dough out to about 3/8" thick about 2 1/2 x 6 inches and buns and had two "breadsticks" about four inches long. A bit smaller than the instructions. I baked the four buns and two breadsticks on parchment paper over a cookie sheet in our convection oven at 375, no "convection adjustment," for 30 minutes and it came out nicely done. The crust was that enjoyable "slightly crunchy" with the dough baked completely all the way through. The buns rose and spread nicely during baking. We made sub sandwiches for dinner with leftovers from Christmas. Very nice taste and texture. Competes with the Schar Sub Sandwich Rolls because I control the size, The Schar Sub Sandwich Rolls are just a bit too large for me. 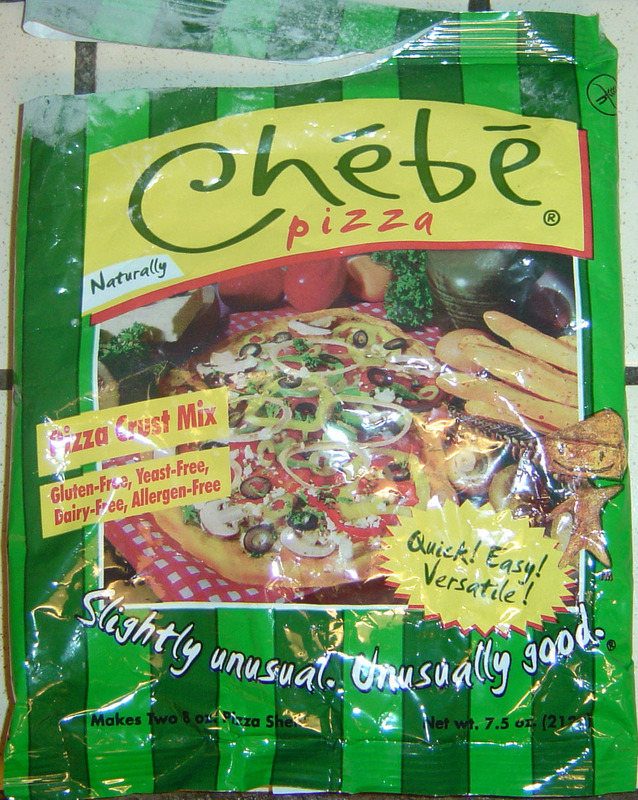 I think the Chebe All-Purpose Mix is going to be the preferred sub sandwich bread source. This stuff is good. How can it be bad if it is almost pure sugar? 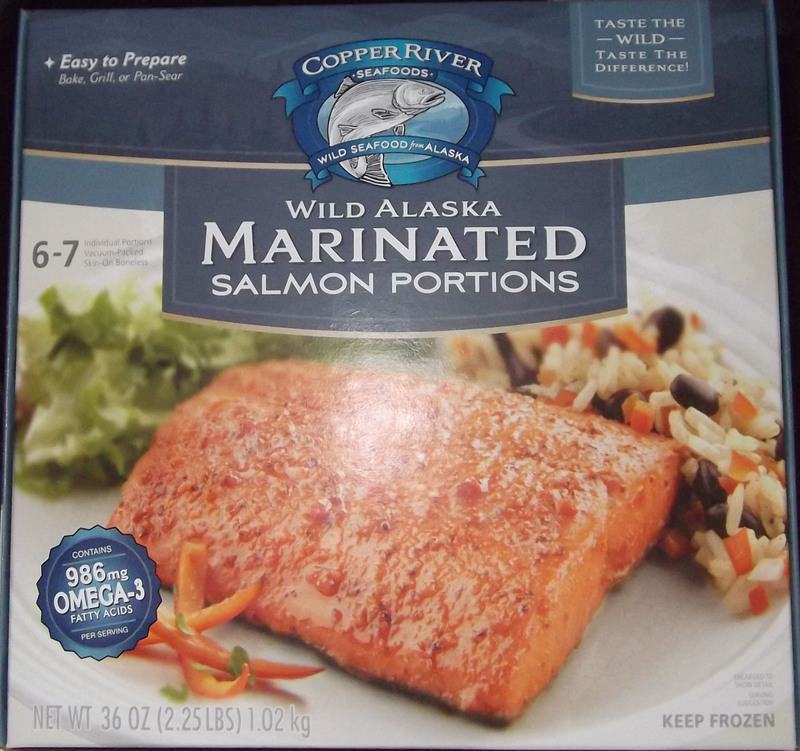 I leave this sealed in the refrigerator and use it on individual pieces at a time. 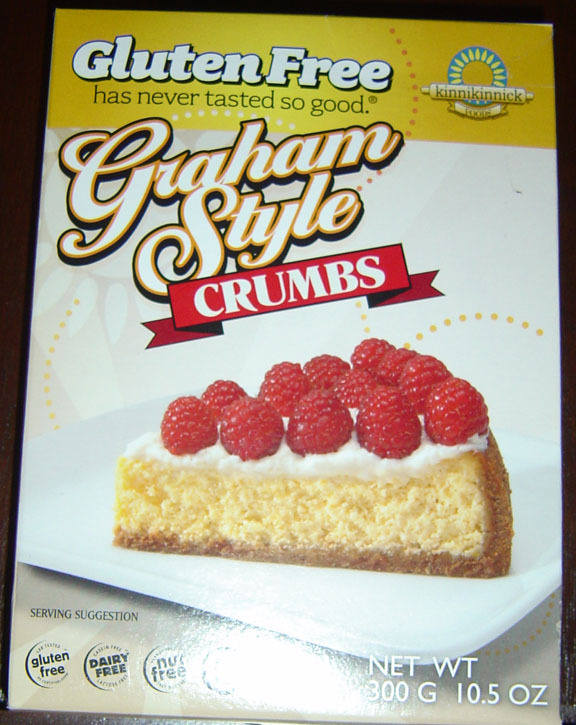 Baking pies which call for a graham cracker crust was a problem since graham crackers contain gluten. 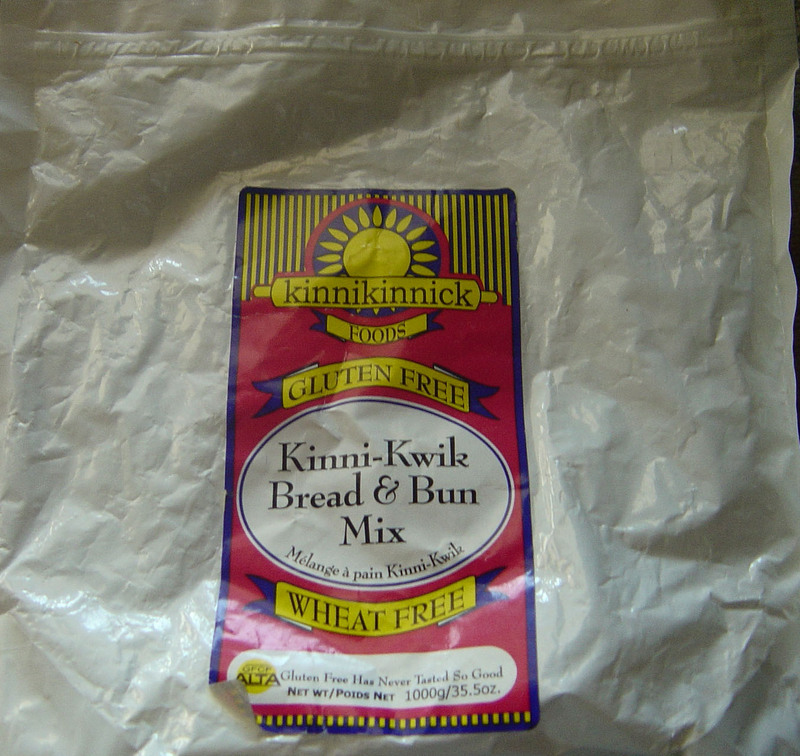 Kinnikinnick has numerous gluten-free products on the market. We tried this one and went back and cleared the shelf of the remaining four boxes. It is 5 stars of 5 stars. And it is not uncommon to sprinkle it on ice cream in a bowl. I have even dumped a handful into a chocolate shake trying for a malt flavor. Not bad. Lee Kum Kee Soy Sauce has been in the house since Joyce found it somewhere around January 2016. Soy is one of those cold be, could not be issues. Lee Kum Kee addresses it. It is soy sauce and goes where it should when it should. McCormick is one of those names that has been in the kitchen for a long long time with trust. 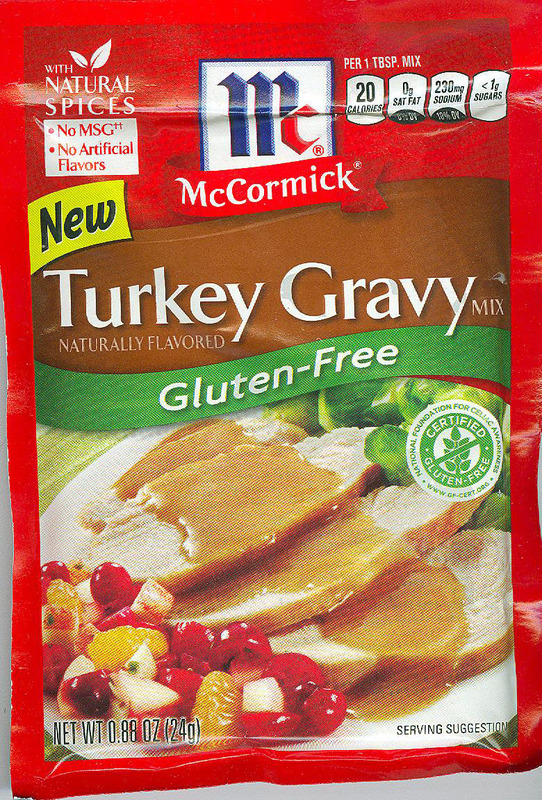 While "gravy" is the process of taking drippings and adding wheat flour to thicken it McCormick has made it gluten-free. Totally acceptable. Turkey is dry. It needs something right off the bat. 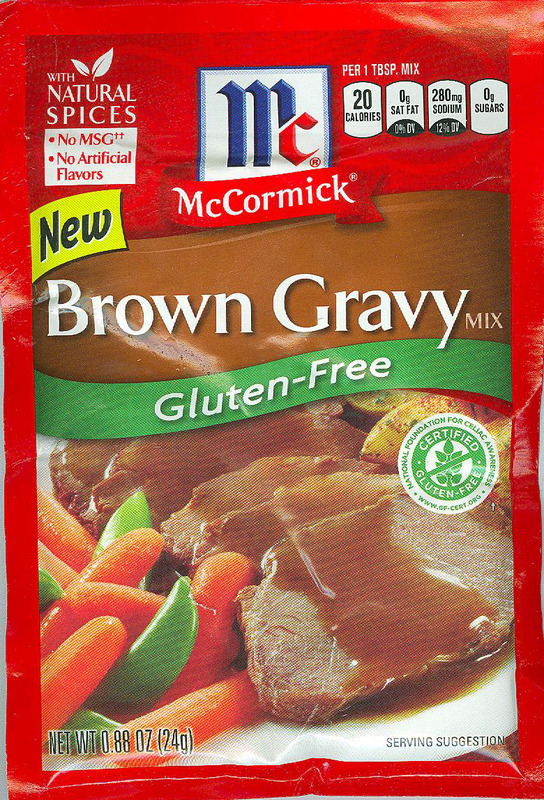 As addressed with McCormick's Brown Gravy, "gravy" is usually the process of taking drippings and adding wheat flour to thicken it. McCormick's Turkey Gravy works very well. Totally acceptable. 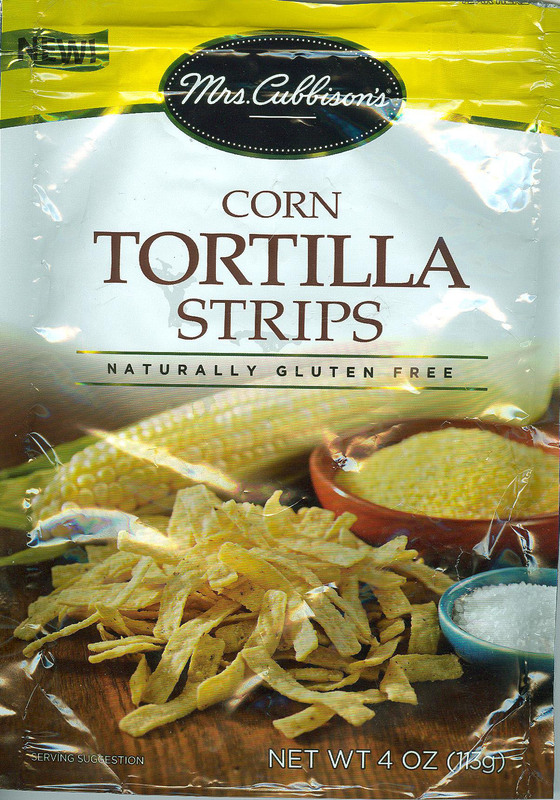 Mrs Cubbison's Corn Tortilla Strips stay around the kitchen for many things. They show up on salads, as nibbles on the side, in baked dishes, and on the top of cooked dishes. Entered or updated November 2018, Post crash. We have used this as "Dressing," prepared outside the bird, rather than "Stuff," prepared inside the bird. Good stuff.